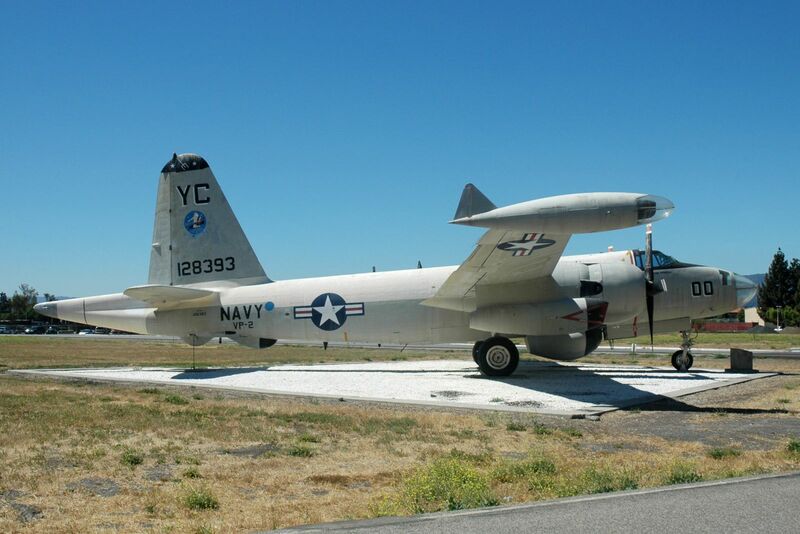 The Alameda Naval Air Museum is home to a unique collection of artifacts and exhibits emphasizing the role of the Alameda Naval Air Station in the defense of our nation and as an integral part of the local community for over 50 years. The historic legacy of the Alameda Naval Air Station will be preserved at the Alameda Naval Air Museum located in the former Air Terminal Building #77 at Alameda Point. The museum will feature archival materials, photographs and stories of the war workers of World War II up to the eventual closing of the base in 1997. This project was made possible by a grant for building upgrades from the Economic Development Agency and the city of Alameda. To date, some $750,000 worth of improvements have been made to Building #77 to meet all code requirements of the City of Alameda. Volunteers established the Alameda Naval Air Museum as an educational community center which will tell the story of it's beginnings in support of the Pacific Fleet in World War II and it's subsequent decades of service to the nation during Korea, Vietnam and Desert Storm. The purpose of the museum is to preserve for the benefit and inspiration of future generations and to leave a historic legacy. Society and industry were changed forever by the sweeping impacts of the World War II build-up. For the first time, men, women and minorities worked together side by side. Services such as health insurance and child care were initiated in industry to improve worker's health, productivity and retention. Labor and government worked together to provide to the fleet overhauled aircraft and engines achieving unheard of production records. The museum volunteers look forward to hosting many visits of school children so they can learn about Naval Aviation history and the valuable contributions made by the many generations of workers during the last half of the 20th Century. More than 250 skilled trades came together at NAS Alameda to create lasting records of top workmanship and professionalism. 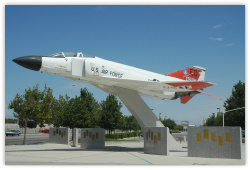 There are two "Gate Guard" display aircraft located on the site. 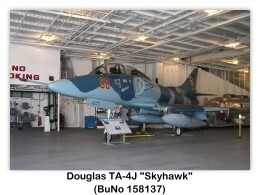 A Douglas A-4B "Skyhawk" and a LTV A-7E "Corsair II." 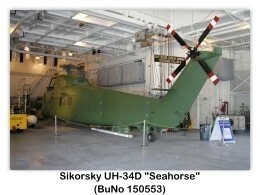 Both aircraft are mounted on display pedestals. The aircraft carrier USS HORNET is a national treasure, having participated in two of the greatest events of the 20th century -- World War II and the Apollo 11 manned space mission. Now peacefully moored at historic Alameda Point on San Francisco Bay, the USS HORNET is a timeless memorial to those who defended our American values and to those who have pursued America's technological advancements. 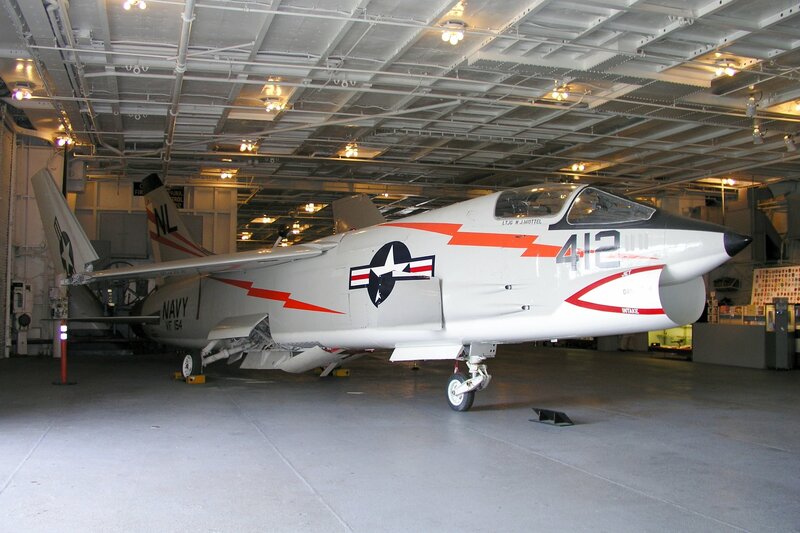 Whether its mission was projecting military might in times of war or supporting technological achievements in space exploration, the USS HORNET has continually maintained "A Heritage of Excellence." 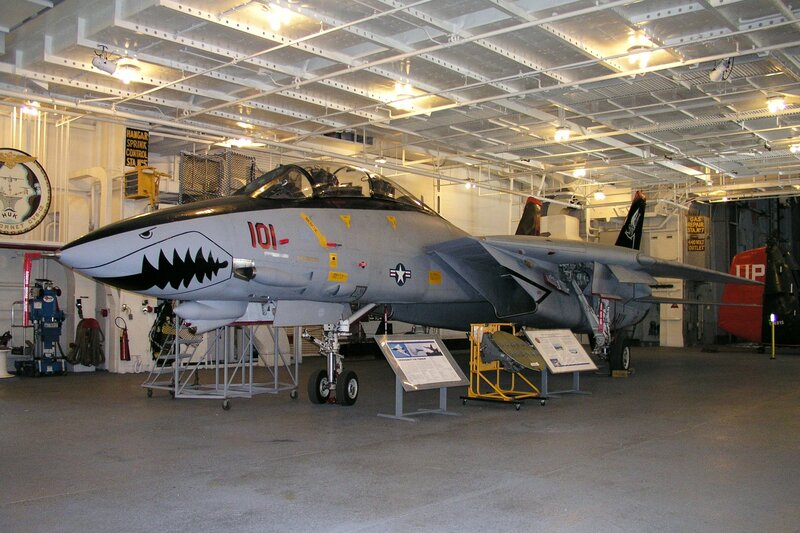 The USS HORNET MUSEUM proudly enters the new millennium with the goal of educating and inspiring both young and old with respect to the challenges of the past and possibilities for the future. The museum is open seven days a week. All tours, whether self-guided or docent-led, involve climbing steep stairways, so comfortable clothing and shoes with nonskid soles are recommended. To ensure a pleasant visit, other tour tips are available for review. 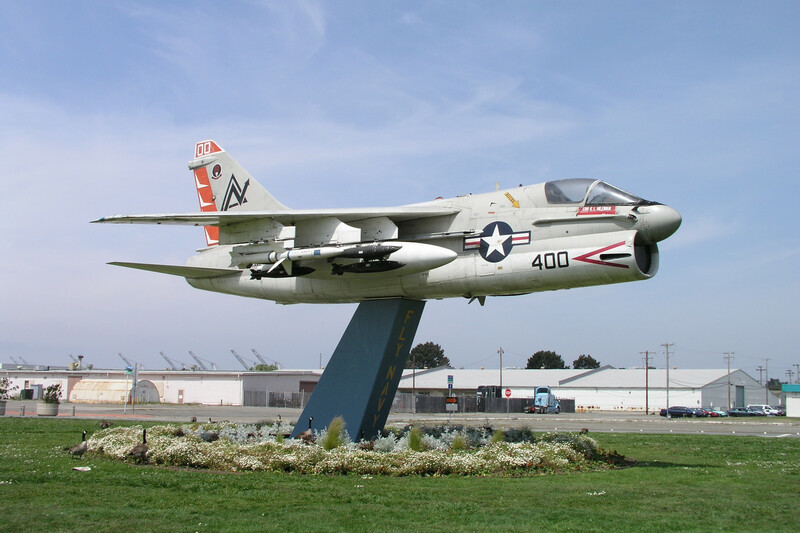 The museum is located less than 30 minutes from downtown San Francisco at the former Alameda Naval Air Station, in Alameda, California. Located at 951 S. State College Boulevard, this 24.6-acre park is named after the creator of the "Boysenberry," Mr. Rudy Boysen. 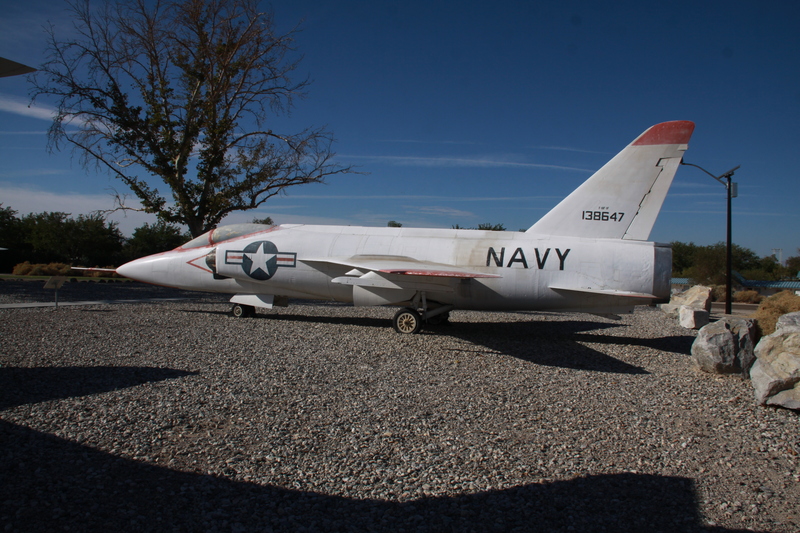 Park highlights include a permanently grounded U.S. Navy Cougar jet airplane, circa 1954. Adjacent to the park is the Anaheim Tennis Center, with twelve lighted courts open to the public. For Tennis Center information call 714-991-9090. 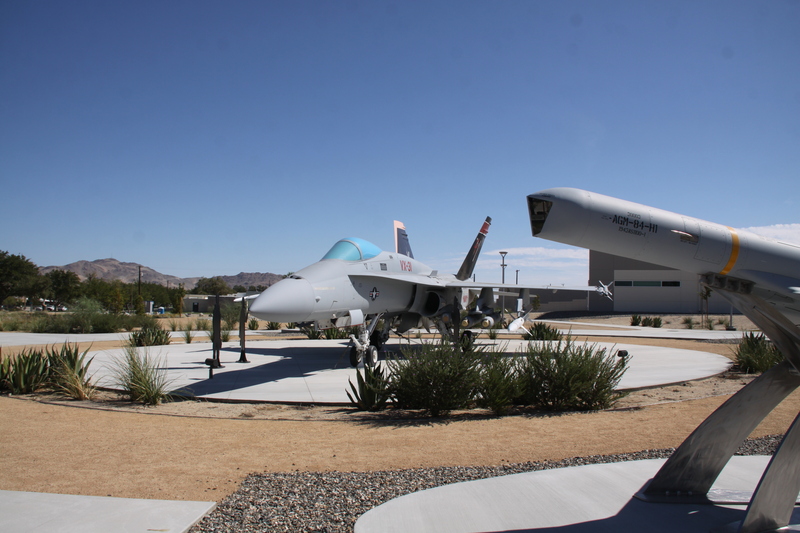 APPLE VALLEY AIRPORT is the gem of the county's high desert, located in the town of Apple Valley — an area which has seen explosive growth in the last decade. 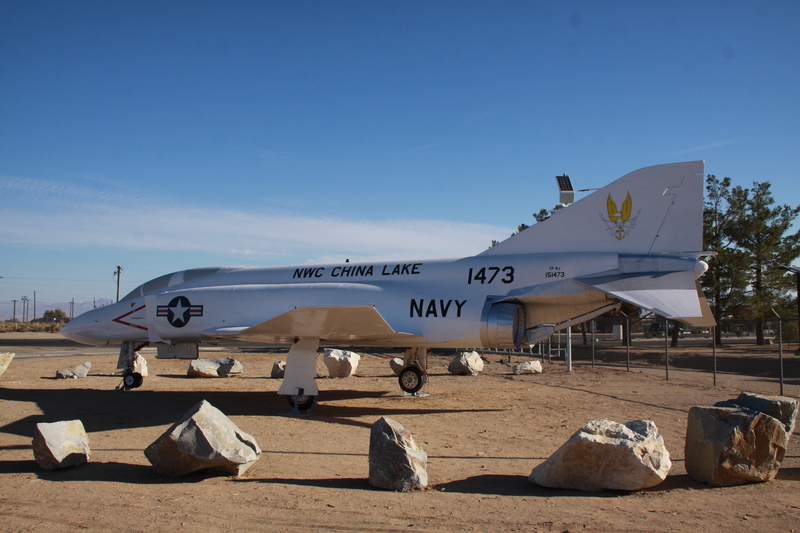 Built in 1970, it is the gateway to the Victor Valley region and offers a year-round VFR. Flying services available at Apple Valley Airport include fuel, food, maintenance, charters, rentals, and flight training. The Lewis Center for Educational Research, formerly the Apple Valley Science and Technology Center, was conceptualized by Rick Piercy, a former kindergarten teacher. Since opening in 1990, the center has hosted more than 100,000 students, teachers and parents participating in outreach programs, clubs and other educational activities. The Lewis Center continues to provide hands-on instructional programs to students and the community. 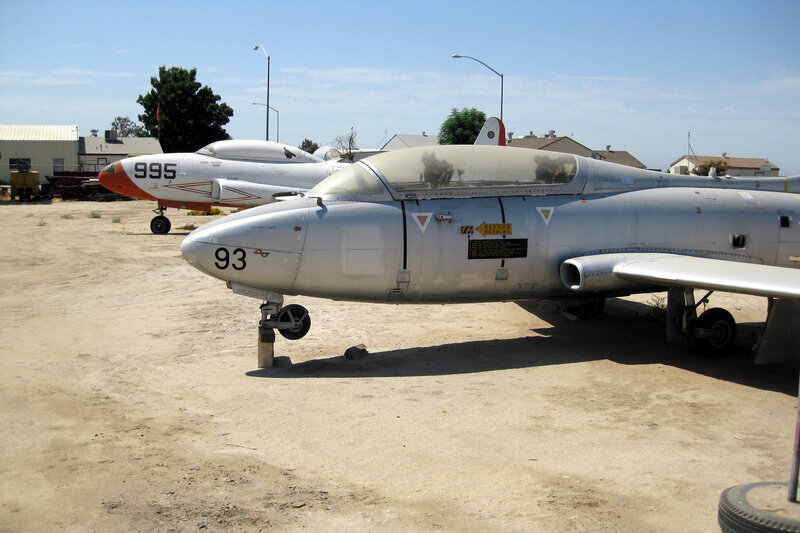 When the closure of Castle Air Force Base was announced in 1994, a group of dedicated enthusiasts in the Atwater-Merced area formed a non-profit organization called the Castle Air Museum Foundation, Inc. Their purpose was to assume custody of the collection of aircraft. It was their dream to build a museum in which faithfully restored historic aircraft could be exhibited for public enjoyment. Today that dream is a reality! 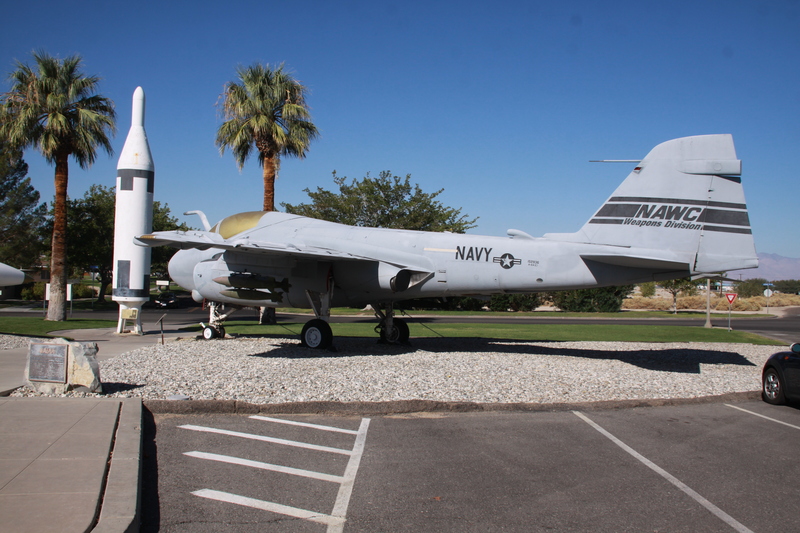 Presently the museum has 49 aircraft on display ranging from a 1937 Douglas B-18 to a 1992 Grumman F-14D "Tomcat including" rare aircraft such as the Lockheed SR-71A "Blackbird," Consolidated B-24 "Liberator" and the Convair RB-36. 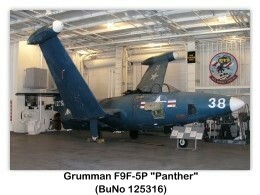 They are representative of aircraft that served from World War II, Korea, Vietnam, the Cold War to the present conflicts. All restored and maintained by their devoted volunteer staff, these aircraft are a tribute to the men and women who designed, built, maintained or flew them. We need high resolution photos of the aircraft on display at this location. We also need an up-to-date listing of all of the aircraft … make/model, serial or N-number, etc … Your help would be appreciated. The Minter Field Air Museum is housed in the original fire station, built in 1941. The base was a major basic training facility where nearly 12,000 pilots received basic training in BT-13s, UC-78s, AT-6s, P-38s and B-25s. 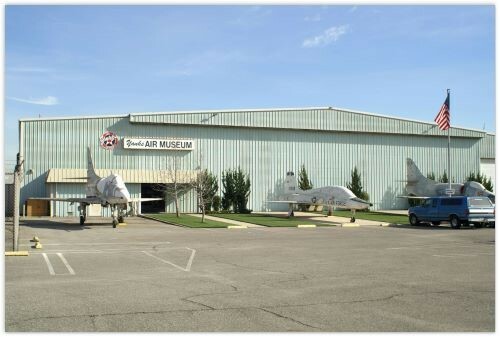 The Minter Field Air Museum houses artifacts and photographs of the men and women who were stationed at this location. Artifacts include a period fire truck, 1944 Ford jeep, military uniforms, radio equipment, Echelons (Class Books), Snap Roll Newsletters, and hundreds of photographs. Banning Municipal Airport sits at a 2,200-foot elevation in the midst of the San Gorgonio Pass of central Riverside County. The pass separates the 10,000-foot-high ranges of the San Bernardino Mountains to the north and the San Jacinto Mountains to the south as well as the low lands of the Los Angeles Basin to the west and the Coachella Valley to the east. This location makes the airport a highly important component of the regional airport system. 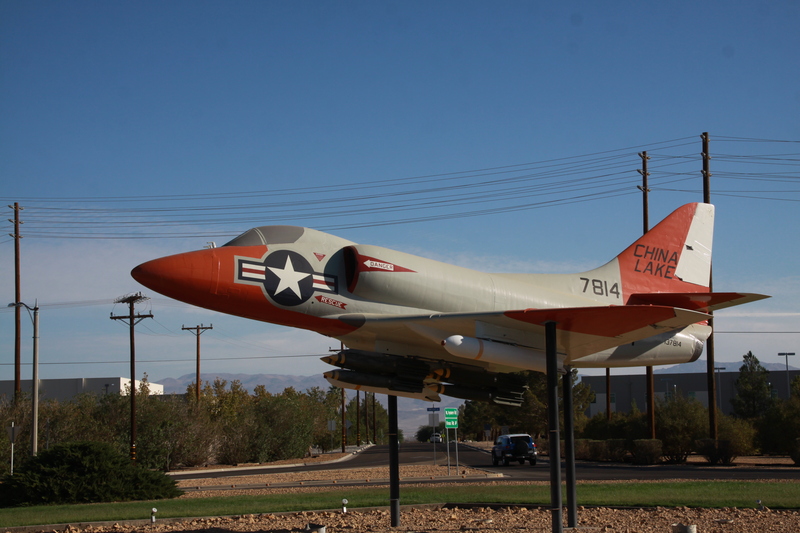 Additionally, the airport is home to some 75 aircraft belonging to businesses and residents of Banning, Beaumont, and other nearby communities. The airport consists of a single east/west runway nearly 5,000 feet in length. Aircraft operate under visual procedures — no instrument approach procedures have been created. Exhibit BN-1 describes other major features of the airport. The airport layout plan (Exhibit BN-2) was last updated in 1990 and does not show the modification to the runway's eastern end which resulted in a minor reduction of the length. No major airfield improvements are indicated in the Airport Master Plan adopted by the city in 1989. The volume of aircraft operations at Banning Municipal Airport is low relative to the number of based aircraft. The surrounding terrain and often strong winds limit flight training activity. McDonnell Douglas F-4D-31-MC "Phantom II"
The Colonel Vernon P. Saxon Jr. Aerospace Museum is located next to the Twenty Mule Team Museum in downtown Boron and serves the public as an educational facility dedicated to preserving flight history and flight research performed over Boron and the surrounding Aerospace Valley. Their further purpose is to provide educational programming for schools and institutions, promote the advancement of aerospace engineering, provide public exhibitions of aeronautical materials and memorabilia, and to serve as a scholarly resource for higher education. 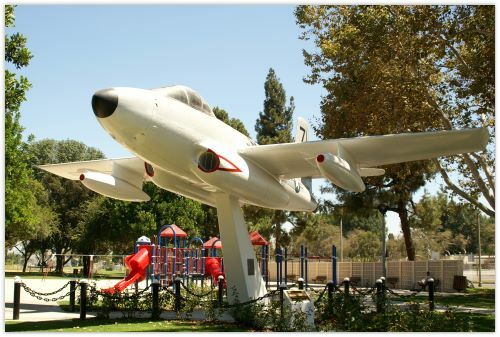 Located adjacent to the George Izay Park, the Burbank Historical Society was founded in 1973 by a group of individuals who were committed to collecting and preserving the rich history of the community of Burbank. Incorporated in 1975, the Society operates the Gordon R. Howard Museum which includes an 1887 Victorian house, a memorabilia building including a Lockheed Aviation display and other historical artifacts, a vintage vehicle building, a salon and the Ray Sence addition in which 19th century era rooms are shown. 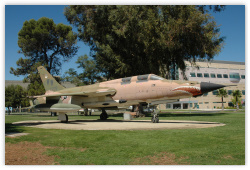 Adjacent to the Museum is a Lockheed F-104D-15-LO ''Starfighter'' (AF 57-1334). 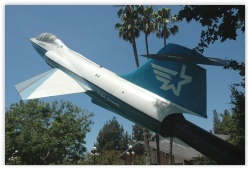 Burbank Aviation Museum, "The Portal of the Folded Wings"
The Portal of the Folded Wings is located just south of the Burbank airport in beautiful Valhalla Memorial Park. 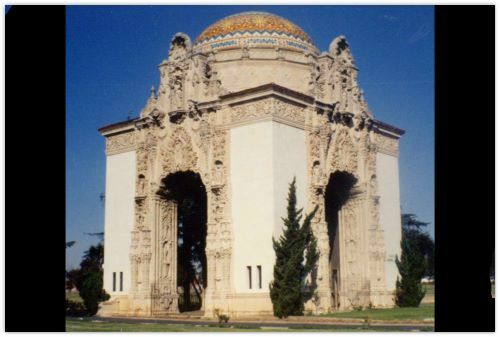 Originally built in 1924, (6 years before United Airport/Burbank was built) it was once the grand entrance to the memorial park. On December 17, 1953 (the 50th anniversary of powered flight) the Portal was dedicated as a "Shrine to Aviation" and is now listed on the National Register of Historic Places. 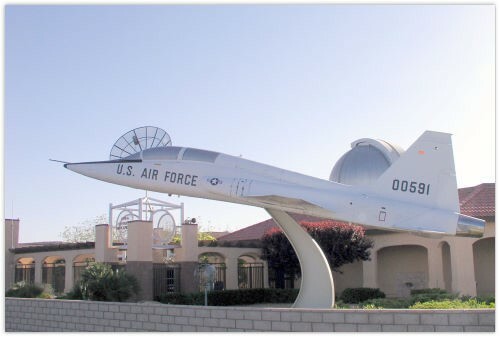 The Portal is a temporary home to the Burbank Aviation Museum. Docents are there on Sundays from 1 pm until 3 pm, when the weather is not cold or rainy. You can visit the structure and resting places daily during normal business hours. Docents are currently working on a 21' long orbiter monument, to be placed in front of the Portal building. This new attraction will honor those who flew into space and particularly those who made the supreme sacrifice in that effort. "The Portal of the Folded Wings"
Producers Air Force has replica aircraft and cockpit mockups for use in the motion picture and broadcast industry. 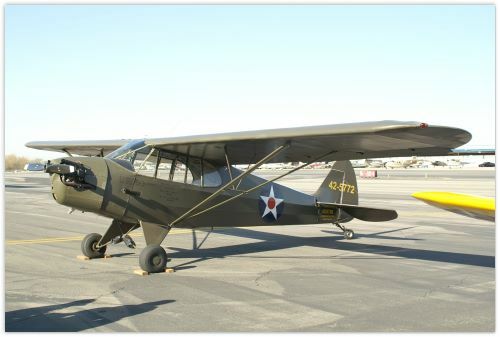 The Constellation Historical Society is a non-profit organization dedicated to the preservation of aviation history. 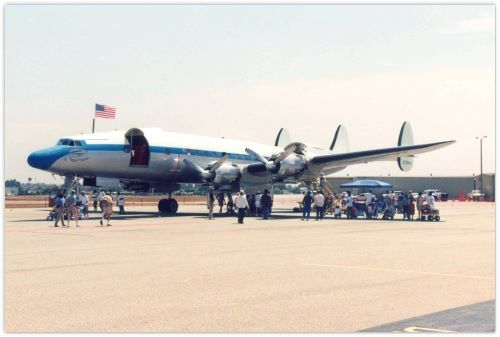 N73544 is a Lockheed C-121C Super Constellation that was delivered to the U.S. Air Force in 1955, and has been privately owned by D. Benny Younesi since 1984. 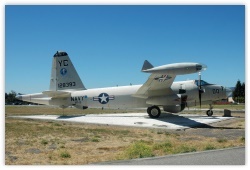 Only one of five remaining flyable Constellations in the world, N73544 resides at the Camarillo, California Airport. ** In flyable condition since 1994, we have been flying a limited airshow schedule to very receptive crowds. With ongoing refurbishing, we hope to increase the number of airshows that we can attend every year. Curtiss C-46F "Commando" (N53594) "China Doll"
The Chico Air Museum became a reality in 2004. 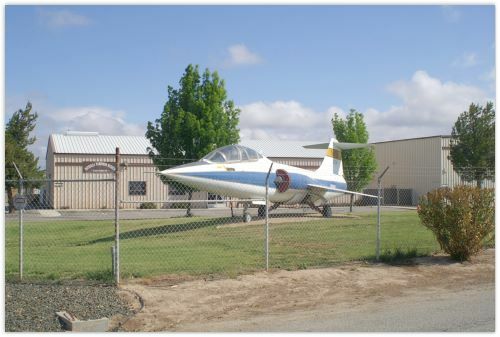 Located on the flightline of the Chico Municipal Airport (Northern California), the Museum consists of an outdoor aircraft display, as well as an indoor display of interesting and historic aviation artifacts. The Museum is open every Saturday from 10 am until 4 pm, or by appointment. 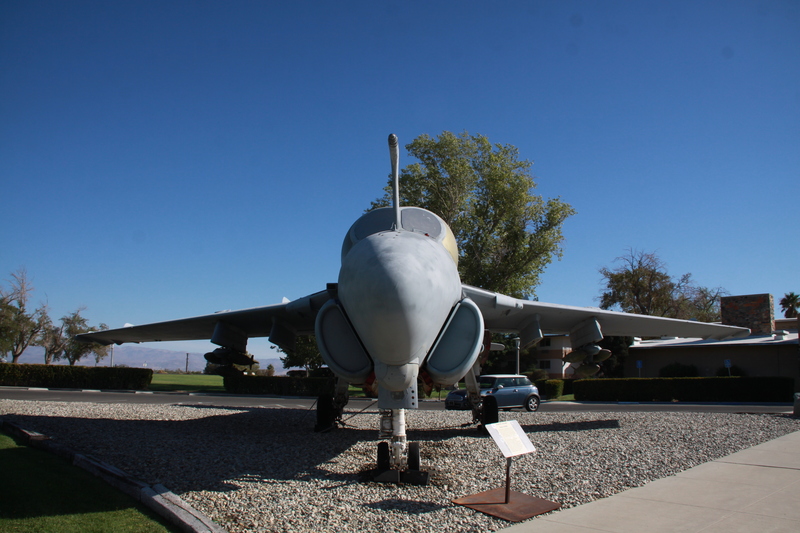 The Chico Air Museum was formed to commemorate the historic role played by local pilots, servicemen and women, aircraft pioneers and aviation legends. It is the intent of the Museum Staff and Volunteers the "Celebrate Aviation History" and continue to document and preserve the many artifacts, aircraft, and stories of the men and women who contributed to the colorful history. 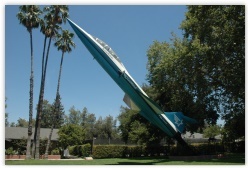 The Museum consists of Historic Aircraft in the outdoor display (see links at right for photos) and a growing indoor Museum featuring pictures from notable aviators such as Thaddeus Kearns, Jimmy Doolitle, John MacCready, Bud Allen, and artifacts from the 1945 "Chico B-29" crash site. We need high resolution photos of the aircraft on display at this location. We also need an up-to-date listing of all of the aircraft … make/model, serial or N-number, etc … Your help would be appreciated. 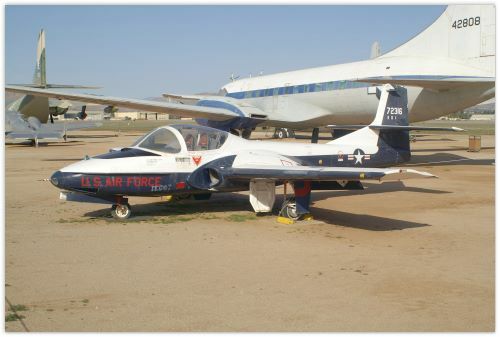 Founded in 1957, The Air Museum Planes of Fame, a nonprofit 501(c)(3) organization, is dedicated to preserving aviation history for the benefit of future generations. 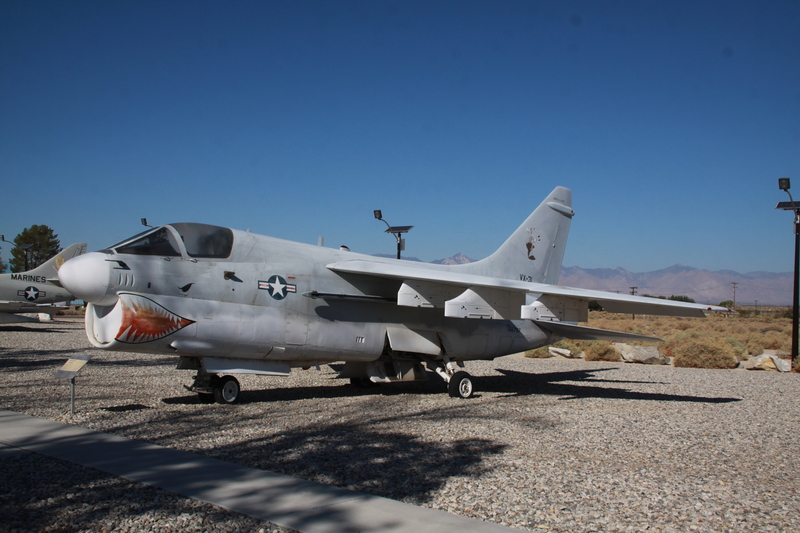 Currently, The Air Museum houses over 150 aircraft at its two locations, the main facility at Chino Airport in California and a satellite museum near the Grand Canyon at Valle Airport in Arizona. 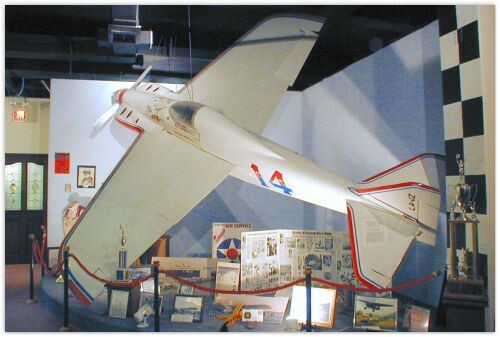 The Air Museum displays aircraft spanning the history of manned flight, from a replica of the Chanute Hang Glider of 1896, through modern space flight, and includes numerous milestone achieving test and research flight vehicles. 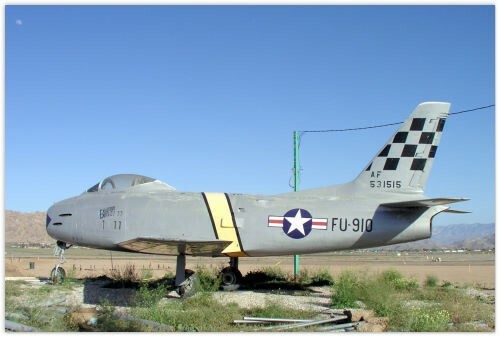 The Air Museum is a nonprofit organization dedicated to collecting, restoring, displaying, and preserving aircraft and memorabilia for the educational benefit of current and future generations. 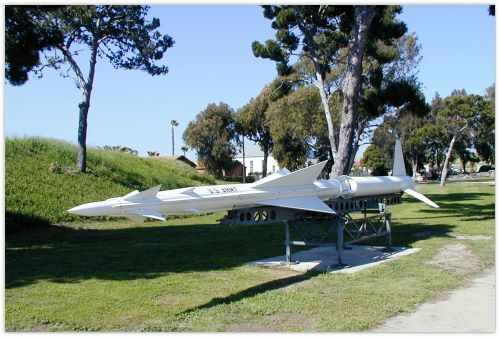 Fiesler Fi-103/VSG-76 (V-1) "Buzz Bomb"
The present location of The Yanks Air Museum is the Chino Airport in Chino, California where it has enjoyed steady growth over the past two decades. Located some 50 miles southeast of downtown Los Angeles, the museum is conveniently located in the nations largest metroplex, providing a huge local audience. 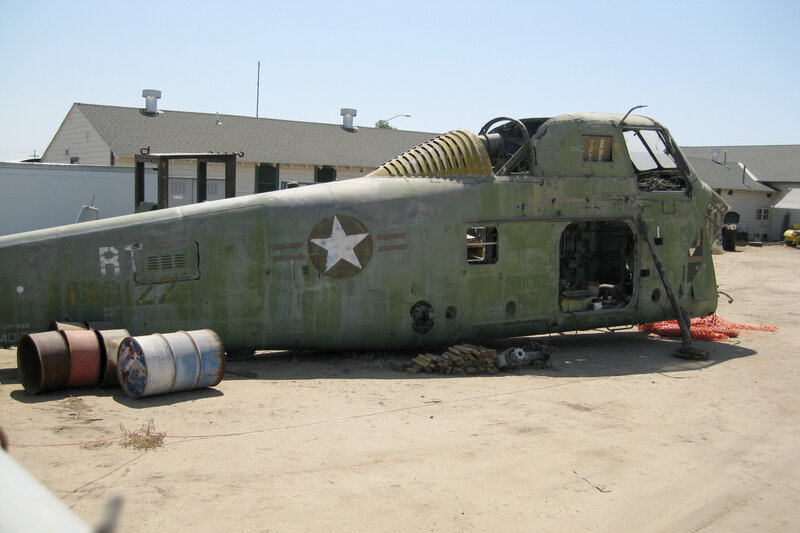 Additionally, Chino Airport is well recognized as one of the centers of aircraft restoration and preservation with several different companies that provide those services co-located on the airport property. The museum aircraft have been restored in-house with great attention to detail so that both flying and static aircraft are considered exemplary examples of their type. Great care and effort has been made to conform to the original manufacturer's specifications in all restoration projects. The existing museum campus extends over 5½ acres and includes 76,600 square feet of display, restoration, and storage buildings with additional open-air storage areas. 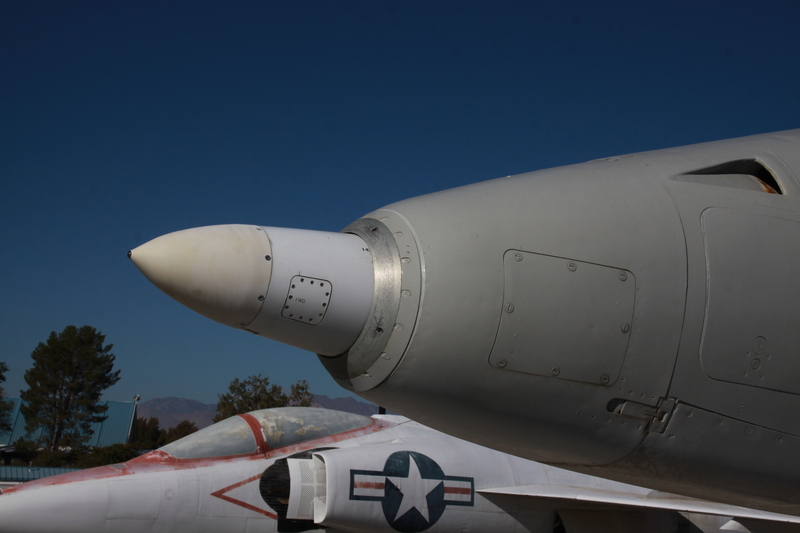 Steady growth of the museum has inspired future plans to expand the Chino facility to accommodate additional aircraft, artifacts and a multi-media education center. 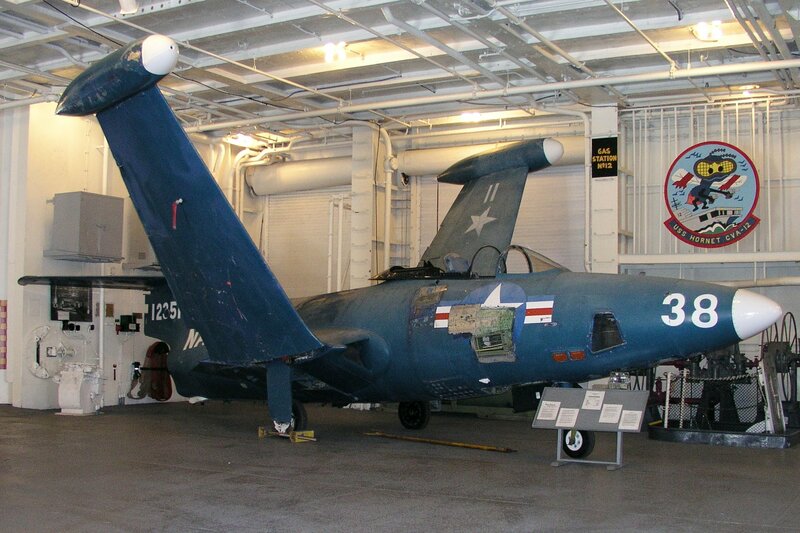 The following is a listing of the aircraft currently belonging to The Yanks Air Museum and their current status as of January 2005. Numbers in parenthesis indicate the number of each type in the collection. 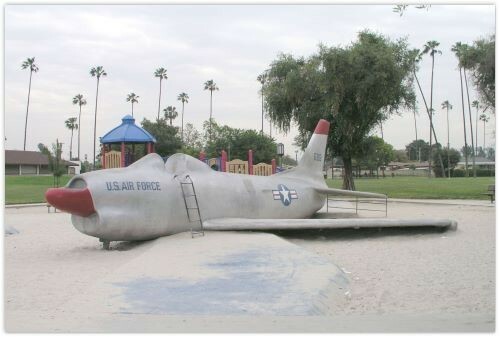 Lion's Park, located at 567 W. 18th Street, Costa Mesa, California has a Grumman F9F-4 "Panther" (BuNo 125180) on displayed in the middle of a children's sandbox. 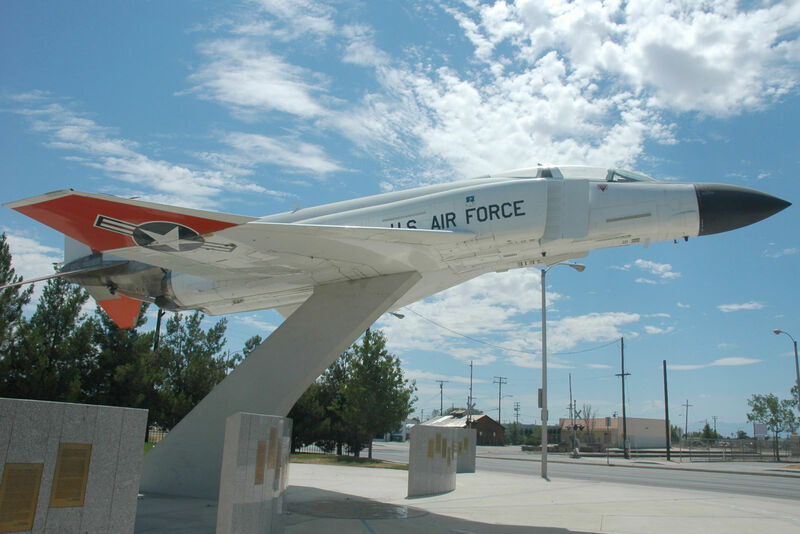 Edwards Air Force Base is indeed the Birthplace of Supersonic Flight, for it was here (then Muroc Air Force Base) in October 1947 that Captain Charles E. "Chuck" Yeager blasted through the sound barrier in the Bell X-1 and ushered in the supersonic age. Yeager was soon followed by other courageous men who would dare to fly into unexplored regions in that laboratory in the sky above the high desert. There, for the first time, they would pilot their craft past Mach 2, 3, 4, 5, and 6, and up above 100, 200, 300 thousand feet-and into near space. For almost six decades, Edwards has been the world's premier flight testing and flight research center. 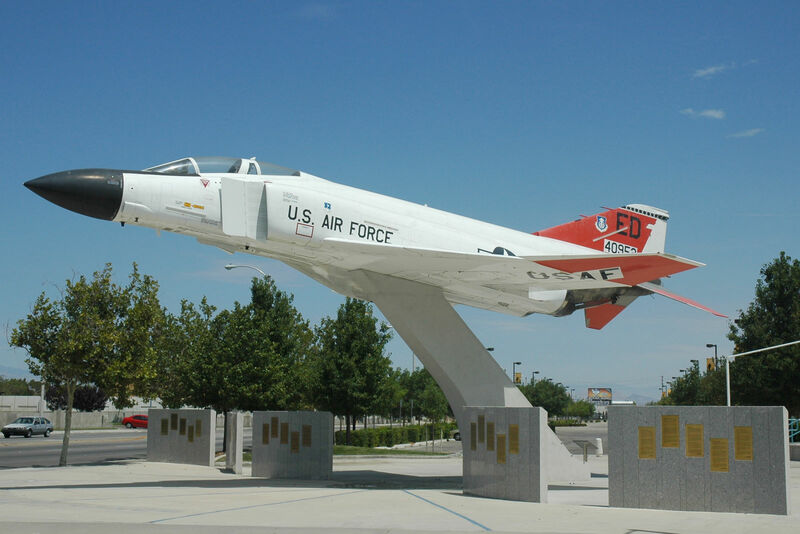 Much of this exciting history is now preserved and displayed in the Air Force Flight Test Center (AFFTC) Museum. The original museum opened in 1994 and hosted over 65,000 visitors before moving to a new facility in July 2000. The new 12,000 sq. 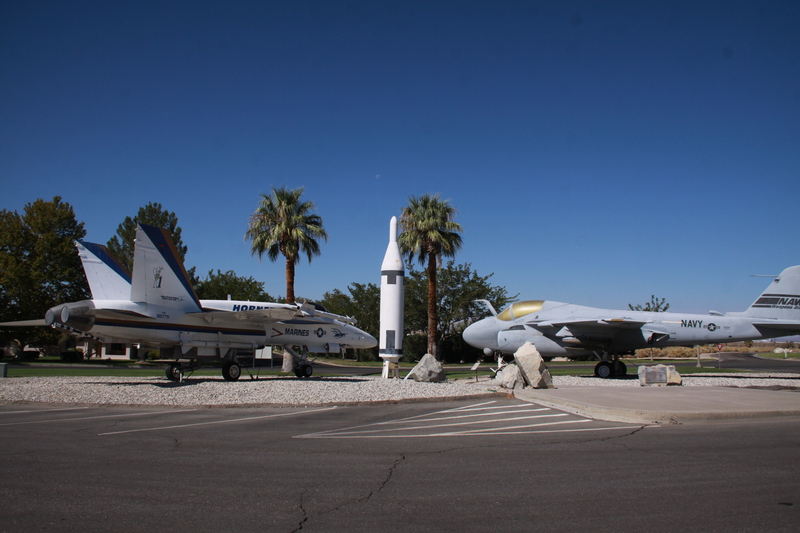 ft. museum houses exhibits covering such diverse subjects as the formation of the ancient lakebed, early home steading, the first military uses of Edwards, flight testing during WWII, breaking the sound barrier, aviation records set at Edwards, testing the X-15, and the story of Glen Edwards, for whom the base was named. 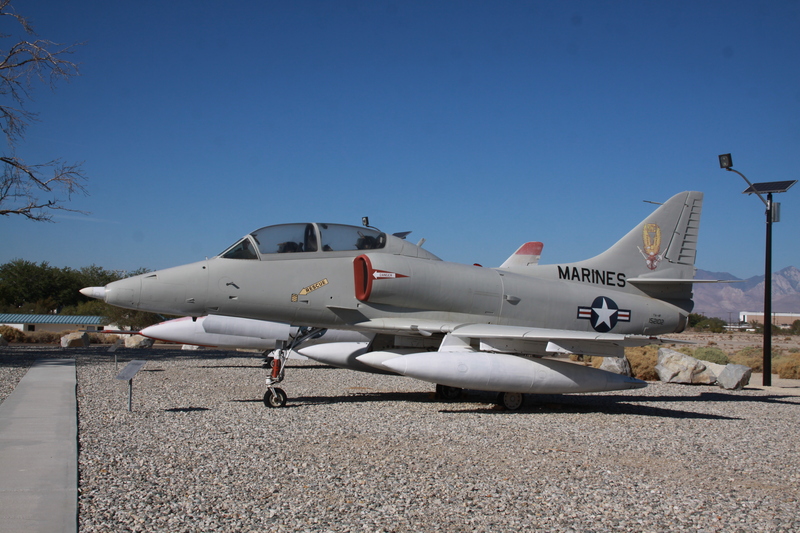 Other exhibits include aircraft hardware, personal memorabilia, aviation fine art and photography, and models. A museum centerpiece is the historical mural "Golden Age of Flight Test," a 10 foot by 20 foot painting by noted aviation artist Mike Machat. 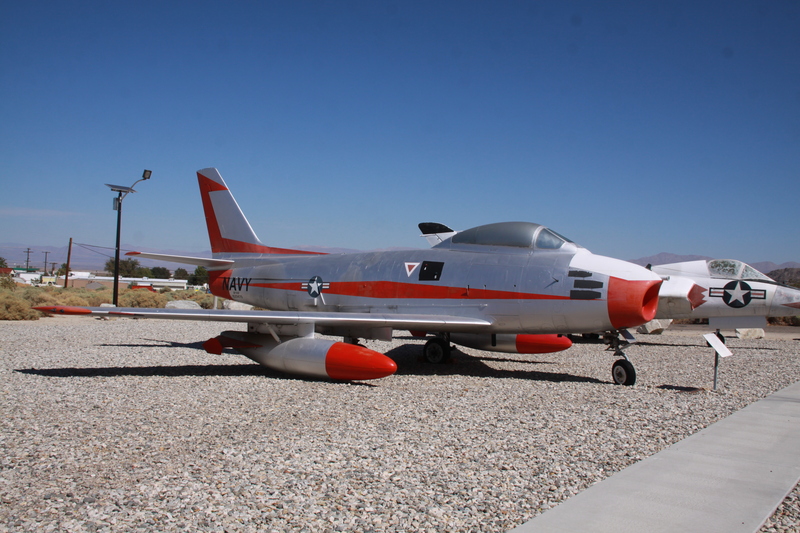 Aircraft on display inside the museum building include the F-16B, an NA-37B, an AQM-34 Firebee drone, the X-25B concept demonstrator, and a full-scale replica of the Bell X-1. Propulsion exhibits include the YJ93 which powered the massive XB-70, and rocket engines used on the X-1, D-558-II, X-15, and the NF-104. Museum visitors can learn about the past, present, and future of flight testing in the museum's theater, and souvenirs can be purchased in the small, but well-stocked gift shop. 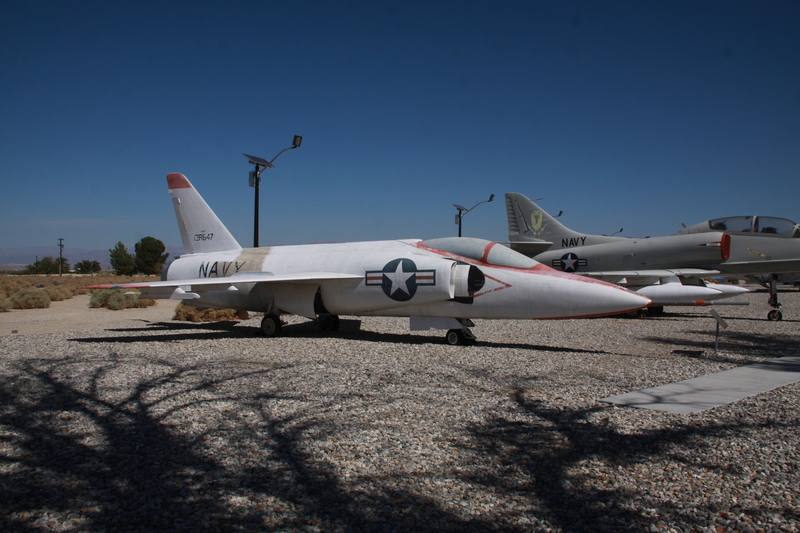 Currently, 16 of the museum's aircraft are displayed outdoors in the museum's airpark. 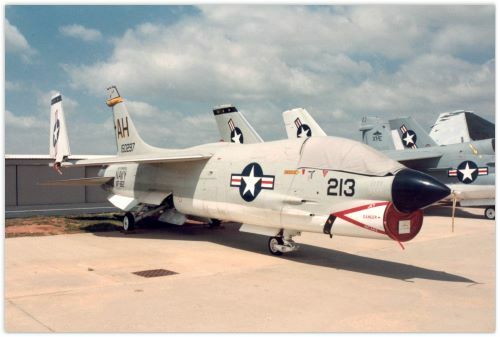 They include the B-52D, CH-3E, F-84F, F-101B, F-104A, F-105D, F-111A, H-34, NF-4C, SR-71A, T-28B, T-33, T-39, UC 45, YA-7D, and Gloster Meteor. 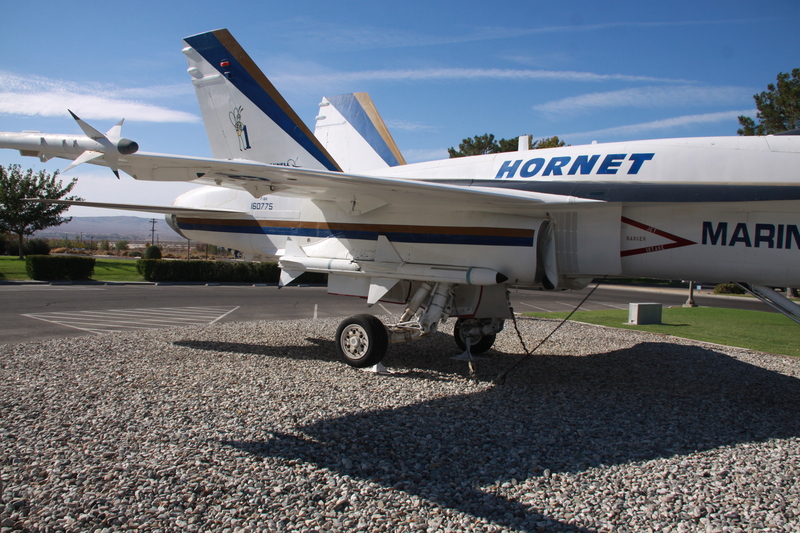 Another seven are mounted on pedestals around the base, including the F-16B, F-86E, F-104A, NF-104A, P-59B, T-33A, and T-38A. Eventually, museum visitors will view a number of other rare aircraft on display. 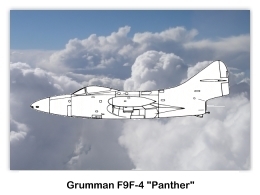 These include the first T-46; prototypes of the A-7F, A 9, A-10B, F-4E, and F-94; one of only two PA-48 Enforcers; the first production C-141; and a number of other one-of-a-kind aircraft. The museum is open to the public Tuesday through Saturday, 9 a.m. to 5 p.m. and is closed Sunday, Monday, and federal holidays. Admission is free. 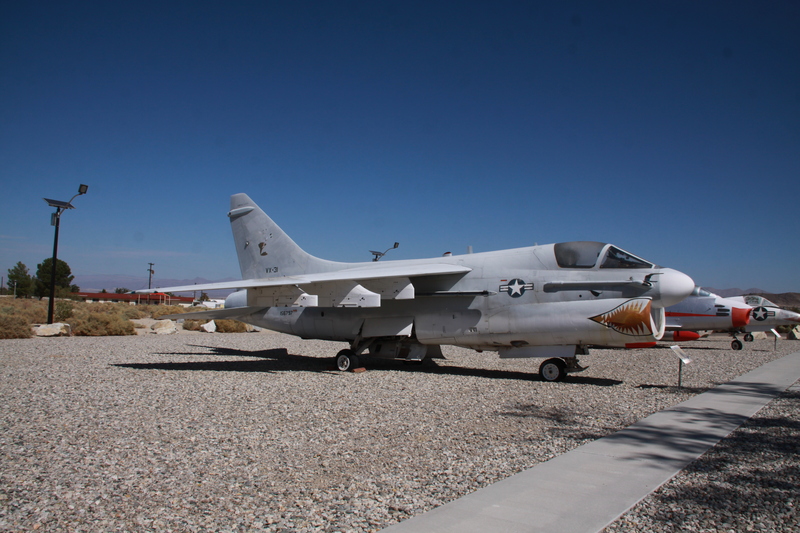 Currently, due to security restrictions, the museum is only open to those individuals with official business on Edwards AFB or individuals attending a tour through public affairs. Dryden Flight Research Center is NASA's premier flight research and test organization for the validation of high-risk, pioneering aerospace technology, space exploration concepts, and the conduct of science mission observations. 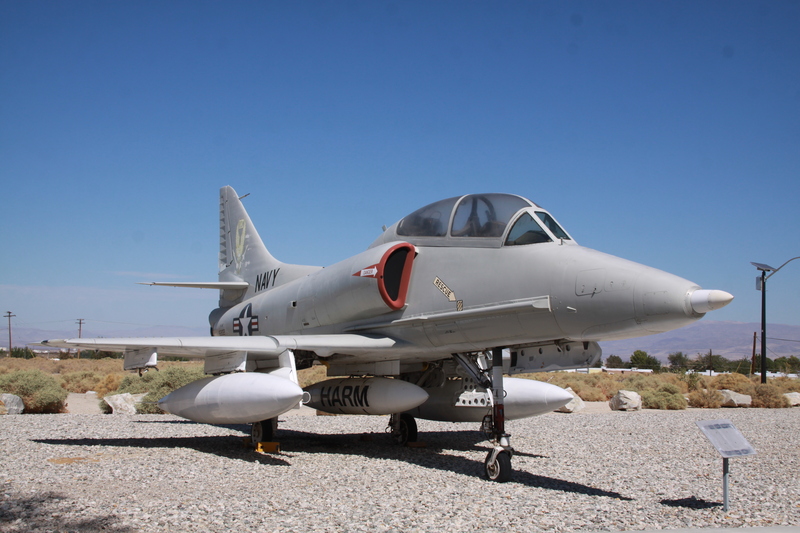 Located at Edwards, California, in the western Mojave Desert, Dryden is uniquely situated to take advantage of the excellent year-round flying weather, remote area, and visibility to test some of the nation's most exciting air vehicles. For 60 years, Projects at Dryden have led to major advancements in the design and capabilities of many state-of-the-art civilian and military aircraft. The newest, the fastest, the highest -- all have made their debut in the vast, clear desert skies over Dryden. Dryden Flight Research Center plays a vital role in advancing technology and science through flight. Here, we demonstrate America's leadership in aeronautics and space technology as we continue to push the envelope to revolutionize aviation and pioneer aerospace technology. Air Group One is the San Diego Wing of the CAF, a 501(c)(3) organization dedicated to the preservation of World War II aircraft and the history of World War II aviation. Air Group One formed as the "San Diego Squadron" of the CAF in 1981. Two years later it was reformed as a CAF Wing and renamed "Air Group One." 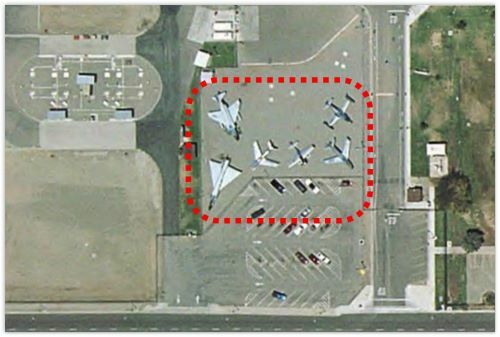 It is based at its new hangar located at 1860 Joe Crosson Drive, Suite B, on Gillespie Field in El Cajon, CA. Air Group One's hangar and WWII museum currently displays an SNJ "Sassy," and our L-5 Sentinel "Betsy" is in restoration at a hangar nearby. Air Group One is an all volunteer organization. 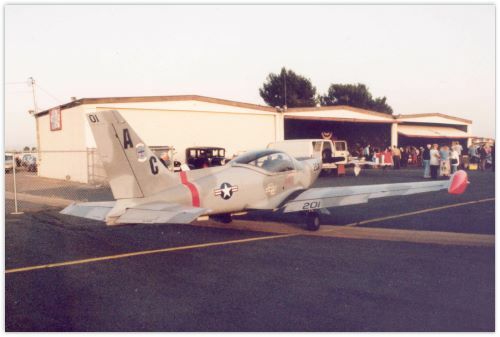 Its members work on a number of local projects, museum displays, maintain and restore World War II airplanes, travel to Southern California airshows with the aircraft and PX trailer and hold special events. Air Group One presents pancake breakfasts, symposiums and other special events including the annual World War II airshow held the first weekend of May. 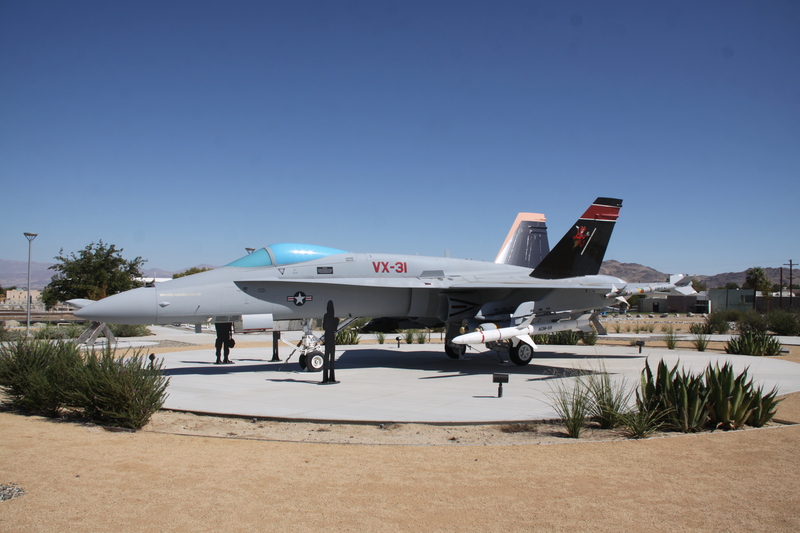 General meetings are held each Saturday at 10:00 a.m. and the hangar and museum is open to the public, free of charge, Wednesday through Saturday from 10:00 a.m. to 3:00 p.m. For additional information call the museum (619) 448-4505; or email them. North American SNJ-5 Texan "Sassy"
From a small one-hangar beginning, the San Diego Air & Space Museum's annex at Gillespie Field has grown to become an integral part of the Museum's aircraft restoration and replica reproduction program. Staffed mainly by volunteers, the Facility has produced some of SDAM's finest work. 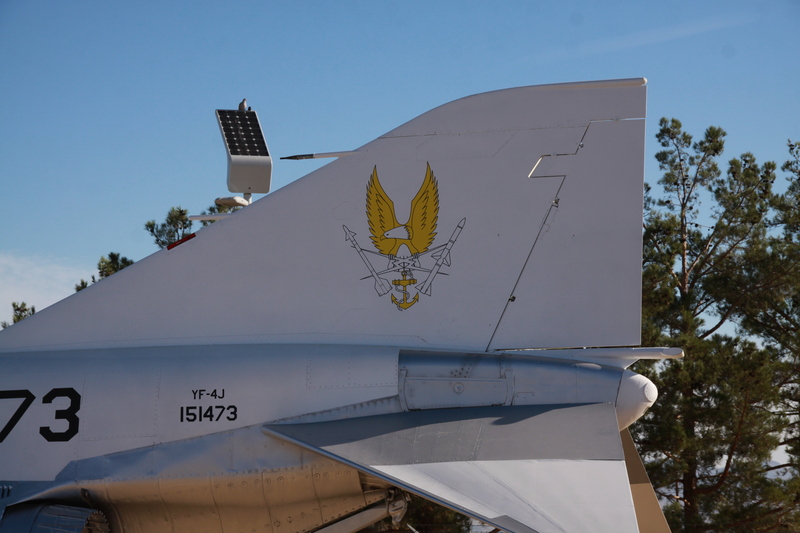 Of local significance, a Convair F-102A Delta Dagger recently completed restoration at the Annex. 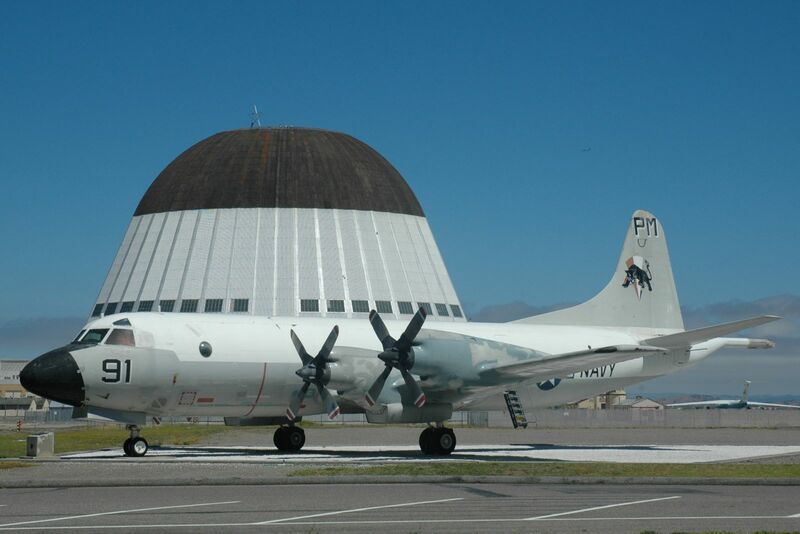 This aircraft was built in San Diego at Convair's Lindbergh Field plant in the mid-1950s. Many of the volunteers who participated in preservation efforts actually worked on the F-102 while employed by Convair/General Dynamics. Visitor Information: Open Monday, Wednesday, Thursday and Friday from 8:8:00 am to 3:00 pm. The Annex is located on the north side of Gillespie Field. Click here for directions and a map. Phone (619) 234-8291 for information. There is no charge for admission but donations are accepted. 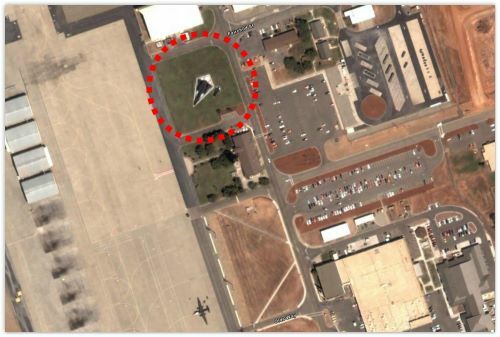 We need high resolution photos of the aircraft on display at this location … there appears to be five display aircraft on the base. We also need an up-to-date listing of all of the aircraft … make/model, serial or N-number, etc … Your help would be appreciated. Whether it concerns flying from an aircraft carrier or landing on the moon, NAF El Centro is proud of its past accomplishments, its expanding mission today, and its important role in the future. 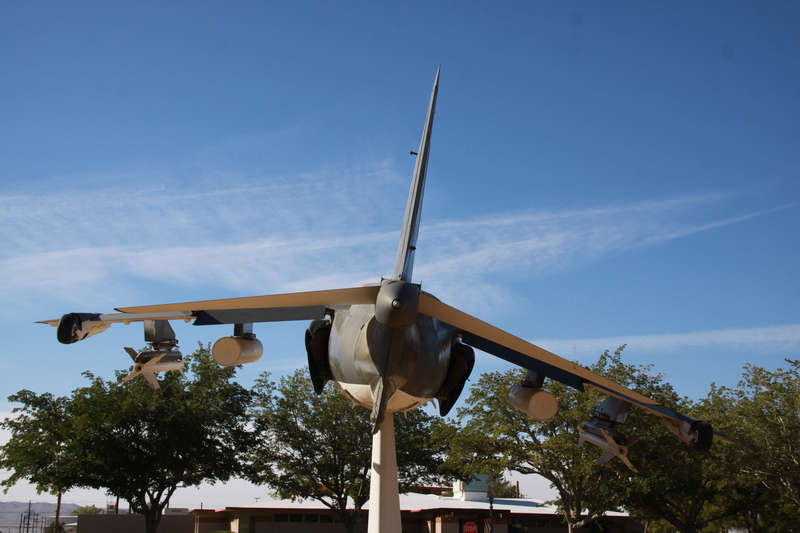 For the first 35 years, the mission of NAF El Centro was devoted to aeronautical escape system testing, evaluation, and design. In November 1947, the Parachute Experimental Division from Lakehurst, New Jersey moved to El Centro. Today, NAF El Centro provides realistic training to active and reserve aviation units and activities of the Navy's operating and training forces. Squadrons visit NAF El Centro to practice gunnery, bombing, carrier landings and air combat. The facility has two operating runways. The 9,500-foot east/west runway handles 96 percent of the traffic. 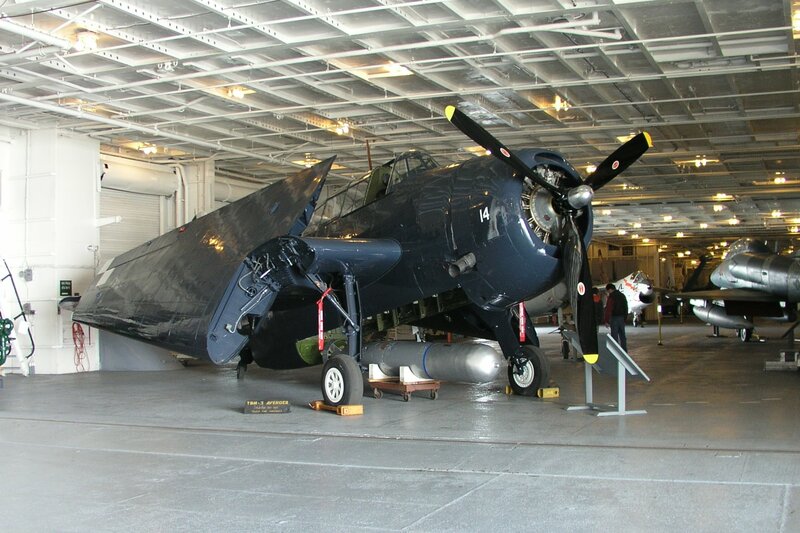 It is equipped with a Fresnel Lens Optical Landing System at each approach end as well as lighted carrier deck landing areas at both ends so pilots can simulate carrier landings. Apart from "touch and go" landings and take-offs, aircrews use the many ranges at NAF El Centro to develop their skills. 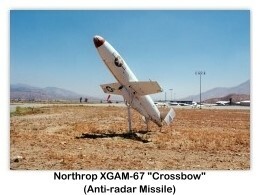 A remote-controlled target area allows naval aviators to practice ordinance delivery. 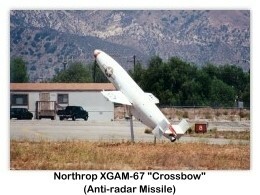 The desert range is used for air-to-ground bombing, rocket firing, strafing, dummy drops and mobile land target training. 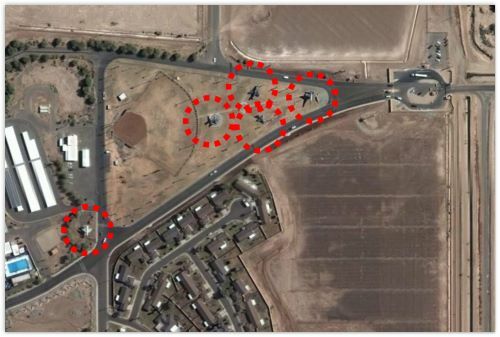 The target complex uses the Weapons Impact Scoring System that microwaves target images to a range master control building for immediate verification of weapons delivery accuracy. The addition of the Display and Debriefing Subsystem, known as DDS, expanded the role of NAF El Centro to include air combat training by utilizing remote television, acoustical and laser scoring systems. The DDS is linked with TACTS to provide a computerized record of the tactics employed by individual aircrews employ and to evaluate the effectiveness of each maneuver. 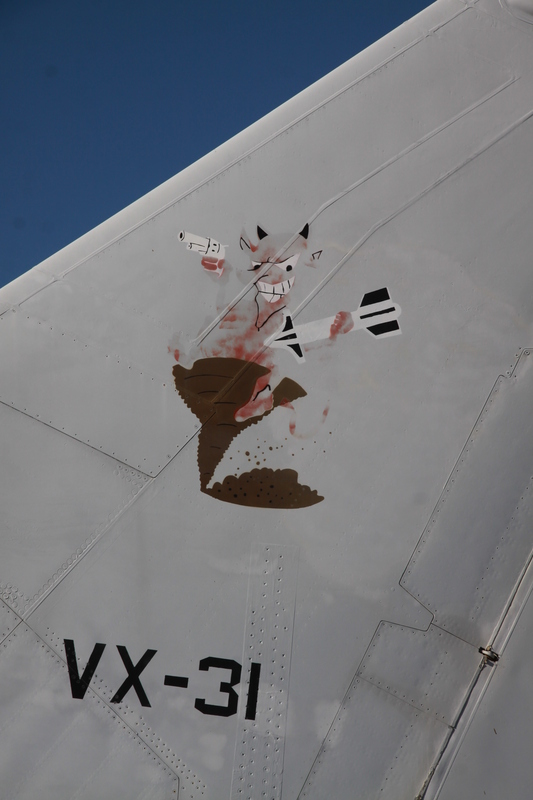 Many believe the training at NAF El Centro is as close as pilots can get to actual air combat. 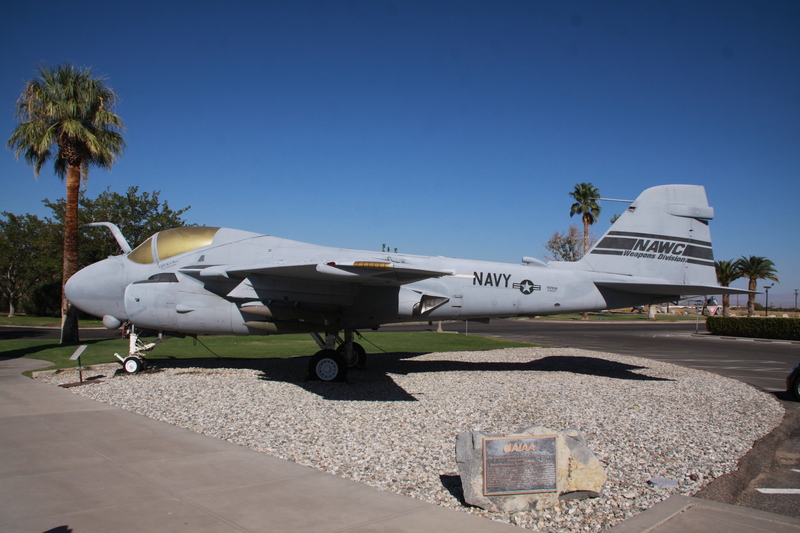 Much of the movie "Top Gun" was shot at NAF El Centro. 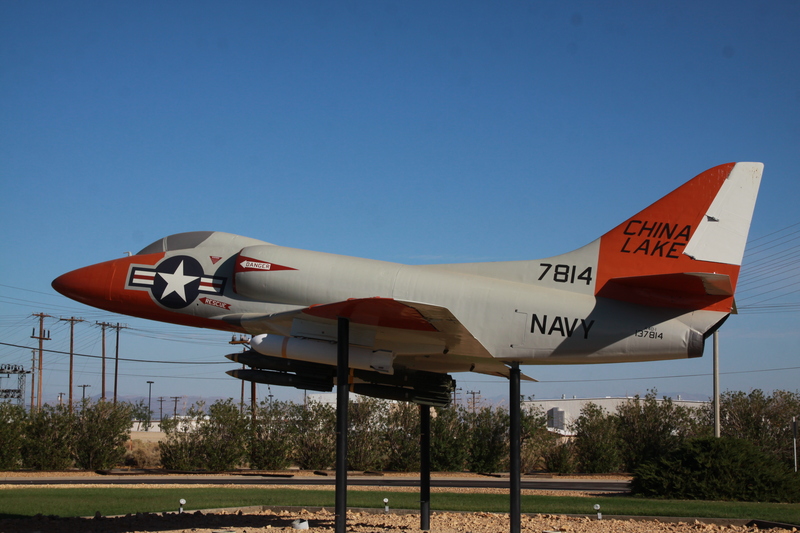 Because if its unique location, NAF El Centro is known to every naval aviator and plays a key role in their initial and refresher training. What makes the NAF so special is its combination of unique climate, vast unobstructed desert terrain, limited non-military air traffic and its own dedicated gunnery and bomb ranges. 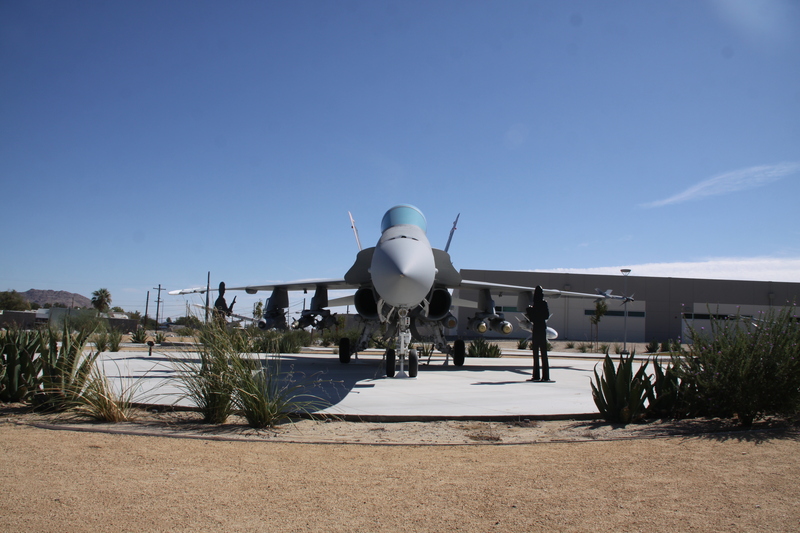 These factors make NAF El Centro an ideal environment for aerial combat maneuvering, air-to-air gunnery, bombing practice and electronic warfare training. 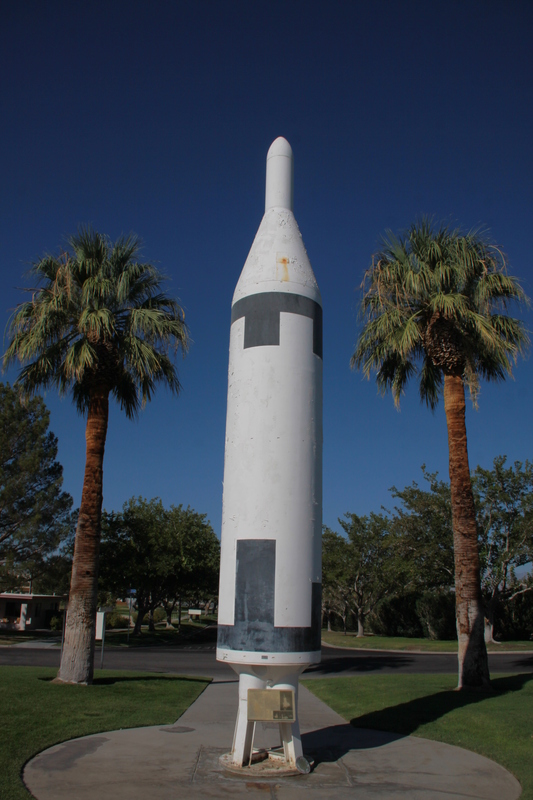 Variable climatic conditions and population are limiting factors at the Navy's only other facilities with similar missions — Fallon, Nevada, and Key West, Florida. The result is that NAF El Centro is very busy and in high demand. For example, the number of flight operations (landings and take-offs) exceeded 167,000 in 1999. Flight operations on a typical day reach over 450 between 7 a.m. and 11 p.m.
NAF is the "winter home" of the world-famous Blue Angels, the Navy's Flight Demonstration Squadron. Starting every January, the 'Blues' conduct over two months of intense flight operations prior to the start of their air show season. Until mid-March, the officers and enlisted personnel, who are specialists in all the aviation roles required to support the squadron's maintenance, administration and public affairs requirements, hone their skills as a cohesive unit. The American Society of Military History was incorporated in California in 1962 as a California Non-profit educational organization. 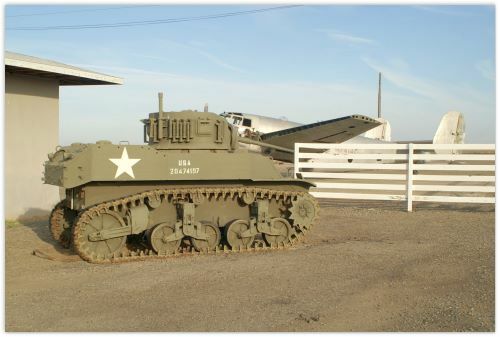 The goal of the society is to preserve and restore examples of American military equipment. 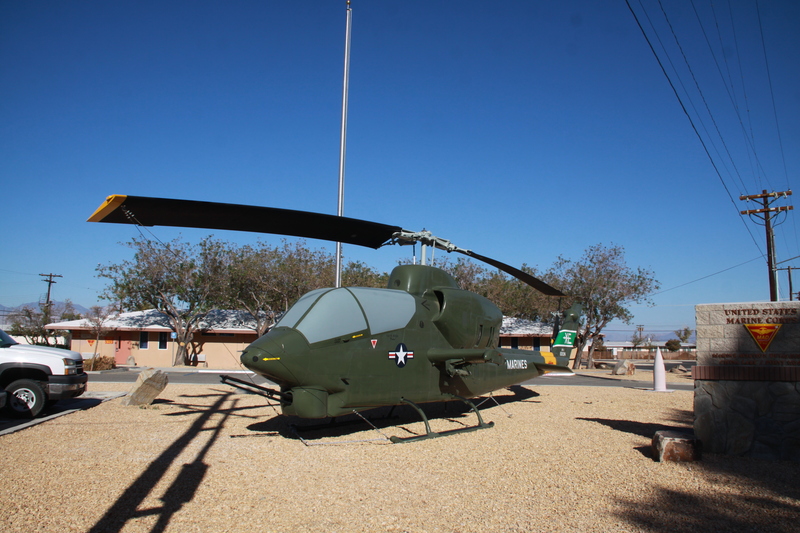 They have exhibits from all branches of the U.S. armed forces, Army, Navy, Marines and the Air Force. The museum has never used any government funds, all funding is through Museum membership, volunteers, and individual and corporate donors. The Museum is about 15 minutes from downtown Los Angeles. 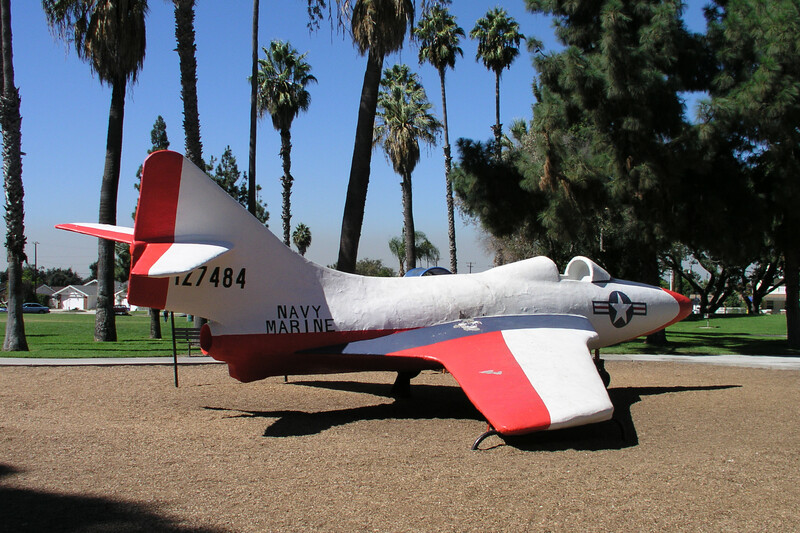 The Museum is located about a 1/4 mile north of the Rosemead exit on the 60 freeway in the city of South El Monte in the Whittier Narrows Recreation Area. The Museum is open Friday, Saturday and Sunday year round from 10:00 Am to 4:30 Pm. Since all the Displays are outside. Hickman Ave. and Burgan Blvd. 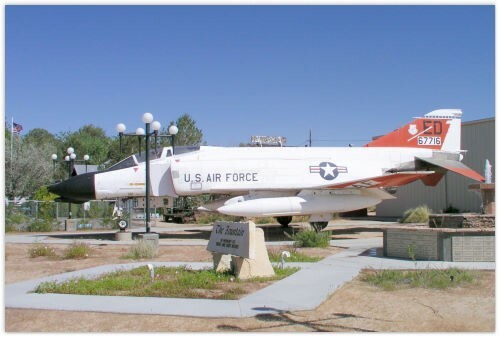 The Travis Air Museum is presently housed in the old base commissary located in the middle of Travis Air Force Base. Hosting up to 60,000 visitors a year before the terror attacks of September 11, 2001, the museum has seen its visitor population drop to 10% of that number due to the increased security precautions put in place after that event. It has become evident that the museum must move off base if it is to continue to be a dynamic part of civic life in northern California. 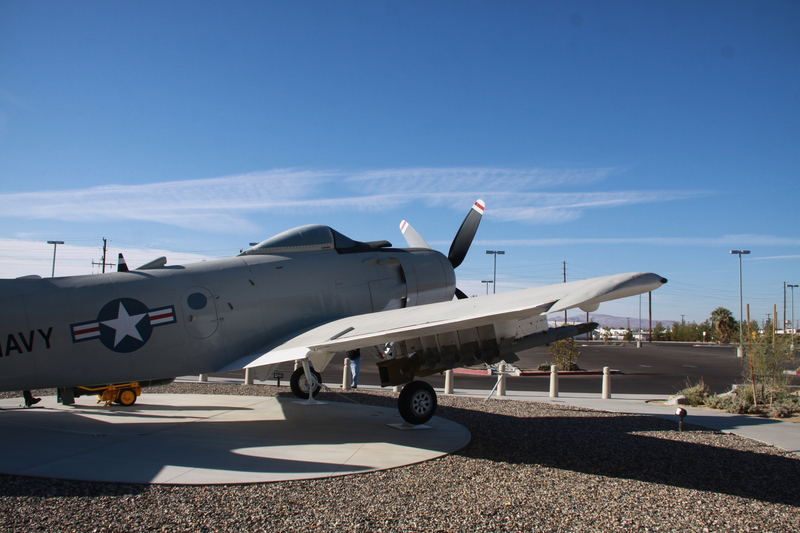 The museum is run by the Jimmy Doolittle Air and Space Museum Foundation. 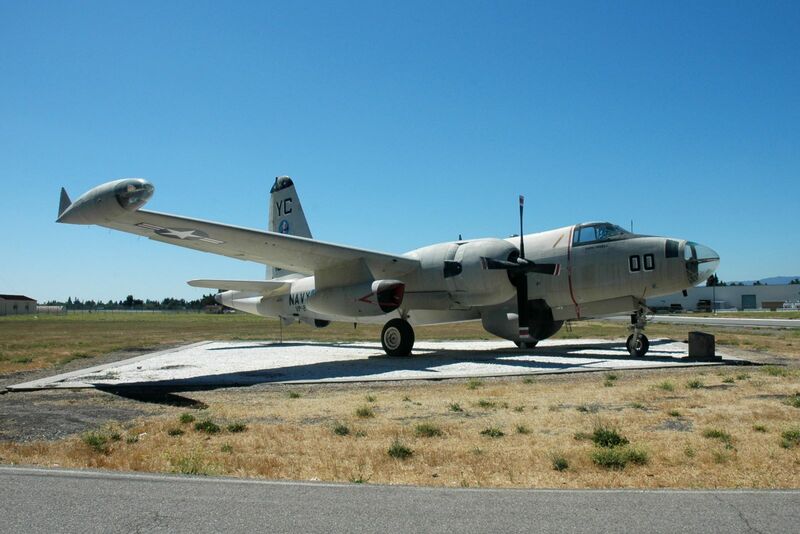 Planning for the movement of the Travis Air Museum to a future off base location is being directed by the Jimmy Doolittle Air and Space Museum Education Foundation. The new museum will be named the Jimmy Doolittle Air and Space Museum. The Foundation plans to build a new museum that is as inspirational to today's citizens as was Jimmy Doolittle's daring raid on Japan in April 1942. 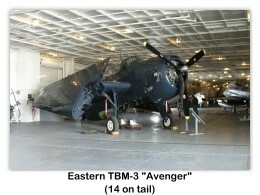 In the dark days after the attack on Pearl Harbor, and with the Japanese navy sweeping all before it throughout the Pacific — from the Aleutian Islands to Singapore and beyond — Jimmy Doolittle returned to active duty with an idea: to bomb Japan in retaliation for the raid on Pearl Harbor using the novel idea of flying bombers from aircraft carriers. The raid was successful, giving the American public a much-needed morale boost. It pointed to future risks and daring that resulted in complete victory three years later, a stunning turnaround for the fortunes of the USA, launching this country into world leadership after WW II. The future Jimmy Doolittle Air and Space Museum will be built around the present core collection of more than 30 aircraft and thousands of historical artifacts, the largest such collection between San Francisco and Seattle. 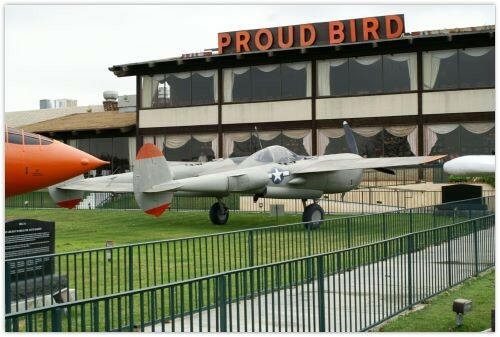 The museum will seek to become the pre-eminent military museum in Northern California, to inspire our youth with the boldness of our "greatest generation" in war and peace, to inform the public about the history of the Jimmy Doolittle raid, the history of Travis Air Force Base, and the history of the US Air Force. The new museum will be built with private donations. de Havilland Canada C-7A "Caribou"
McDonnell Douglas F-4C "Phantom II"
The Central California Historical Military Museum is an all-volunteer non-profit organization (501-(c)(3)) dedicated to the preservation of the Eagle Field Army Air Forces training base built near Dos Paslos, California in 1942 and to the instructor pilots who trained those young aviators who learned. Many of those who learned to fly in the PT-22s and Stearmans later lost their lives in combat st that freedom remained for us, and their children. They have only one major fund raiser event each year … The Annual Eagle Field Dinner Dance and Reunion. The Museum hours vary in the winter, so be sure to contact them before you visit. 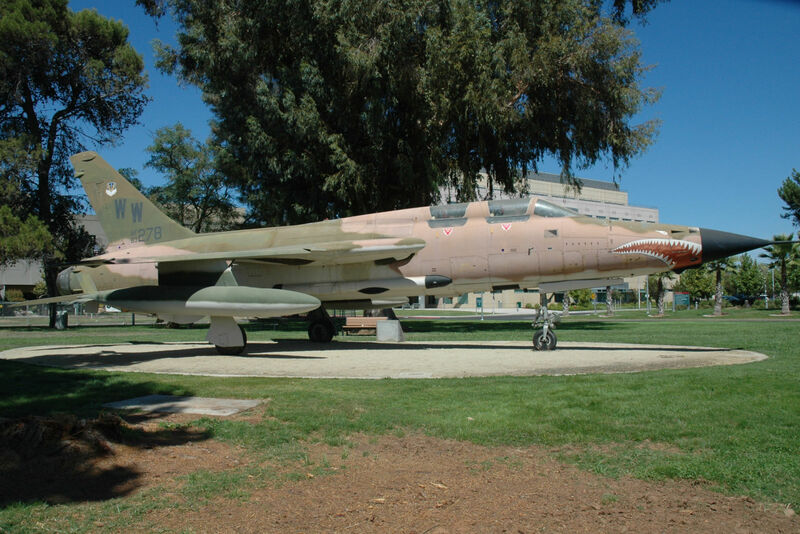 144th Fighter Wing [144th FW]: The Fresno Air National Guard Base in California is home to the 144th Fighter Wing. The 144th Fighter Wing's mission is to provide air defense protection for California from the Mexican border to Ukiah utilizing the F-16 Fighting Falcon jet fighter aircraft. The 144th also supports the nation's Counterdrug Program and responds to state emergencies when requested by the Governor of California. The wing's current inventory of aircraft includes 18 F-16Cs, one F-16D, a two place fighter trainer, and one C-26A transport. 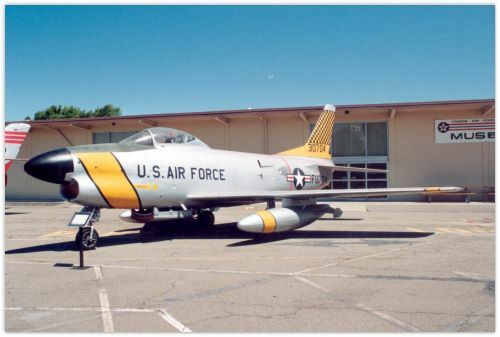 The origin of the 144th Fighter Wing dates Back to 4 April 1948, barely six months after the formation of the Air National Guard in September of 1947. 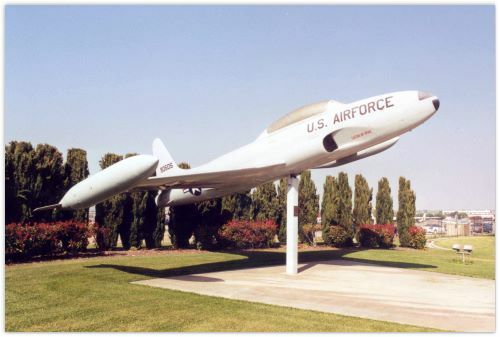 On that date, the 61st Fighter Wing received federal recognition at Alameda, CA, followed by activation of the 194th Fighter Squadron on 25 June 1948. 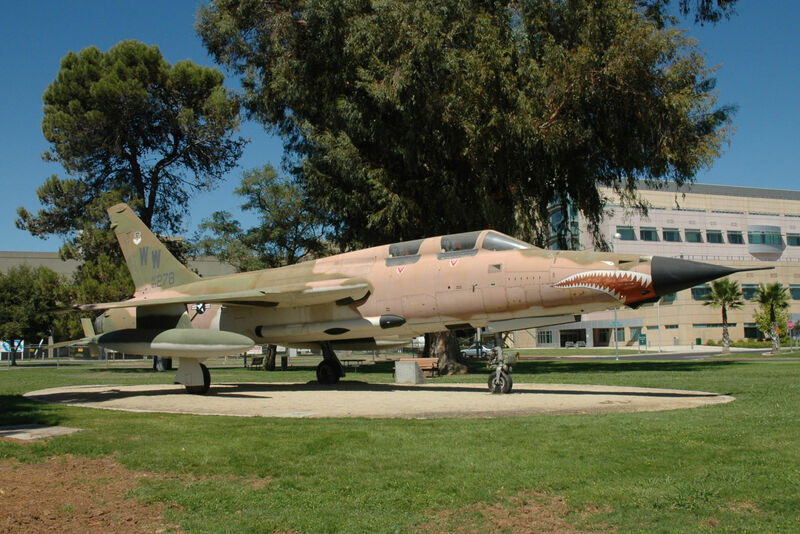 The 61st Fighter Wing was redesignated as the 144th Fighter Bomber Wing on 1 November 1950. Imagine yourself scouring the skies in a real military aircraft in search of enemy aircraft, using your state-of-the-art electronic tracking system to acquire your bogey, engaging in aerial combat, and returning to your base VICTORIOUS! Your Aircraft: An aerobatic, Italian-built fighter aircraft that has onboard radar intercept capability for acquiring bogies beyond visual range. Each aircraft comes with a patented electronic tracking system that allows for the simulation and thrill of an actual "guns kill"! Are you up for the challenge? Do you have what it takes to be a Fighter Pilot for a Day? What is Air Combat USA? Established in 1988, Air Combat USA is the ORIGINAL civilian dog fighting school in the world. We are the innovators of air combat training for civilians. We set the standard for program design and execution, offering a fighter pilot experience second to none. Our guest pilots fly real military fighters with licensed fighter pilots in the cockpit with them. All aircraft are outfitted with high-end digital multi-camera systems to capture your fighter pilot experience. No pilot's license is required for the guest. For 80 years, Goodyear blimps have adorned the skies as very visible corporate symbols of the tire and rubber company that began operations in 1898. Today, these graceful giants travel more than 100,000 miles across the United States per year as Goodyear's "Aerial Ambassadors." The blimp tradition began in 1925 when Goodyear built its first helium-filled public relations airship, the Pilgrim. The tire company painted its name on the side and began barnstorming the United States. Humble beginnings to an illustrious history. Over the years, Goodyear built more than 300 airships, more than any other company in the world. Akron, Ohio, the company's world headquarters, was the center of blimp manufacturing for several decades. Today, The Goodyear Tire & Rubber Company no longer mass-produces airships. 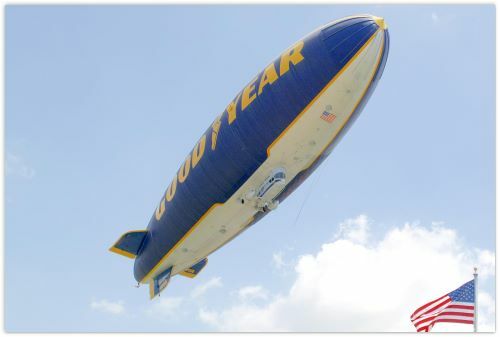 In the United States it operates three well-recognized blimps: the Spirit of Goodyear, based in Akron, Ohio; the Spirit of America, based in Carson, California; and the Spirit of Innovation, in Pompano Beach, Florida. 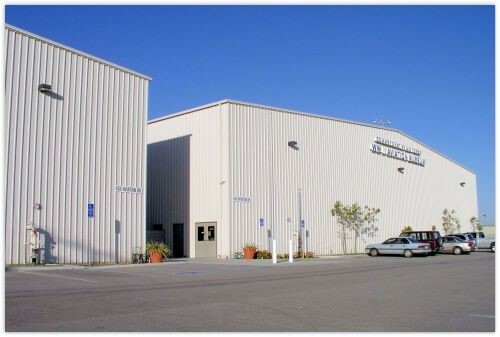 "Bud Field Aviation" is located at the Hayward Executive Airport in the city of Hayward, California. Bud Field Aviation specializes in: the storage of executive jet aircraft; the restoration/maintenance of aircraft; aircraft hangar development; and aircraft recovery. It appears that many of their restoration projects are "home-based" at their hangar. 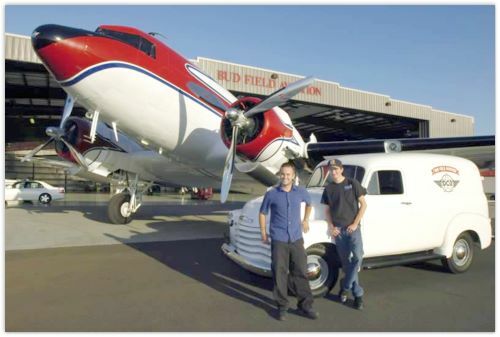 Bud Field Aviation appears to be a "class act" in the aircraft restoration business. At this point, we're not sure whether or not they're open for tours, but it is certainly worth a try. At this point we have very little information about the Ryan School of Aeronautics Museum. We searched the Internet and could not find a web site for the Museum. Your help would be appreciated providing updated information about the Museum. 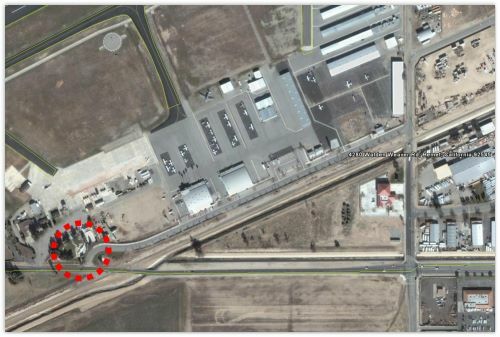 The satellite images of the location indicate that there is a two-engine aircraft on a pedestal at the intersection of Stetson Avenue and Walden Weaver Road. Information about this aircraft would be appreciated. "Unknown Aircraft" at intersection of Stetson Ave. & Walden Weaver Rd. This new facility entirely paid for by Valley citizens who have dug deep into their pockets to keep history alive for future generations is one of its kind in the country. The museum houses galleries honoring the different ethnic communities and their history of settlement in the Imperial Valley. 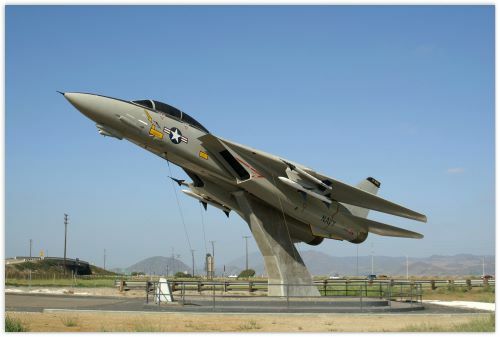 It also has a place of honor for all the local young men and women who have served in this country's armed forces from the Civil War to Desert Storm. The Veterans Gallery includes artifacts and uniforms from the different wars and a memorial outside to honor those who paid with their lives. 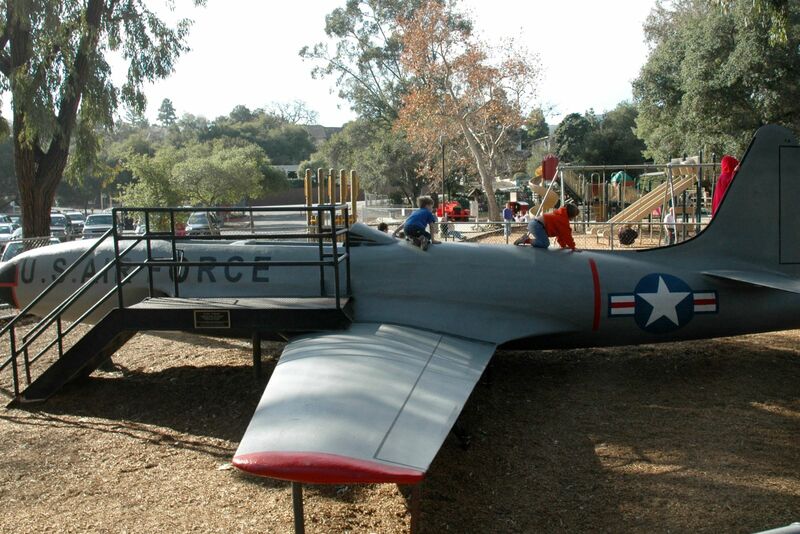 This aircraft is located in Del Valle Park at the corner of Henrilee St. and Woodruff Ave. in the center of Lakewood. The park was dedicated in 1957 and is named after Jose del Valle, a liberator and statesman of Honduras. 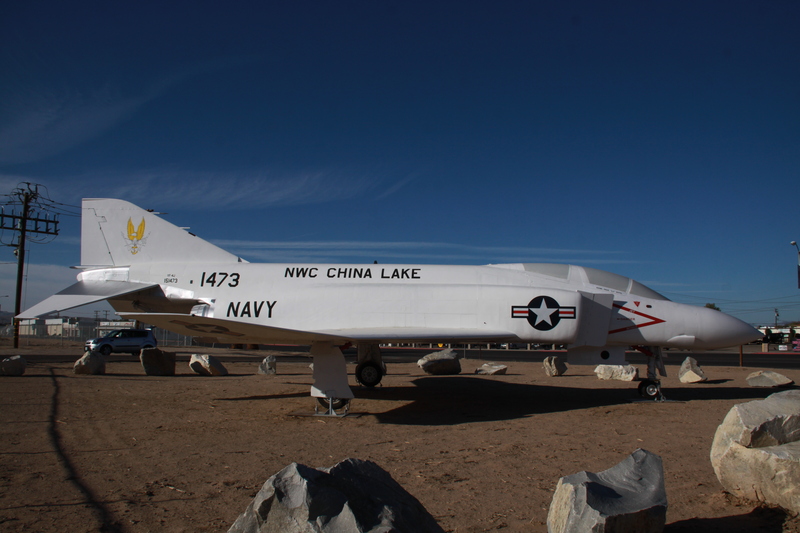 This popular park is also known as "Airplane Park" for the Skynight jet fighter proudly displayed on the southeast corner of the park. This 12-acre park is also home to the Summer Concerts series. 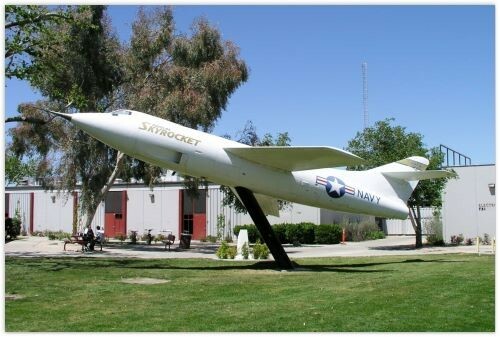 Location of Douglas D-558-2 "Skyrocket"
Antelope Valley College located in Lancaster, California is the final home of a nicely displayed Douglas D-558-2 "Skyrocket" research aircraft. 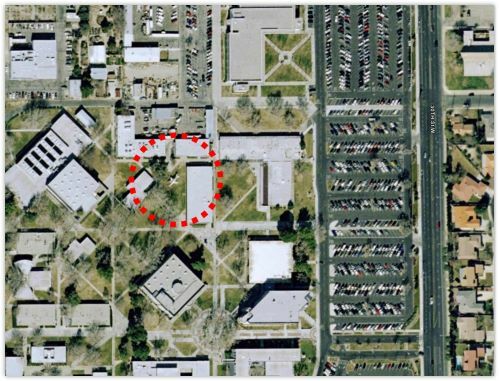 The aircraft sits atop a pedestal located in the center of the campus between buildings ME and OF2. 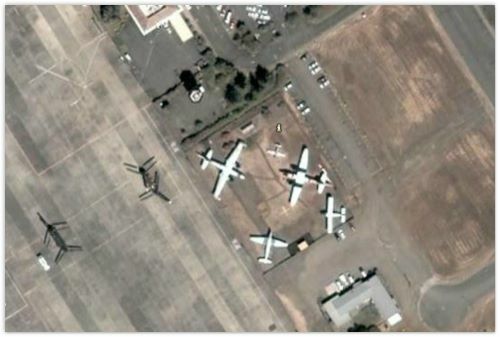 The exact location of the aircraft is shown inside the red dotted circle from the Google Earth satellite photo shown above. Named in honor of the Apollo 11 astronauts who first journeyed to the moon, Los Angeles County began construction of Apollo Park in 1969 and was dedicated on November 4, 1972. 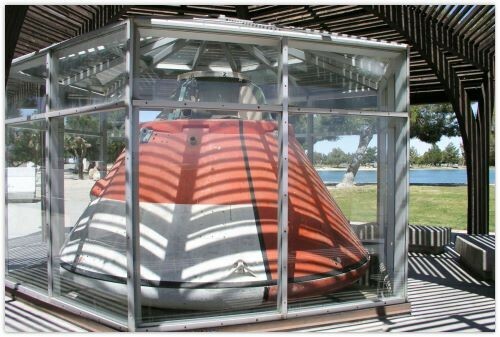 The park is also home to a replica Apollo Space Capsule on loan to the County from the Smithsonian Institute. This 56 acre aquatic recreation area is part of the Antelope Valley Waste Water Reclamation Project. The park is comprised of 26 acres of three recreational lakes (Aldrin, Armstrong and Collins) and 30 landscaped acres of parkland. This park is considered a "passive" recreational facility. 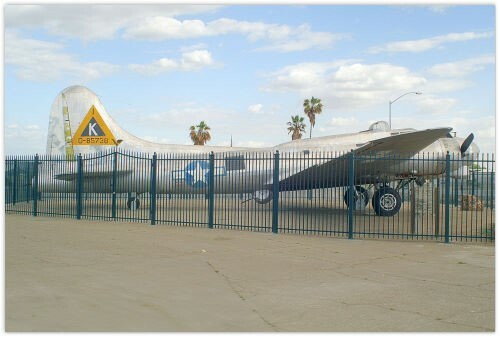 The Milestones of Flight Air Museum Is a fairly new facility that is located on the South-East end of Fox Field in the city a Lancaster, California. They have a nice collection of aircraft on display. Currently the gift shop is located in the main terminal facility at Foxfield. Be sure to stop by and check them out. Everybody loves a hero, and Lancaster has been home to more than its share of heroes. For more than 60 years, aviators have performed remarkable feats of heroism in the skies over the City of Lancaster. The Aerospace Walk of Honor recognizes the feats that made history and continues to honor the aerospace breakthroughs occurring over our heads in more recent years. 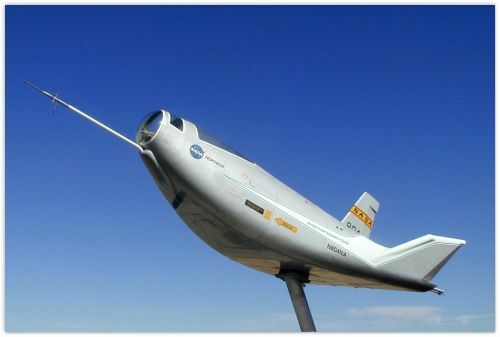 Each year, three to five pilots are selected for their lifetime contributions in testing experimental aircraft at Edwards Air Force Base and other prestigious organizations like NASA, Boeing, Lockheed Martin, and Northrop Grumman. The annual unveiling of the monuments usually takes place on September 15, 2007 at Boeing Plaza. The unveiling is followed by an evening program and banquet, which is attended by the honorees and their loved ones, City of Lancaster leadership, and the general public. The Lancaster City Council looks forward to lining Lancaster Boulevard with additional tributes of monumental achievement through the Aerospace Walk of Honor program for many years to come. The Lancaster JetHawks Professional Baseball Club took flight in 1996 and has attracted over two million fans to Clear Channel Stadium at Lancaster, CA in eleven seasons, an average of nearly 3,000 fans per game since its inception. In 2005, the JetHawks became the third-fastest team in California League history to reach the two-million-fan milestone. Fans and sponsors agree that there is no better family entertainment value than the Antelope Valley's only professional sports franchise. The JetHawks are the Class A affiliate of the Major League Boston Red Sox and are a member of the ten-team California League. The circuit plays a 140-game regular season schedule with clubs located throughout the Golden State. We need high resolution photos of the aircraft on display at this location. There appears to be 5 display aircraft at the base. We also need an up-to-date listing of all of the aircraft … make/model, serial or N-number, etc … Your help would be appreciated. 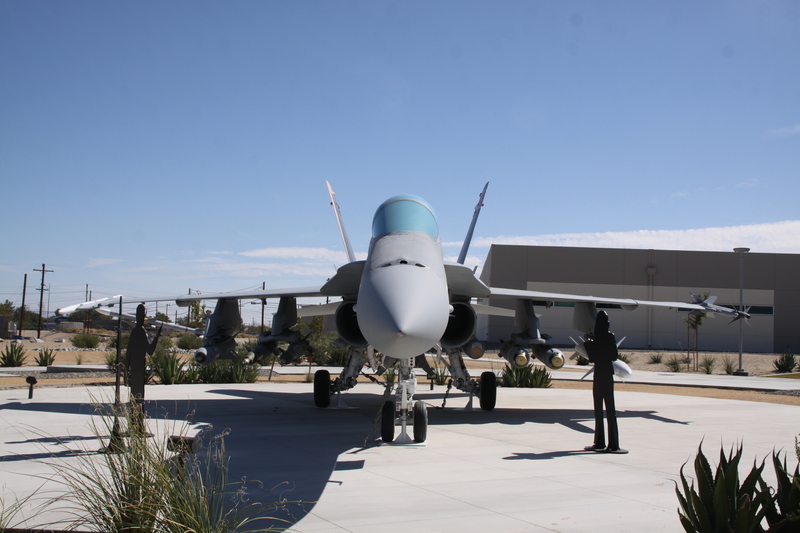 NAS Lemoore is the Navy's newest and largest master jet air station. 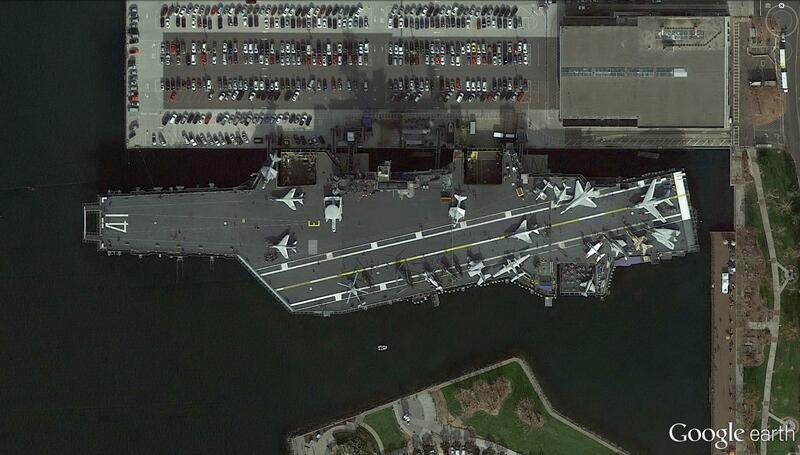 The Pacific Strike Fighter Wing with its supporting facilities are home ported here. 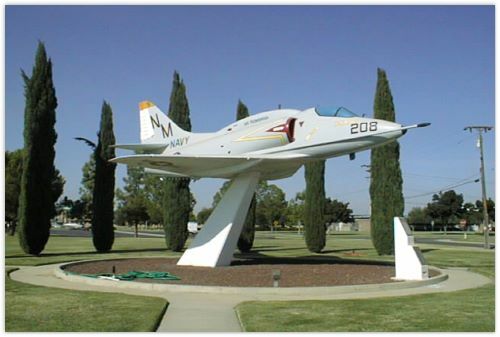 Located in a rich agricultural area, NAS Lemoore offers sailors, Marines and civilians a small hometown atmosphere of rural America. Yet surrounding Lemoore are California's playgrounds — Los Angeles, San Francisco, the Sierra Mountains and the Pacific Ocean. 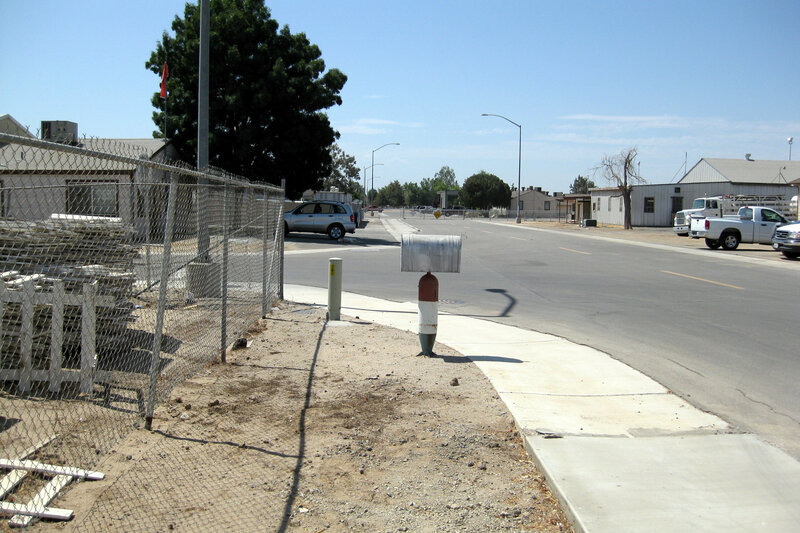 In the summer months, Lemoore is hot and dry with cloudless skies. The temperature often rises above 100 degrees; however, humidity usually stays a low 25 percent. Fog starts to roll in during November through the winter months and usually burns off by the afternoon to yield sunny skies. Beaches are within a 2-hour's drive, and mountain skiing is less than a 3-hour's drive. 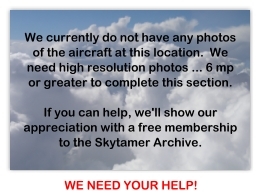 We need high resolution photos of the aircraft on display … if any … at this location. We couldn't find any on the satellite photos. We also need an up-to-date listing of all of the aircraft … make/model, serial or N-number, etc … Your help would be appreciated. 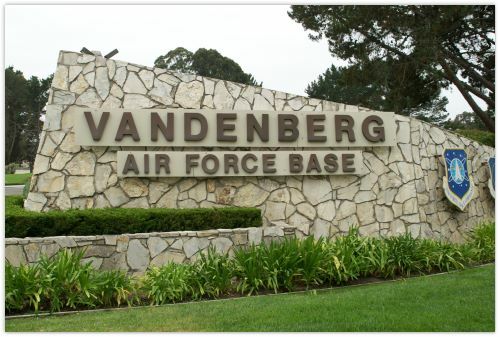 Vandenberg Air Force Base is headquarters for the 30th Space Wing. The 30th manages Department of Defense space and missile testing, and placing satellites into polar orbit from the West Coast, using expendable boosters. Vandenberg is located on California's "Central Coast". Vandenberg and central California's coastal residents consider their environment mild. The 150 square mile area midway between San Francisco and Los Angeles is surrounded by the Santa Ynez Mountains, the Pacific shore, and ranches of northern Santa Barbara and San Luis Obispo Counties. Purpose: The Joint Forces Training Base (JFTB) is a full-service joint military training center, airfield and State Disaster Support Area. Strategically centered in the greater Los Angeles-Orange County area, this 1300+ acre installation serves a wide variety of military, government and public interests and makes critical assets available to the Nation and State in the event of regional disaster or emergency. Supporting Joint Forces: The Navy established the Base in 1942 as a Naval Air Station supporting the WWII effort. 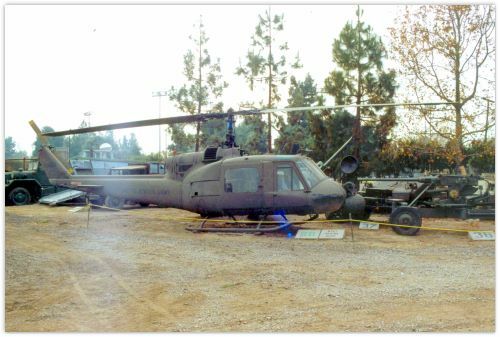 The USN transferred the base to the Calif. Natl' Guard in the early '70s. Today there are 68 tenant entities representing military services, federal, state, municipal, public, private and nonprofit organizations. The larger of these agencies are the 40th Infantry Division (Mechanized) of the California Army National Guard, Governor's Office of Emergency Services (Southern Region Hqs), Operation Medfly of California's Department of Food and Agriculture, the 63rd Regional Readiness Command (US Army Reserve), the National Aquatic Center, home of the US Women's Olympic Water Polo Team, Civil Support Team for Weapons of Mass Destruction, and the Army Airfield. The JFTB has a daily average of 850 employees and supports 3000+ military members for Guard and Reserve duty. Capabilities: During regular operations the Base provides facilities to federal, state, county, and city government agencies. It is a community focal point for general public events and a military oasis. A premier training base, the JFTB provides classrooms, a distance learning and video teleconferencing center, and a variety of state-of-the-art training simulators. There are small-unit training areas including a Drop Zone for parachute drills. Monthly, the Army Airfield averages 5,000+ flights and radar ground control approaches. The airfield also stores and dispenses jet fuel for military, state, federal, and other aircraft. Disaster Support Area: The JFTB provides a wide range of military support to civil authorities during federal and State emergency and disaster mitigation operations. With two active runways, 8000 and 5900 feet, the Los Alamitos Airfield is the region's primary airfield for emergency air transport of relief crews, humanitarian supplies, equipment relocation, and medical operations. It is an alternate site to support air transportation in the event of disaster impact to other airports. The Base will support the emergency relocation of disaster support agencies and agency disaster mitigation activities, to include crew housing, sustenance, equipment staging, communications, warehousing of relief materials, secure facilities for hazardous material handling, and command post/EOC functions. Most important is that the Governors Office of Emergency Services is located on the base. For nearly 20 years the California Science Center (and its predecessor institution, the California Museum of Science and Industry) has received support from various curatorial departments at the Smithsonian Institution's National Air and Space Museum. The artifacts which have been entrusted to the Science Center's care include, from the Aeronautics Department, Excalibur III (flown by Captain Charles Blair), and the beautiful 1929 Velie Monocoupe, painstakingly restored by world famous aviator Tony LeVier. Artifacts entrusted to the Science Center from the Department of Space History include flown spacecraft such as the Gemini 11 and Mercury MR-2 space capsules; a flown Apollo spacesuit and several orbiting astronomical observatories and deep space probes. These priceless artifacts play a key role in helping the Science Center to interpret the science and engineering principles that underlie important accomplishments in aeronautics and space exploration. This longstanding relationship between the Science Center and the Smithsonian has proven beneficial to the National Air and Space Museum as well. A clear priority of the Smithsonian Institution is to make its resources available to a wide range of cultural and educational organizations across the United States so that it becomes a truly national institution. It is in this spirit that a new outreach effort called the Affiliations Program was created to foster fruitful partnerships with museums and cultural organizations throughout the country. In recognition of the need to solicit reputable partners for the Affiliations Program, in March 2000 the chairman of the National Air and Space Museum's Space History Department invited the California Science Center to formally apply for the program. In response to this invitation, the Science Center submitted its formal request for the new status and in October 2000 entered a new chapter in its relationship with the Smithsonian Institution by formally becoming a Smithsonian Affiliate. Opened in the early 1960's, the Proud Bird Restaurant offers its guests a fabulous dining experience with a "one of a kind" view. Located right next to one of Los Angeles International Airport's approach runways, the restaurant provides diners with a front row view of airplanes making their landing. Along with the view, the restaurant's atmosphere contributes to the unique dining experience. Themed after the era surrounding World War II, when you step through the front door you will feel as if you have stepped Back in time. Be sure to take your camera … not only can you grab photos of incoming aircraft to LAX, you can also visit their outdoor display aircraft. 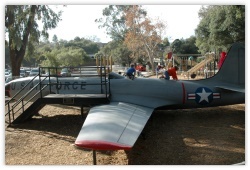 The Lockheed T-33A "Shooting Star" s/n 53-5421 in Oak Meadow Park is on loan to the Town of Los Gatos by the United States Air Force, where it has been in the playground area since July, 1974. 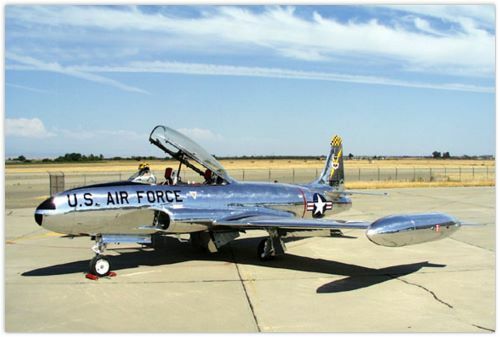 It was manufactured by Lockheed Aircraft, Burbank, California and delivered to the USAF in December, 1954. Thanks to Ron Strong for the photo. We need high resolution photos of the aircraft on display at this location. Your help would be appreciated. The 9th Reconnaissance Wing is responsible for providing national and theater command authorities with timely, reliable, high-quality, high-altitude reconnaissance products. To accomplish this mission, the wing is equipped with the nation's fleet of U-2 and RQ-4 reconnaissance aircraft and associated support equipment. The wing also maintains a high state of readiness in its expeditionary combat support forces for potential deployment in response to theater contingencies. The 9th Reconnaissance Wing is composed of more than 3,000 personnel in four groups at Beale and multiple overseas operating locations. 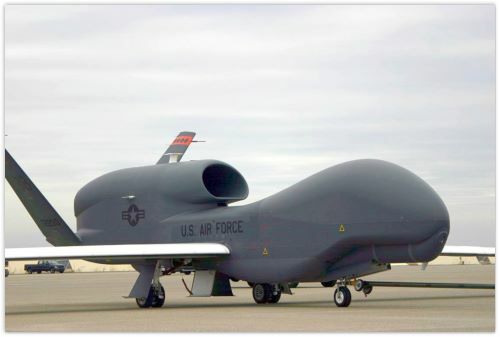 On May 1, 1999, the 9 th Reconnaissance Wing celebrated the 50th anniversary of its activation at Fairfield-Suisun (present-day Travis) AFB, Calif. The wing's lineage and honors history extends Back even further. 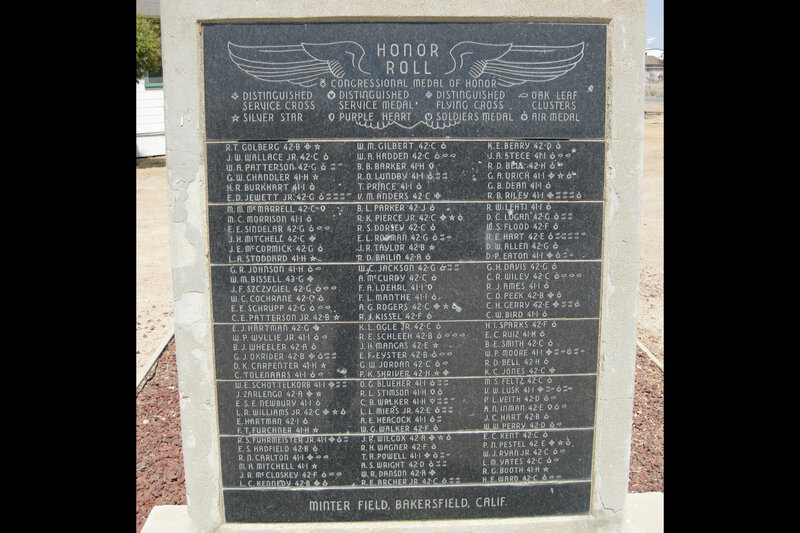 Soon after the 9 th Bombardment Wing activated, the 9 th Bombardment Group inactivated and the group's lineage and honors passed on to the wing. The group stood up at Mitchel Field, New York, on August 1, 1922, as headquarters for the 1st (the oldest Air Force squadron) and 5 th Squadrons. 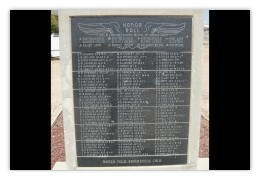 The 99th Squadron joined the group on November 9, 1928. In March 1916, the 1st Aero Squadron, with Captain Benjamin D. Foulois as commander, supported General "Black Jack" Pershing's punitive expeditions into Mexico. Pancho Villa had raided Columbus, New Mexico, and Pershing pursued and hoped to capture him. On March 16, 1916, Captain T.F. Dodd, with Captain Foulois as observer, flew the first American aerial reconnaissance mission in combat. (The wavy line in the middle of the wing's emblem represents the Rio Grande River and the 1st Aero Squadron's operations in 1916). Both the 1st and the 99th Aero Squadrons flew in World War I. Between 12 and 15 September 1918, they joined the great air armada of 1,481 airplanes in a massive air offensive in the St. Mihiel sector of France. The squadrons also participated in the Champagne-Marne, Aisne-Marne, and Meuse-Argonne combat operations. 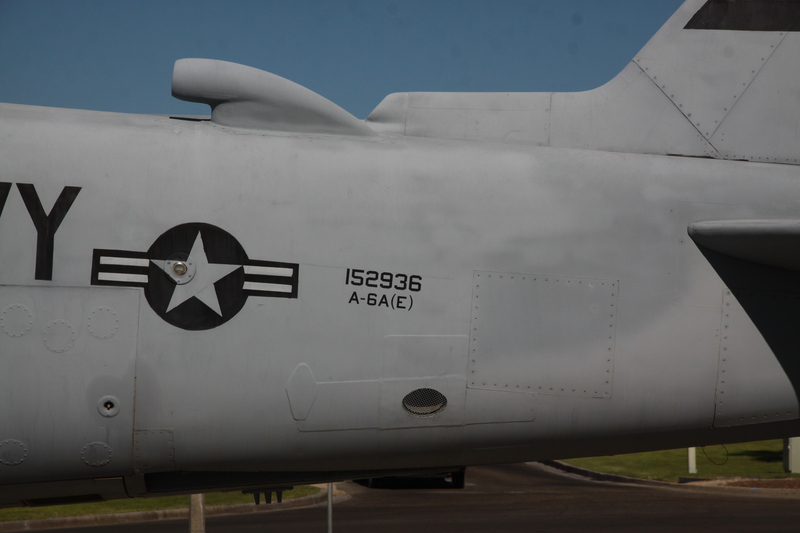 (The four black crosses on the wing's emblem commemorate these air battles). In World War II, the 9th Bombardment Group fought in the Pacific Theater. On April 15-16, 1945, 339th Group B-29s flew 1,500 miles, low-level to avoid detection, over water, at night, to attack heavily-defended Kawasaki, Japan. Enemy searchlight, anti-aircraft guns, and flak boats destroyed four of the group's 33 bombers and damaged six others. But the attack demolished Kawasaki's strategic industrial district. The group earned a Distinguished Unit Emblem (DUE) for its actions. The unit won another DUE the following month for mining the Shimonoseki Straits and the waters around Honshu and Kyushu blocking Inland Sea traffic and isolating important Japanese ports. 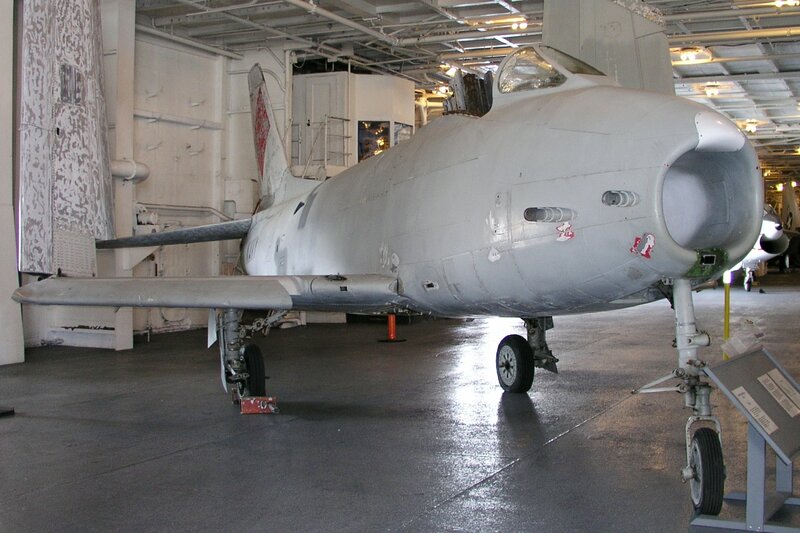 After its activation in 1949, the 9th Strategic Reconnaissance Wing's 1st , 5th , and 99th Strategic Reconnaissance Squadrons flew RB-29s and RB-36s on visual, photographic, electronic and weather reconnaissance missions. The Air Force redesignated the wing the 9th Bombardment Wing on April 1,1950. 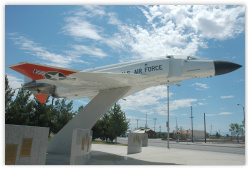 In 1953, the wing moved from Fairfield-Suisun AFB to Mountain Home AFB, Idaho. There, B-47s replaced the B-29s. The wing's B-47s were an integral part of the Strategic Air Command's (SAC) nuclear deterrent force until 1966. In November 1955, the wing displayed SAC's ability to strike anywhere in the world by flying nonstop from Mountain Home AFB to New Zealand, a distance of 8,300 miles. 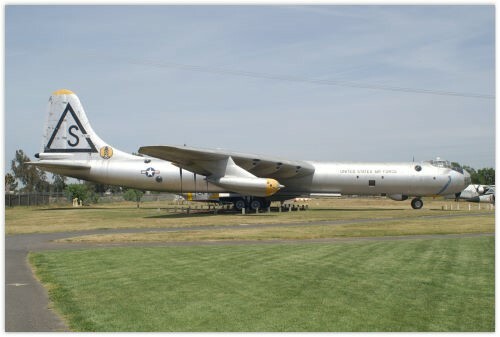 The 9th returned to its roots on June 25, 1966, when the Air Force redesignated the wing the 9th Strategic Reconnaissance Wing and transferred it to Beale AFB. The wing would fly the new SR-71 "Blackbird," a supersonic, high-altitude reconnaissance aircraft. Flying above 80,000 feet at more than 2,000 mph, the SR-71 could survey over 100,000 squares miles in an hour. The airplane quickly became operational and began flying missions throughout Southeast Asia. Rescuers used SR-71 photos to plan the raid on Son Tay prison to free American prisoners-of-war. After the Vietnam War, the SR-71 established a level-flight-at-altitude record at 85,131 feet and a straight-course speed record of 2,194 mph. On July 1, 1976, the U-2 joined the SR-71 in the 9th Strategic Reconnaissance Wing giving the unit two of the most unique aircraft in the world. The "Dragon Lady" had gained national and international recognition with flights over the Soviet Union, China, Cuba, and Southeast Asia. The U-2 was the perfect complement to the SR-71. The Blackbird could penetrate highly-defended areas, take a "quick look," and depart at high speeds. The Dragon Lady could spend more time "on-station" and furnish a "long look" at the desired target. The U-2 was also much less expensive to fly. In 1989, the Air Force decided the SR-71 was too expensive to operate and retired the Blackbird on January 1, 1990. Although it made a brief revival in the mid-90s, today the aircraft is again retired. The U-2, meanwhile, continued to prove its worth. In 1990-91, the wing deployed the largest contingent of U-2s ever to Saudi Arabia to support Operation DESERT SHIELD/STORM. The Dragon Lady tracked Iraqi troop and armor buildups, assessed bomb damage, and monitored a massive oil spill in the Persian Gulf. 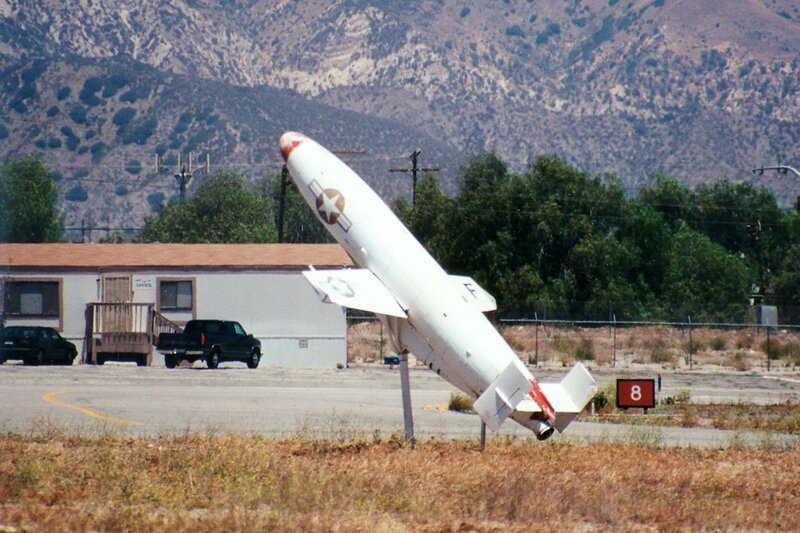 U-2 pilots alerted ground stations of Scud missile launches and guided fighter aircraft to destroy Scud launchers. 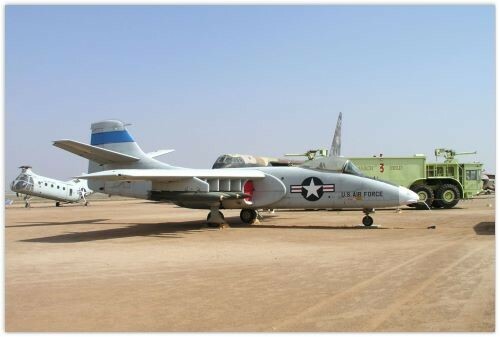 After the Gulf War, the U-2 stayed in Saudi Arabia to monitor Iraqi compliance with the peace agreement. In 1998, the Dragon Lady set a weight-to-altitude record and in 1999 won the Collier Trophy, aviation's most coveted award. We need high resolution photos of the aircraft on display at this location. We also need make/model, serial numbers, etc. Your help would be appreciated. 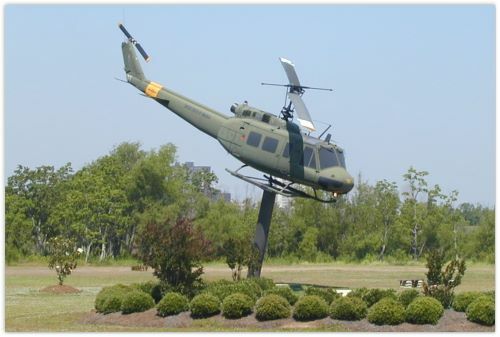 A privately-owned museum established in 1985, the Museum of the Forgotten Warriors pays homage to the men and women who served in the Vietnam War. The museum is arranged in two parts, with United States and South Vietnamese objects on one side, and objects from Viet Cong on the other. Exhibits tell the story of the war from a soldier's perspective using patches, weapons, uniforms, photographs and letters. Open first Saturday of each month, Veterans Day & Memorial Day 10 am to 4 pm. Admission is free. The Department of Veterans Affairs Northern California Health Care System (VANCHCS) is an integrated health care delivery system, offering a comprehensive array of medical, surgical, rehabilitative, primary, mental health and extended care to veterans in northern California. VANCHCS serves an area consisting of more than 377,700 veterans dispersed over a wide geographic area spanning approximately 40,000 square miles. The health system is comprised of a medical center in Sacramento; a rehabilitation and extended care facility in Martinez; seven outpatient clinics, a Substance Abuse Treatment Center in Oakland; and dental clinics in Vallejo, Sacramento, and Redding. The Sacramento VA Medical Center is a 50-bed, state-of-the-art, inpatient facility offering a full range of comprehensive health care services including medical, surgical, primary and mental health care. The medical center, which is comprised of 28 medical-surgical beds, 12 TCU beds, 10 ICU beds, and a four room operating suite, also houses a cardiac catheterization lab, a gastrointestinal & endoscopy suite, angiography capability and 16,000 square-feet of research laboratory. The medical center offers a wide range of outpatient and diagnostic services, including mammography, MRI, CT, and PET scanning. 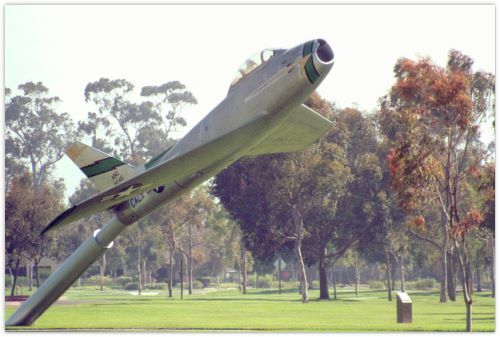 According to Ron Strong, the Republic F-105G ''Thunderchief'' (Wild Weasel) shown above is the only display aircraft left the site of the old Mather AFB. Thanks again to Ron for the pictures! We need a high resolution photos, make/model, serial or N-numbers, etc. of the aircraft at this location. Your help would be appreciated. 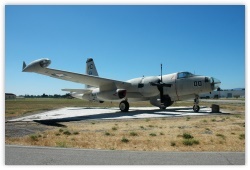 The Central California Valley Squadron of the Commemorative Air Force is dedicated to the preservation of operational heritage military aircraft. 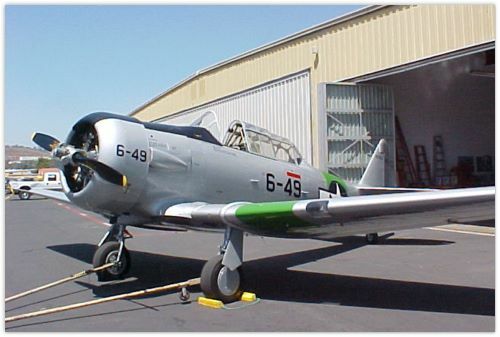 They have a Stinson L-5 "Grasshopper" aircraft that is fully operational and they are in the process for restoring a Vultee BT-13 "Valiant" WWII basic trainer. They host many activities for both pilots and non-pilots in their organization. 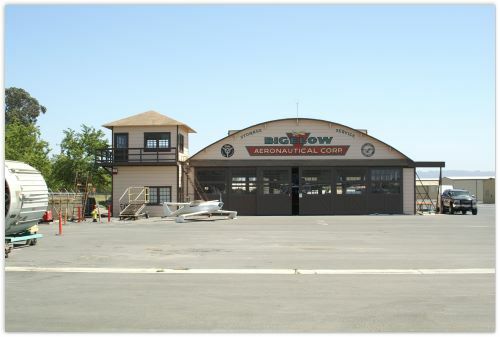 They have a General Membership Meeting on the 1st Thursday of every month in their hangar at Harry Sham Field (Modesto Airport). They are located in Hangar 1S at the airport, a 15,000 facility. They are in the process of developing of a first class Heritage Airpower Museum in the Hangar. If you have an interest in helping them in any of these activities, please give them a call. If you have any heritage artifacts from WWII or later that you would like to consign to them, they will provide secure, appropriate display. If you would rather donate any item of interest, appropriate tax deductions may be available since they are a 501(c)3 charitable organization. 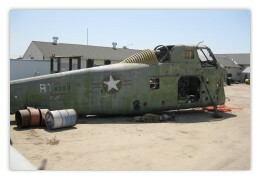 Carcasses of out-of-use aircraft can be found at Mojave's so-called 'boneyard', one of the largest resting places for retired liners in America. Some of the vintage craft laid to rest at the Mojave 'scrapper' include the ultra rare APSA 990, which first flew in 1962 for APSA Peru until it was reposed in 1973 and was narrowly escaped being 'crashed' for a FOX network TV special, and the TWA Constellation, perhaps the most beautiful commercial aircraft ever manufactured. 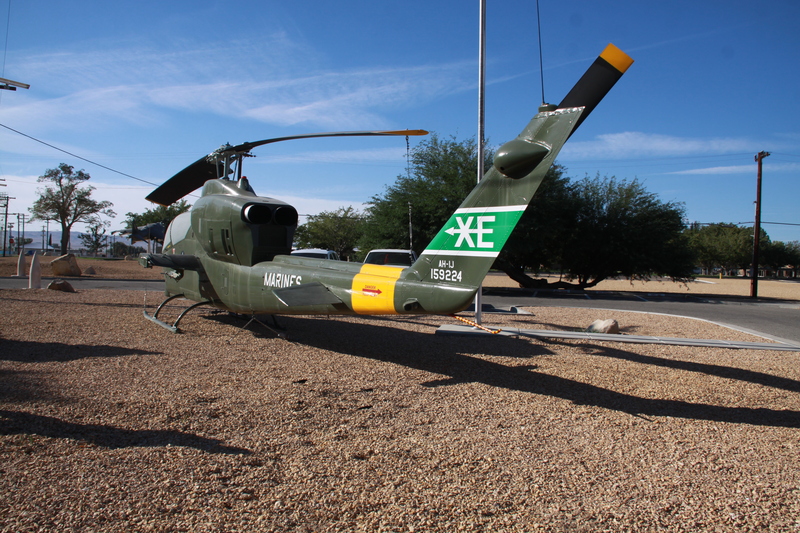 Tours of the airfield can sometimes be arranged — call 661 824 2433 for more information. There's all kinds of aircraft out here!! NASA Ames Research Center (ARC) is a NASA facility located at Moffett Federal Airfield, which covers 43 acres at the borders of the cities of Mountain View and Sunnyvale in California. 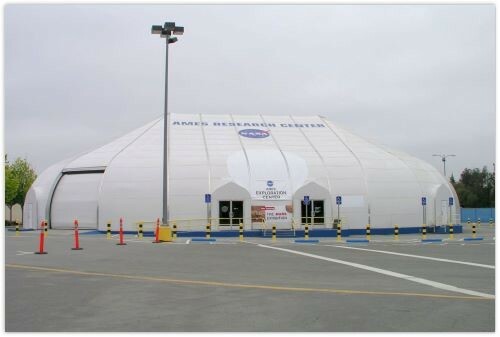 This research center is most commonly called NASA Ames. ARC was founded on December 20, 1939 as the second laboratory of the National Advisory Committee for Aeronautics (NACA), and moved to NASA in 1958. The Sunnyvale site at Moffett Field was selected in October 1939 by the Charles Lindbergh Committee established by an act of the U.S. Congress in August 1939. The Ames Aeronautical Laboratory (now the Ames Research Center) was named after Joseph Sweetman Ames a longtime (1919-1939) NACA chairman. ARC is active in aeronautical research, life sciences, space science, and technology research, especially information technology, including machine learning and artificial intelligence. The Center houses the world's largest wind tunnel, part of the National Full-Scale Aerodynamic Complex (NFAC). Although decommissioned by NASA in 2003, the NFAC is now being operated by the U. S. Air Force as a satellite facility of the Arnold Engineering Development Center (AEDC). The buildings at Moffett Field consist of those belonging to NASA proper, including the wind tunnels and other core research facilities, as well as an academic research park intended to foster collaborations with universities. Members of this Ames campus include Carnegie Mellon West, the University Affiliated Research Center (UARC) (administered by the University of California, Santa Cruz), the SJSU Metropolitan Technology Center (part of San Jose State University), and The Space Technology Center (STC) (managed by San Jose State University). 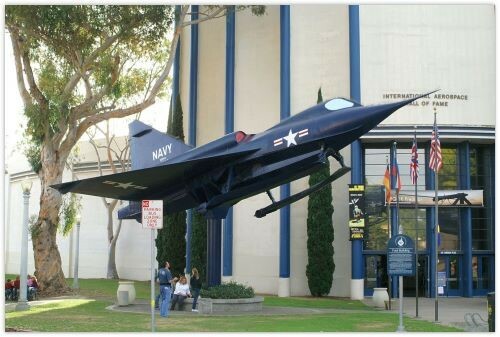 The Moffett Field Historical Society was founded in May of 1993, as the result of the community "Hail and Farewell" for the Navy as Moffett Field was closing. 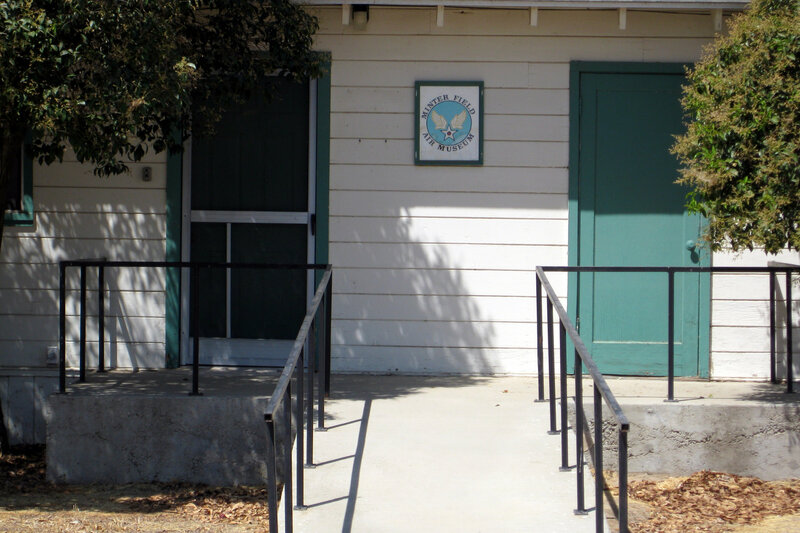 One year after the founding of the Historical Society, the Moffett Field Museum, a non-profit institution, was created. 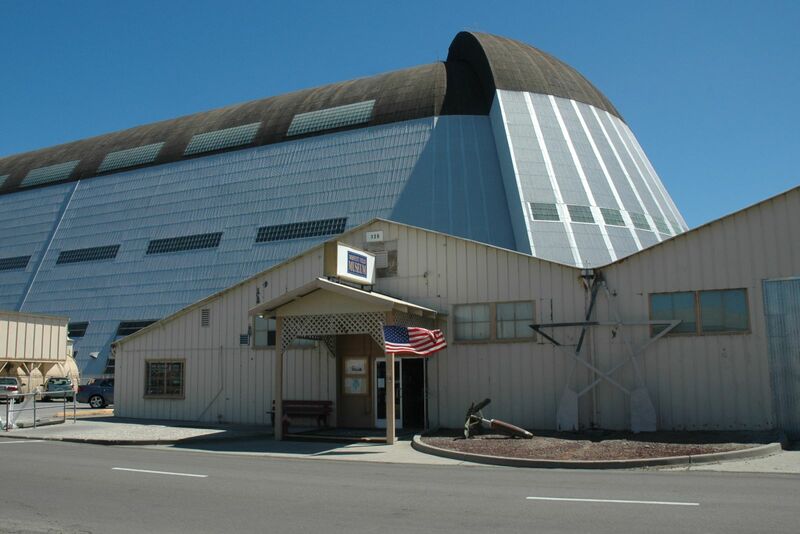 The Museum, managed and staffed by volunteers, was initially located inside Hangar One, which was built to house the dirigible USS Macon in 1934. 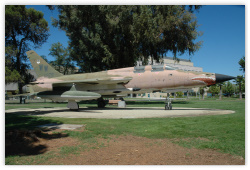 In 2002, Hangar One was closed to all personnel due to PCB contamination, and the Museum was relocated to an adjacent building. 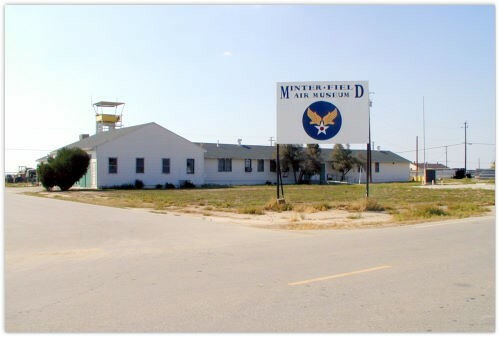 Moffett Field is located in the Sunnyvale-Mountain View area of the southern San Francisco bay, adjacent to Highway 101, approximately 10 miles north of San Jose. From Highway 101, take the Moffett Blvd. exit towards Moffett Field. Enter the main gate via the left-most lane. From this lane, the road dog-legs to the right at the parade ground, and becomes S. Akron Dr., a one-way street. Hangar One is directly in front of you as you pass Bldg. 17, the main administration building. Continue toward Hangar One until you reach Severyns Av., which is one block from the hangar. Turn right on Severyns Av. (a one-way street). Part way up this street, before you reach the stop sign, you will see the old water tower on the right, and the Moffett Museum on the left. Park in the lot just before the museum building, or across the street. 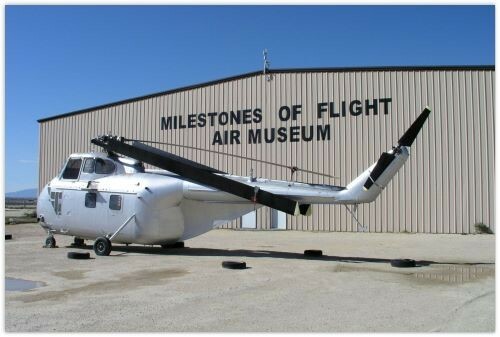 In 1982 a group of volunteers chartered an aviation museum that was to become known as the McClellan Aviation Museum. 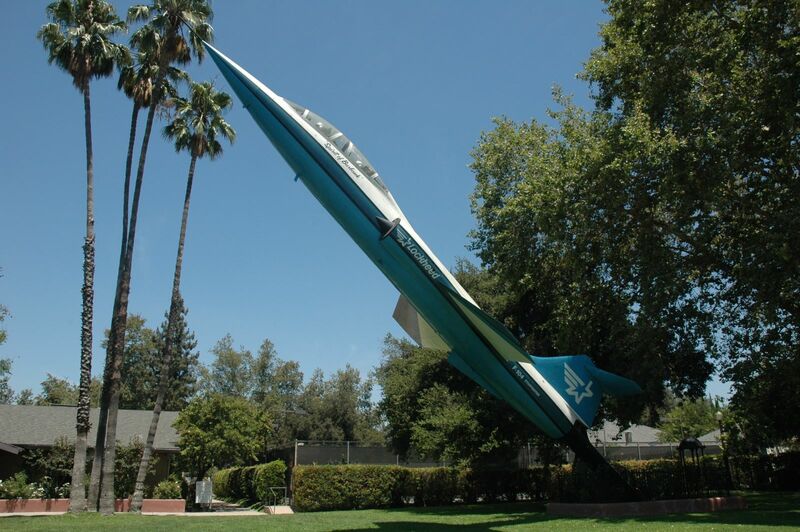 The Museum officially opened in 1986 and hosted over 500,000 visitors on McClellan AFB in Sacramento, CA. 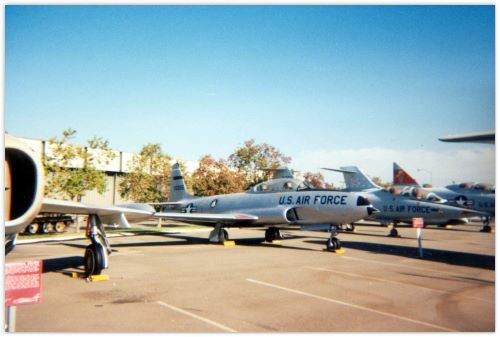 However, in 2001 McClellan AFB closed and another group of volunteers converted the Museum to a private foundation. 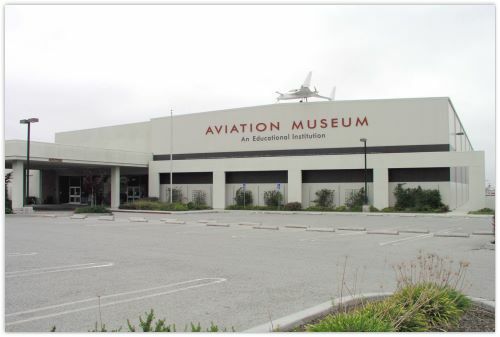 In November 2005, they completed the transformation of this historic aviation museum when they chartered the Aerospace Museum of California. Their mission is to carry on the heritage of aviation in California's Capital region by focusing the new museum on education and aerospace. The Museum has plans to a totally new museum and learning center complex that educates visitors and highlights the rich aviation heritage of the area. This heritage includes the contributions of aerospace industries to our country's space era, and recognizes the individual contributions of the women and men of the armed forces and the civilian work force that was critical for our nation's defense. 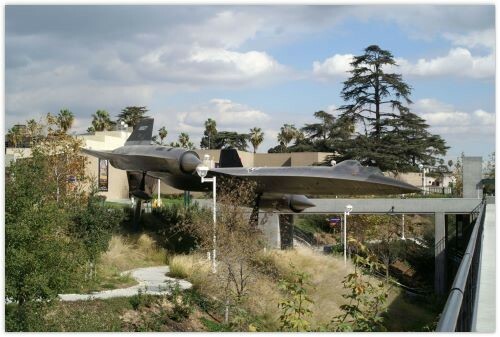 The new Aerospace Museum of California include: the Hardie Setzer Aerospace Pavilion, the Air Park, the Aerospace Learning Center, the Aviation Historic Center, and the McClellan Memorial Plaza. 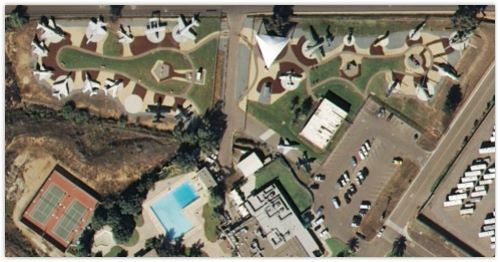 The planned opening date for the new Pavilion and Air Park is early 2007. Meanwhile as they build, the Air Park, the Gift Shop, and all the aircraft are still open. And, of course, you can view the aircraft and many of our engines on this web site. 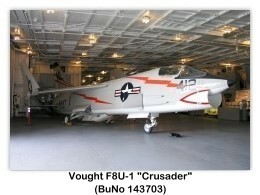 More aircraft will be added in mid 2006 as they a Douglas A-4 "Skyhawk", and a Grumman F-14 "Tomcat." North American F-86L "Dog Sabre"
Sikorsky CH-3E "Jolly Green Giant"
The Mission of the Commemorative Air Force is to Promote and Preserve in Flying Condition, the History and Esprit de Corps of Military Aviation. The Golden Gate Wing is the San Francisco bay area's chapter of the Commemorative Air Force and has more than 250 active members who meet regularly, maintain and fly Wing aircraft, and take part in air shows and educational events. 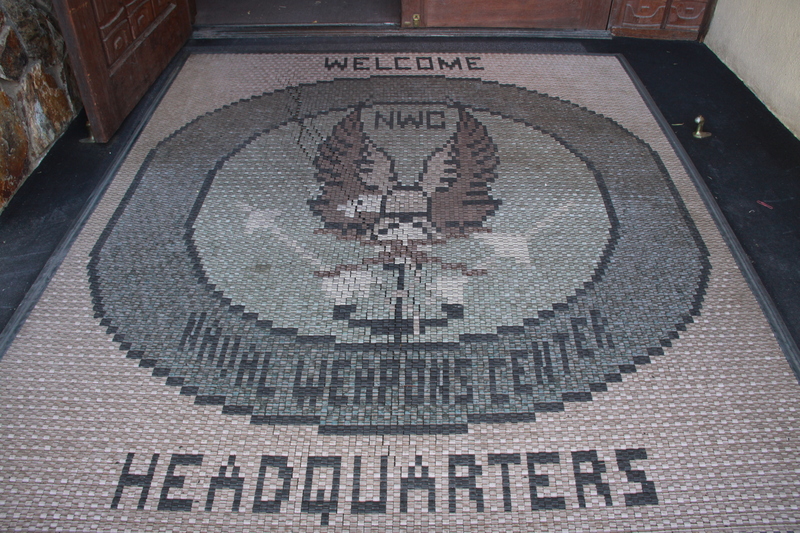 The Golden Gate Wing had its Bay Area roots in the CAF Pacific Wing in 1981. 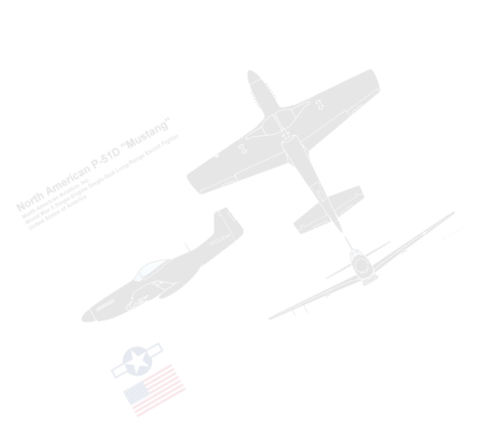 From that original organization came the core of today's Wing and the 1991 allocation by CAF headquarters of a North American SNJ-5 (aka AT-6 Texan). The Golden Gate Wing has hosted two major events at Oakland International Airport's North Field. We organized the 1991 air show honoring the Tuskegee Airmen, the African-American flying instructors and combat pilots of World War II, and 1995's Freedom Week, featuring the CAF's B-29 "Fifi" and B-24 "Diamond Lil". Both offered the general public an opportunity to see historic types of aircraft fly, and to meet pilots and crewmembers that flew those machines during the war. Selections from the museum's permanent collection include approximately 600 works in a variety of media, including paintings, sculptures, prints, photographs and decorative arts in the collection. The installation traces the development of artistic expression in California from the early 1800s to the present. Art Department, third level. 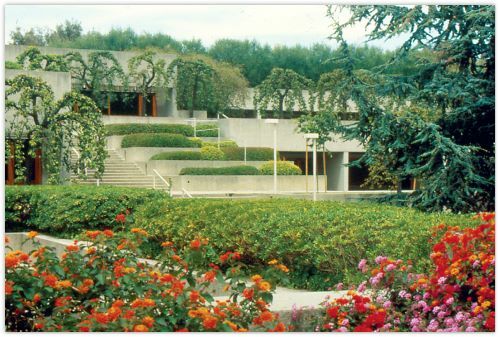 The Cowell Hall of California History displays the most extensive collection of material related to California's complex history. This permanent exhibit of more than 6,000 artifacts illustrates major events and trends that have shaped the state, from the pre-European-contact world of the region's native peoples to the complex, technological world of today. History Department, second level. The Hall of California Ecology takes the visitor on a simulated journey through California's diverse ecosystems, observing plants and animals found from the Pacific coastline to the High Sierra and the inland desert. Exhibits contain approximately 2,500 natural specimens organized around basic ecological principles highlighting relationships among plants, animals, geology and climate. The Aquatic California Gallery presents an overview of our aquatic environments, including the oceans, rivers and streams and estuaries. Natural Sciences Department, first level. The Oakland Museum of California is located in downtown Oakland, one block from the Lake Merritt BART station and a few blocks from highway 880. Parking is available in their underground garage, or you can park in the lot located at the Kaiser Events Center next to the museum on 10th Street. The Museum is reported to have a 1919 Meteor on display. To date we have not be able to confirm this. We need a high resolution photo, make/model, etc. of the aircraft at this location. Your help would be appreciated. 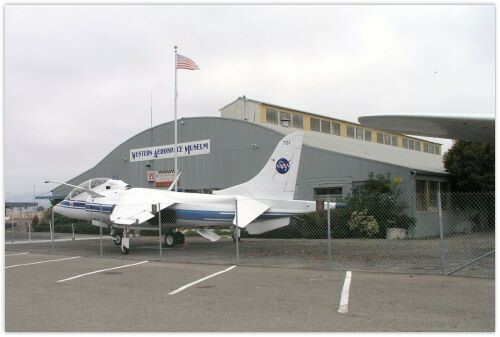 Founded in 1980, the Oakland Western Aerospace Museum is a nonprofit organization on Oakland International Airport's historic North Field, just 10 minutes south of downtown Oakland, California. Today, Oakland's Western Aerospace Museum is set among majestic Art Deco buildings heralding the days of Charles Lindbergh and Amelia Earhart in a restored historic airplane hanger. 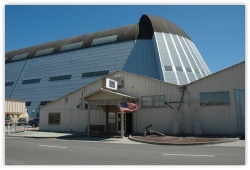 In 1986 the doors opened Western Aerospace Museum to the public in a single room in hanger five, an original 1929-vintage hanger of the Boeing School of Aeronautics at Oakland International's North Field. "Hangar five still exists. It's located on Earhart Road and currently houses offices on the street-side of the building and Kaiser Air aircraft parking on the air-side. The Museum was initially located in one large room upstairs and later in a large room downstairs. 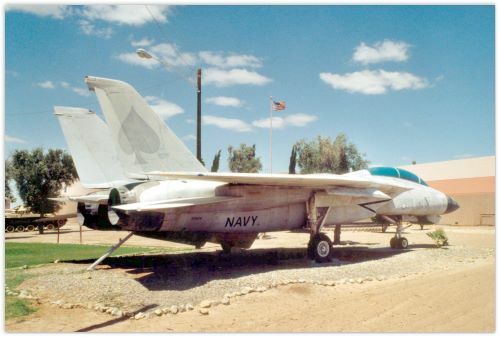 In November 1988, the Museum was relocated to its present location, Building 62, built in 1940 by the Boeing School of Aeronautics to train aviation mechanics for the US Army Air Corps and US Navy. The hangar, provided by the Port of Oakland, has undergone a significant transformation with the help of private and corporate funding and the dedicated work of hundreds of volunteers. 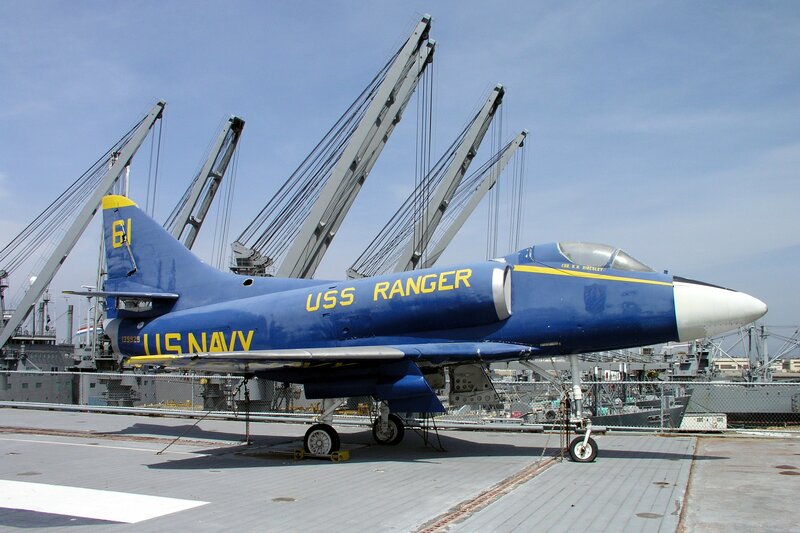 Over the years the Port of Oakland has allocated additional space to the museum, most recently, in 2003, a strip of land to the eastern edge of the ramp and the rear section of the hangar. In addition to the 100,000+ square feet of indoor and outdoor exhibition areas, today's facilities include an auditorium, restoration shop, gift shop, and a 5000+ book library. 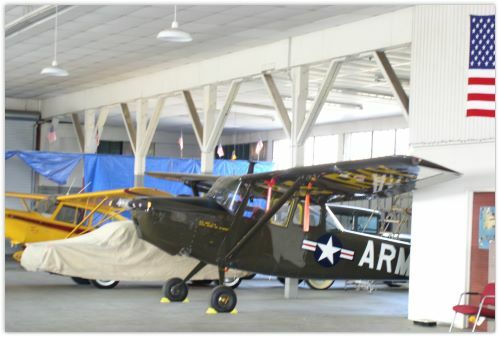 The museum's restored-hangar home, and surrounding ramp area, now house more than 30 vintage and modern airplanes -- both civilian and military -- and other displays that highlight noted aviators and innovators. Display areas include Early Pioneers in Aviation, Women in Aviation, WWI, WWII, Airlines, Engines, Simulators, Model Airplanes, and Space. All displays have been gifted or are on loan by individuals interested in preserving aviation history for the education of future generations. 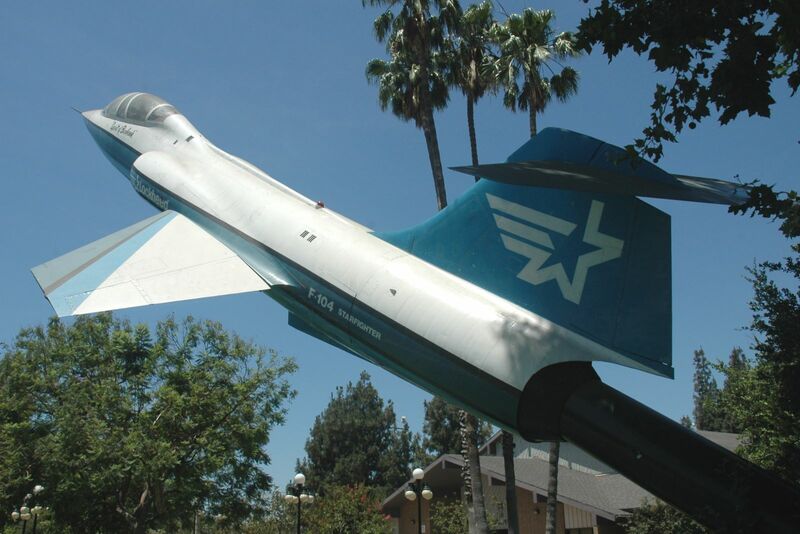 Members and volunteers who share a common interest in aviation history maintain the exhibits. 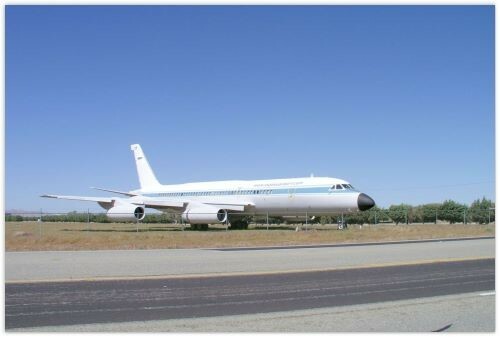 The Blackbird Airpark opened in November 1991. It is the world's only display of a Lockheed SR-71A together with its Blackbird predecessor, the A-12, and the once ultra-secret D-21 drone. 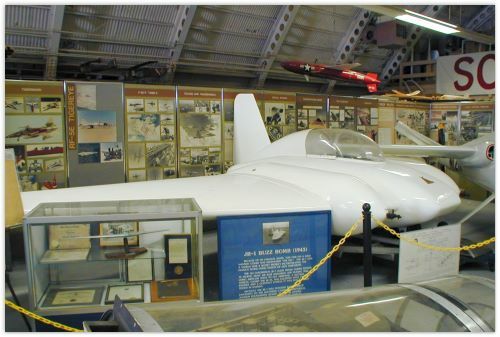 A U-2D was added to the display in November 2001. 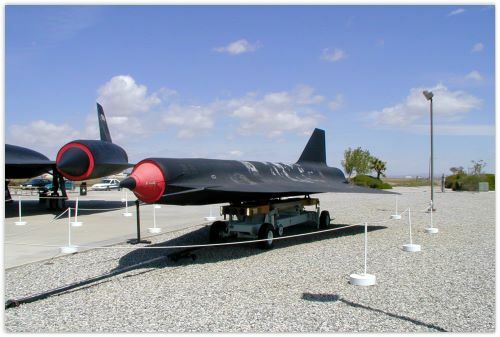 The airpark was established to preserve the proud heritage of the entire Blackbird family and, through the restoration, preservation, and display of these unique aircraft, provide the visiting public with an interesting and educational experience. 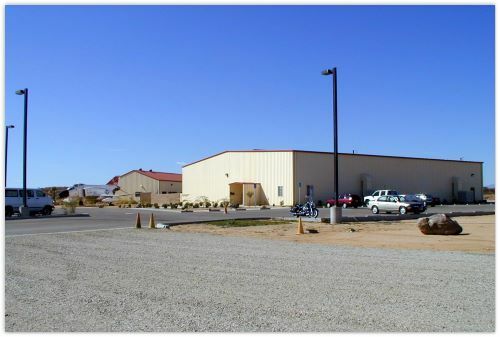 The High Desert Contractors Association managed construction of the airpark. 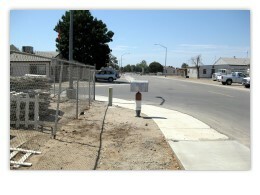 Association members, other businesses, private parties, and suppliers in the Southern California area donated most of the labor and materials. 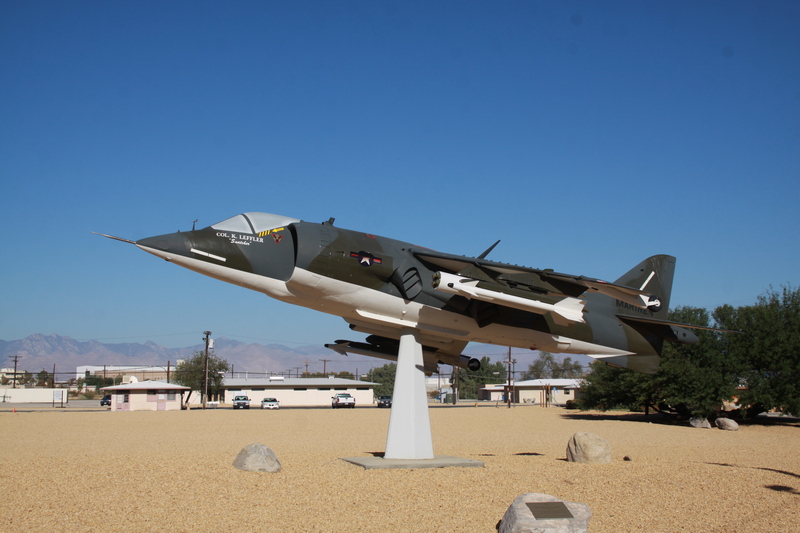 The Flight Test Historical Foundation, a nonprofit organization, is raising funds for improvements to the airpark, and the Air Force Flight Test Center (AFFTC) Museum at Edwards AFB is responsible for the airpark's day-to-day management. The aircraft on display, A-12 #60-6924, SR-71A #64-17973, and U-2D #56-6721, are USAF historical property and are on loan (the A-12 and U-2 to the AFFTC Museum and the SR-71A to Det 1, Aeronautical Systems Center, at Plant 42) for display at the Blackbird Airpark. The A-12 on display is Blackbird number one and first flew on 26 April 1962. 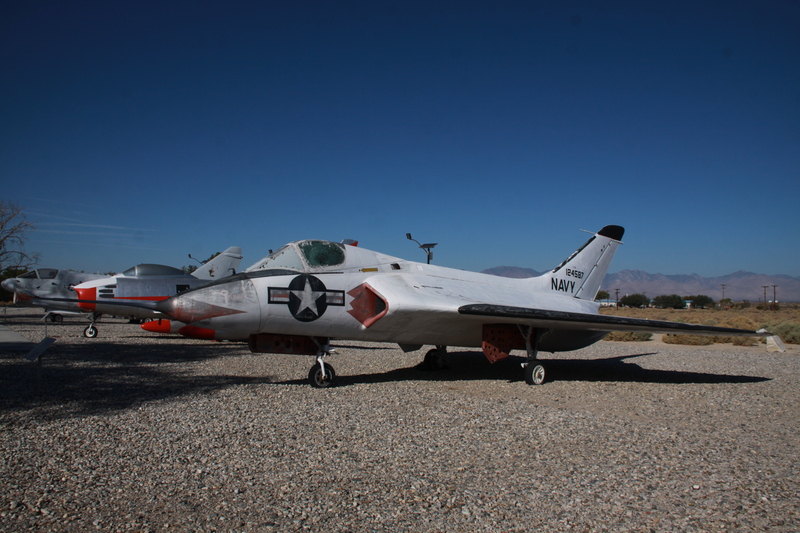 It was used as a flight test vehicle throughout its career. The SR-71A on display was delivered to the Strategic Air Command in 1968 and performed operational missions with the 9th Strategic Reconnaissance Wing at Beale AFB, California until 1987 when it was retired due to structural damage. 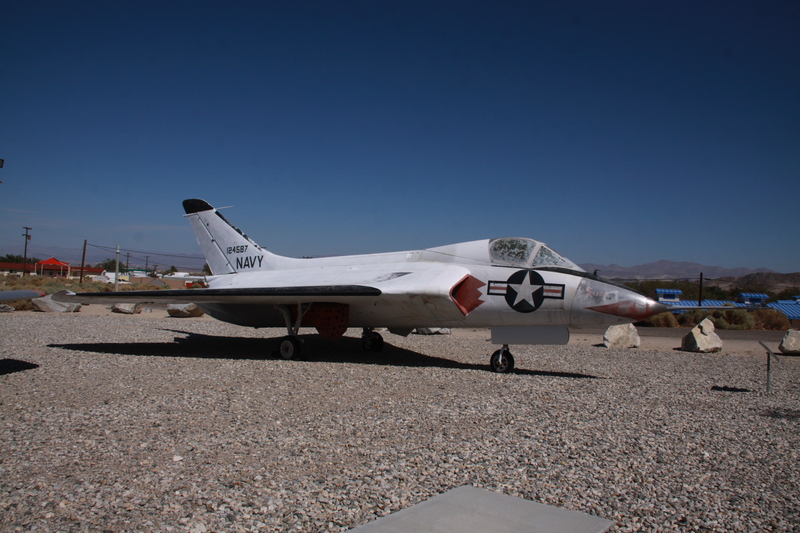 The U-2D operated out of Edwards AFB with the 6512th Test Group for and was previously on display at March AFB from 1981 to 1996 before being placed on display in the airpark. 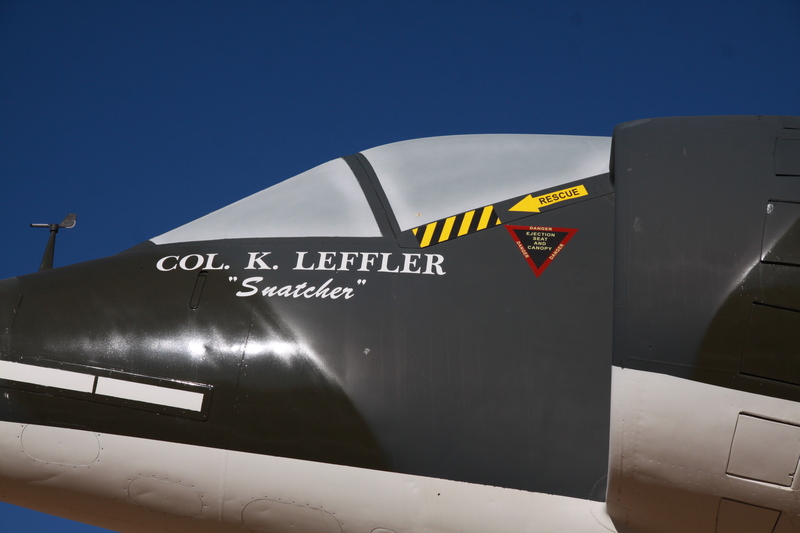 All three aircraft were repainted courtesy of Lockheed's Skunk Works. The D-21 drone is on loan from NASA and was refurbished by airpark volunteers. 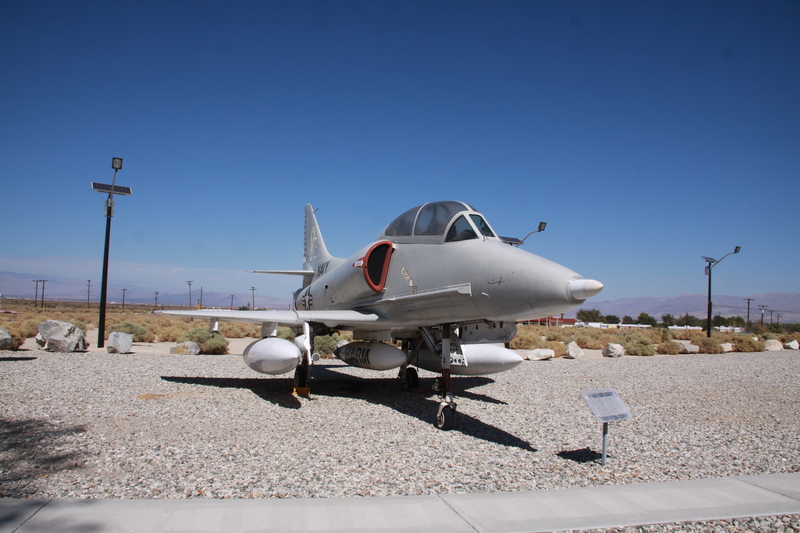 The three-acre airpark is located on the Air Force's Production Flight Test Installation at Plant 42 in Palmdale, California. The airpark's "Blackbird Heritage Courtyard" is being paved with name-engraved bricks that can be purchased by the general public. The courtyard is enclosed by a wall where Blackbird designers, record-setters, and other program participants-and Blackbird Airpark contributors-will eventually be recognized. The airpark is manned by AFFTC Museum volunteers and is open Friday through Sunday (weather permitting), from 11:00 a.m. to 4:00 p.m. It is closed on Federal holidays. Admission is free. 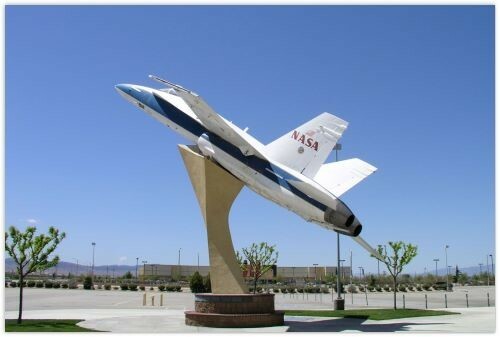 The Joe Davies Heritage Airpark at Palmdale Plant 42 was dedicated at a ground breaking ceremony on October 20, 1998. 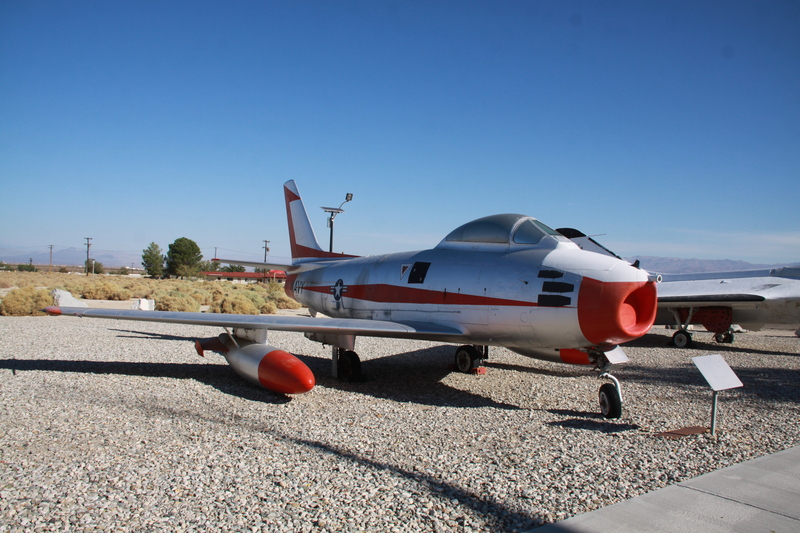 Located between 20th Street East and 25th Street East on Avenue P in Palmdale, this 26.4-acre Airpark celebrates the rich aerospace heritage of Palmdale. Visitors to the Joe Davies Heritage Airpark at Palmdale Plant 42 may view a collection of aircraft flown,tested, designed, produced or modified at United States Air Force Plant 42 in Palmdale. The first five-acre phase of the Airpark includes 12 planes on display plus a scale model of the B-2 Spirit and a full-size U-2 horizontal stabilizer and engine. Additionally, a C-46 is currently being restored. Over 40 different aircraft may be on display when the park is fully built out. The Airpark exists primarily because of volunteer support along with aircraft and material donations. When a plane is donated, Airpark volunteers disassemble the craft, transport it to the Airpark, and then restore it piece-by-piece before reassembling it for display. Most of the restoration work is currently done in a 3,500-square-foot restoration shop donated by Lockheed Martin Aeronautics Company. A second building measuring 15,750 square feet will eventually be used to house aerospace memorabilia exhibits. A future 5,000-square-foot visitors center will be built to house private donations accumulated by the City as well as a snack bar and gift shop. 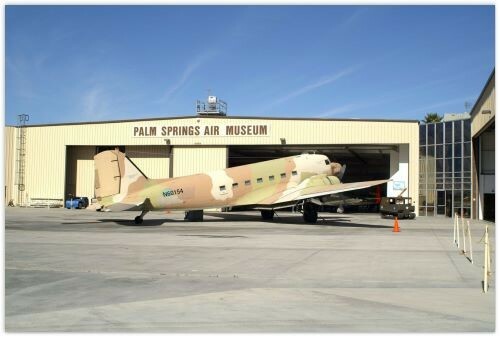 The Palm Springs Air Museum, is a non-profit educational institution, whose mission is to exhibit, educate and eternalize the role of the World War II combat aircraft and the role the pilots and American citizens had in achieving this great victory. 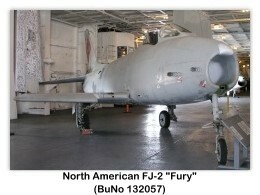 In addition to flying aircraft, related artifacts, artwork, and library sources are used to perpetuate American history. The significance of World War Two is unparalleled in all of the history of the world in that it was the greatest, most costly conflict ever fought, taking the lives of more than 70 million people. It was Air Power that altered the outcome of that war and forever changed the lives of every person alive today. General Dynamics F-16N "Fighting Falcon"
JPL is a NASA center staffed and managed for the government by a leading private university, Caltech -- and thus we are known as a federally funded research and development center. I believe that this marriage of the government and university worlds lends us a wonderful intellectual infusion to drive our exploration efforts. Caltech anchors us in the world of excellence and academic curiosity, while NASA gives us the opportunity to reach for the stars. Venturing into the unknown is not always easy. But as Teddy Roosevelt once said, "Far better it is to dare mighty things, to win glorious triumphs, even though checkered by failure, than to rank with those poor spirits who neither enjoy much nor suffer much, because they live in that grey twilight that knows neither victory nor defeat." The JPL Public Services Office offers tours free of charge for groups and individuals on an advance reservation basis. You must speak with a Public Services Office representative well in advance in order to reserve a tour. Reservations may not be made via e-mail, voice mail or fax. We offer Visitor Day tours for individuals and families (up to nine persons) several times per month. These tours run approximately once per week on Monday or Wednesday on an alternating basis. Visitor Day Tours are generally held at 1:00 p.m.
Tours for groups of 10 or more, with a maximum of 40 persons, are available throughout the week and are booked by an initial telephone call to make a tentative reservation. Morning and afternoon group tours are offered Monday through Friday. Please call for available times and dates. Groups must provide a confirmation letter within 10 working days of initial phone call, as well as a final roster of all participants at least one month before the day of the tour. Persons not on the roster arriving the day of the tour will not be admitted. 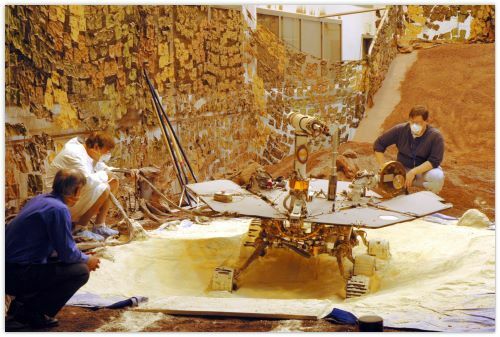 All tours are 2-2.5 hours in duration and commonly include a multi-media presentation on JPL entitled "Spirit of Exploration ," which provides an overview of the Laboratory's activities and accomplishments. Guests may also visit the von Karman Visitor Center, the Space Flight Operations Facility, and the In-Situ Instruments Laboratory. JPL requires that all U.S. citizens, 18 years of age or older, present official, government issued photo identification (driver's license or passport) before being allowed entry. All non-U.S. Citizens 18 years of age or older must present a passport or resident visa (green card) before being allowed entry. Individuals without proper identification will not be admitted to the Laboratory. Please be advised that tours involve a considerable amount of walking and stair climbing. 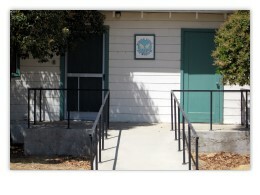 Wheelchair access can be accommodated with advance notice, however wheelchairs cannot be provided. Don't forget to dress for the weather the tour will proceed rain or shine! Adopting a name to memorialize the World War II Estrella Army Air Force Base that is now Paso Robles Municipal Airport, the Museum was chartered as a not-for-profit California corporation in 1995, and 501(c.3) accreditation soon followed to establish us with the US Departments of Navy and Air Force, as well as the state of California, as an organization approved to receive surplus aircraft and other government properties. 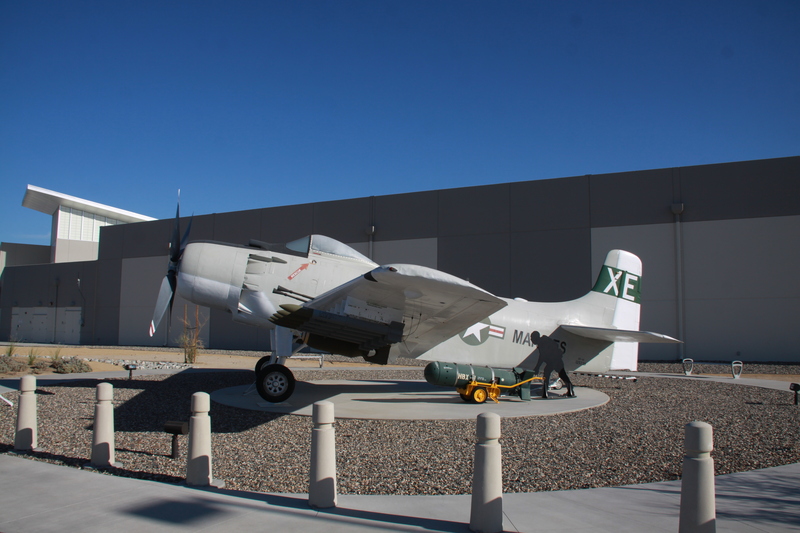 A most ambitious plan took wing about 15 years ago as the Estrella Warbirds Museum, in which the primary goal would be to preserve, perpetuate, and display American aviation history, especially that of our nation's military services. The NAWC Pt. 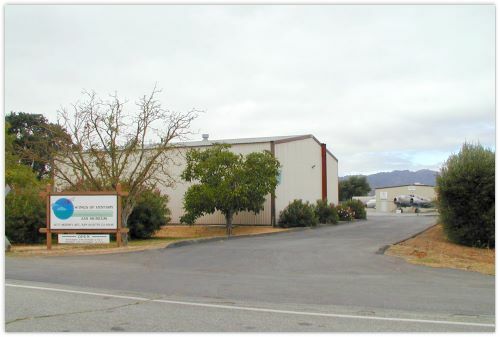 Mugu Airpark is located at the intersection of Pacific Avenue and SR1 just outside NAWC Pt. Mugu. 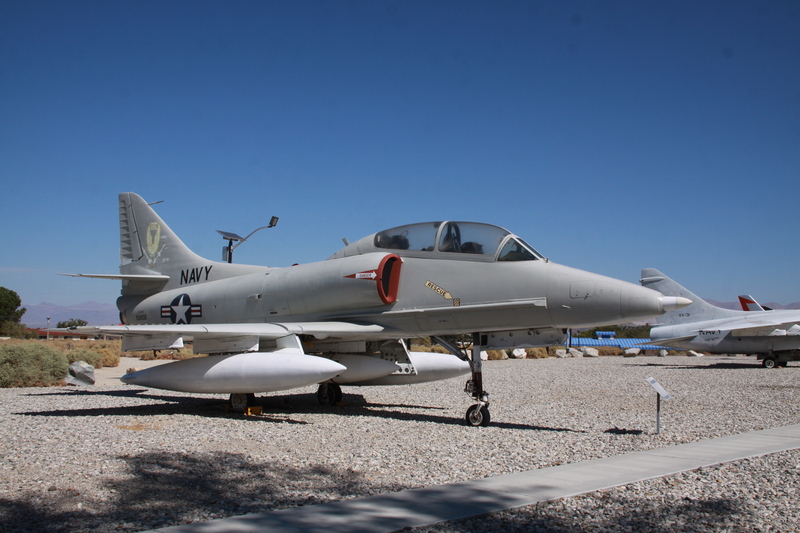 The Airpark features numerous missiles and aircraft that the Navy used and tested at Pt. Mugu. The weapons on display span the timeframe from the close of World War II to the present. This is a must stop if you're driving along the Pacific Coast Highway (SR1). McDonnell Douglas F-4S "Phantom II"
The 146th is one of only four C-130 units whose contribution to our nation's aerial fire fighting capability includes equipment and techniques for efficient, effective suppression of large wild land fires from the air. 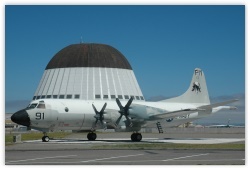 Since 1974, using the Modular Airborne Fire Fighting System (MAFFS) units supplied by the U.S. Forest Service and mounted in four C-130s, the wing's aerial fire fighting crews have been credited with saving many lives and countless millions of dollars worth of structures, forests, and brush land in California, and many other States and countries as well. 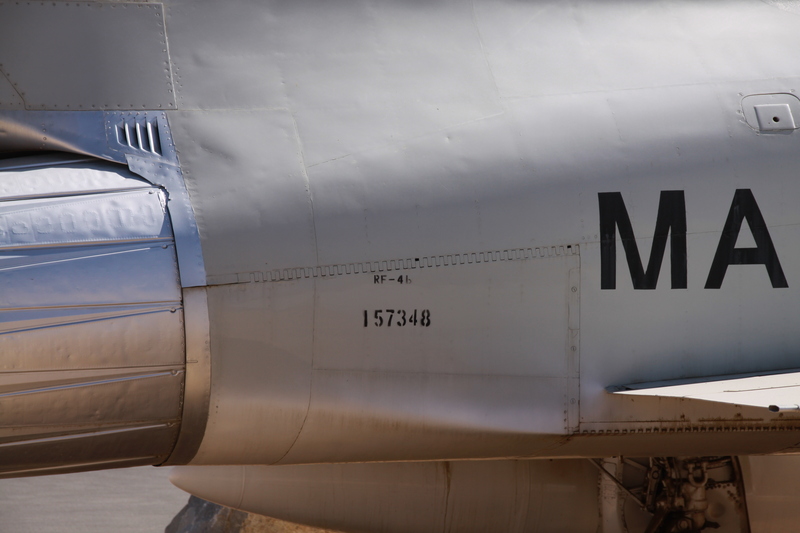 During a particularly difficult fire season around the Mediterranean Sea, the Italian government requested and received MAFFS-equipped aircraft, crews, and support personnel from the 146th. For several weeks, our aircraft and crews fought fires in Italy and Sardinia, while training local fire fighters in MAFFS techniques, and earning the respect and admiration of many European aerial fire fighters. The fire seasons of 1993 and 1994 were the worst on record. The Malibu fires of 1993 literally burned to the edge of our base. But it was in 1994, with over 55,000 wildfires raging throughout the western States, that the 146th, along with three other MAFFS-equipped guard and reserve units flew nearly 2,000 missions, dropping fifty-one million pounds of fire retardant. 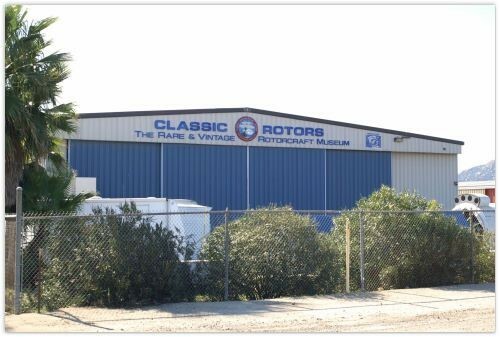 Classic Rotors is a California based, non-profit organization dedicated to the preservation of historic helicopters and vintage rotorcraft. 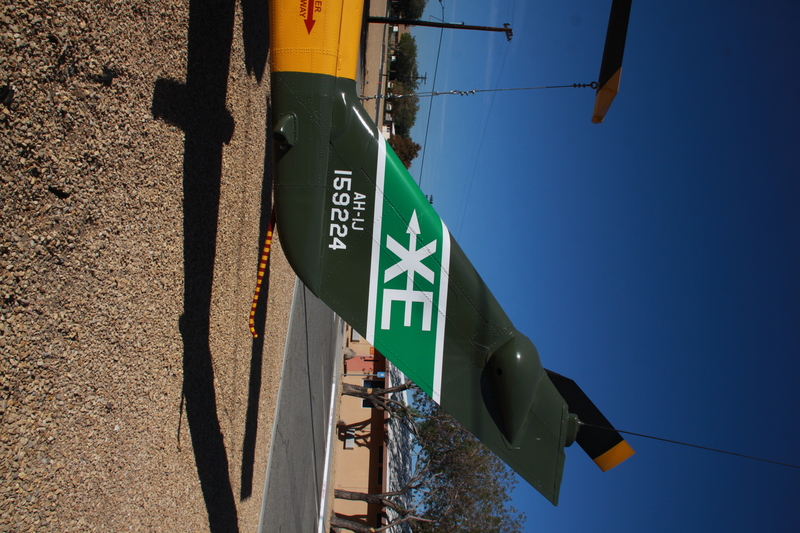 During the past year we have grown to have the worlds largest collection of airworthy historic helicopters. With the support of many volunteers and donations, Classic Rotors now has over 42 rotorcraft and attends more than a dozen air shows each year. 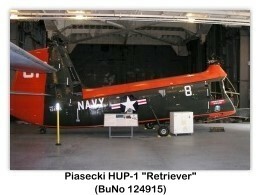 1952 Piasecki H-25 / HUP-1 "Retriever"
The Commemorative Air Force (CAF) is an all-volunteer organization, made up of members from all walks of life. Membership is open to all men and women, age 18 or older. You need not be a veteran nor a pilot to join the CAF. Privately funded and totally self-supporting, the nonprofit, tax-exempt group is dedicated to preserving the military aviation heritage of World War II. 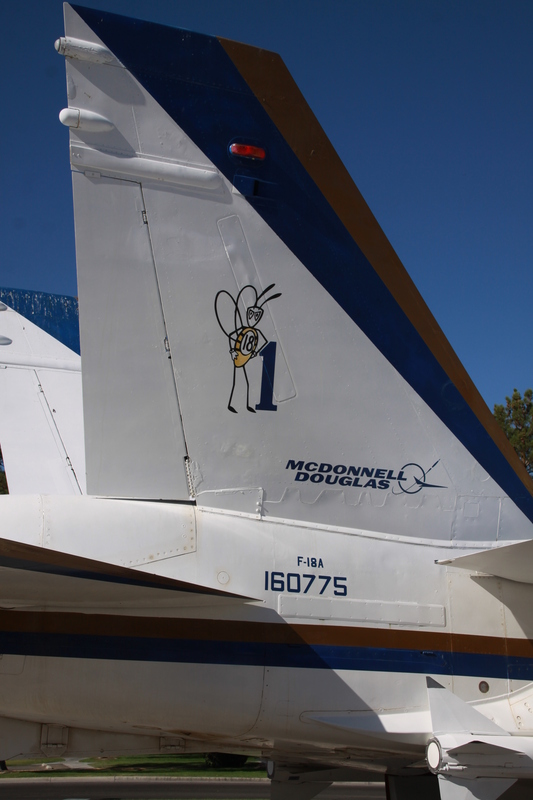 Our motto is "Keep 'Em Flying!" The Inland Empire Wing is based at the Riverside Municipal Airport, located in Riverside, California. 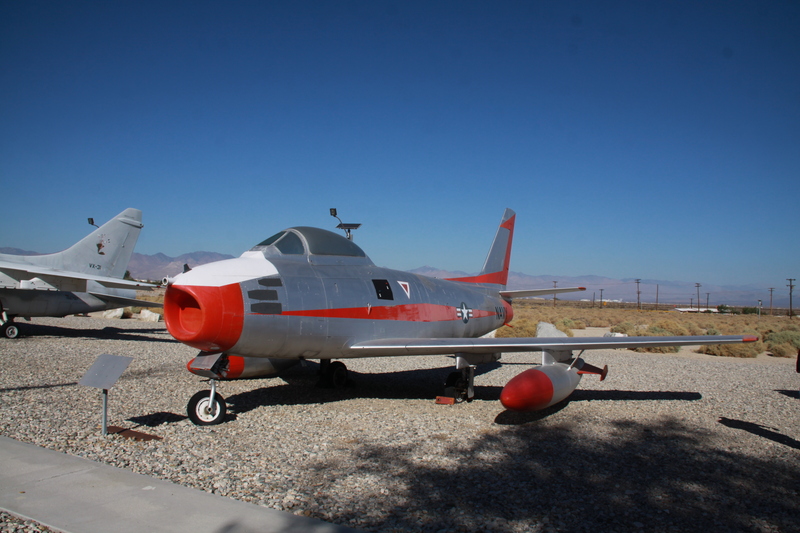 This one-of-a-kind Aviation Museum was developed by a dedicated curatorial staff, with the help of many volunteers. 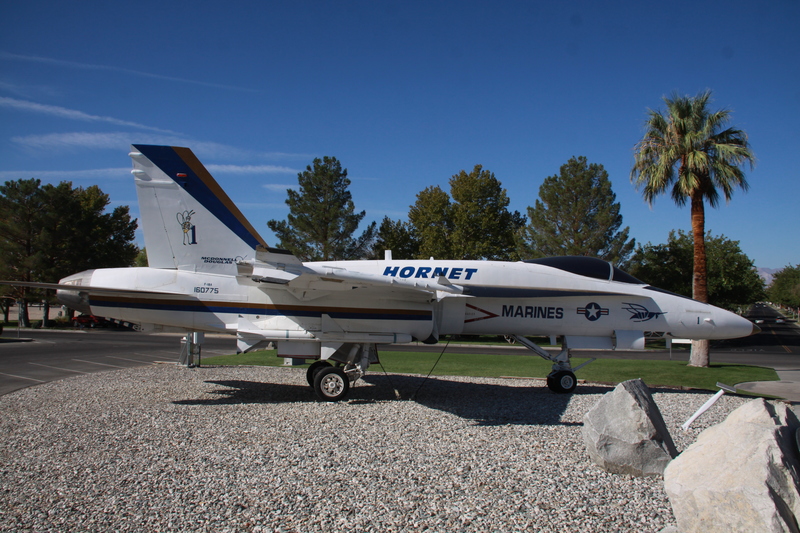 What sets this museum apart from all others is the fact that it is the only museum in the World dedicated to preserving the incredible contributions made by Marine Corps Aviators and their ground support personnel. 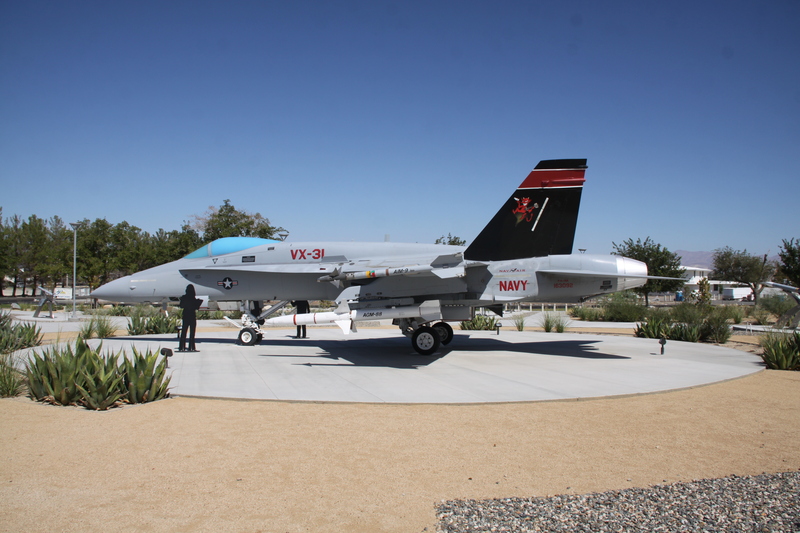 The museum is comprised of an outdoor area, displaying an average of at least twenty five vintage aircraft and an indoor display of memorabilia and artifacts dating to the earliest days of Marine Corps Aviation. Many items are one of a kind and range from fine art portraits to military clothing and weapons used during specific campaigns. The museum holds the only exhibit in the United States devoted to the history of the Woman Marine, including original uniforms, history timeline and memorabilia. The museum also displays the permanent trophies and the current year recipients of twenty five individual and unit awards, selected by the Commandant of the Marine Corps for excellence in their occupational speciality. The museum is open Tuesday through Sunday, 9:00 AM to 3:30 PM and at other times by special arrangement. McDonnell Douglas RF-4B "Phantom II"
North American FJ-3 "Fury II"
The USS Midway Museum (CV-41) is a maritime museum located in downtown San Diego, California at Navy Pier. 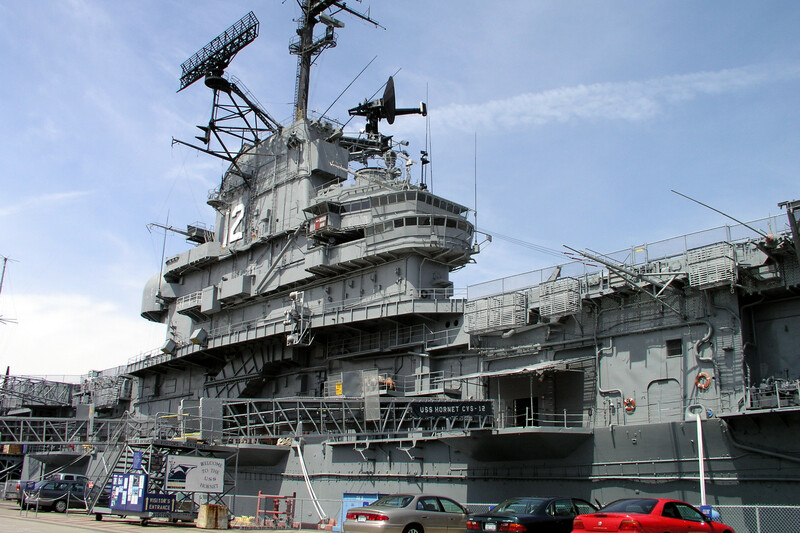 The museum consists of the aircraft carrier USS Midway (CV-41). 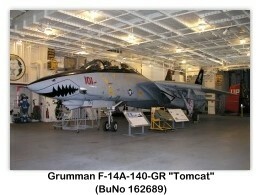 The ship houses an extensive collection of aircraft, many of which were built in Southern California. 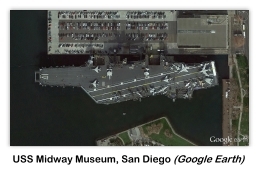 The USS Midway (CV-41) was America's longest-serving aircraft carrier of the 20th century, from 1945 to 1992. Approximately 200,000 sailors served aboard the carrier, known for several naval aviation breakthroughs as well as several humanitarian missions. It was the only carrier to serve the entire length of the Cold War and beyond. It is now berthed in San Diego, the birthplace of naval aviation and the original home of the Navy's TOPGUN fighter school. 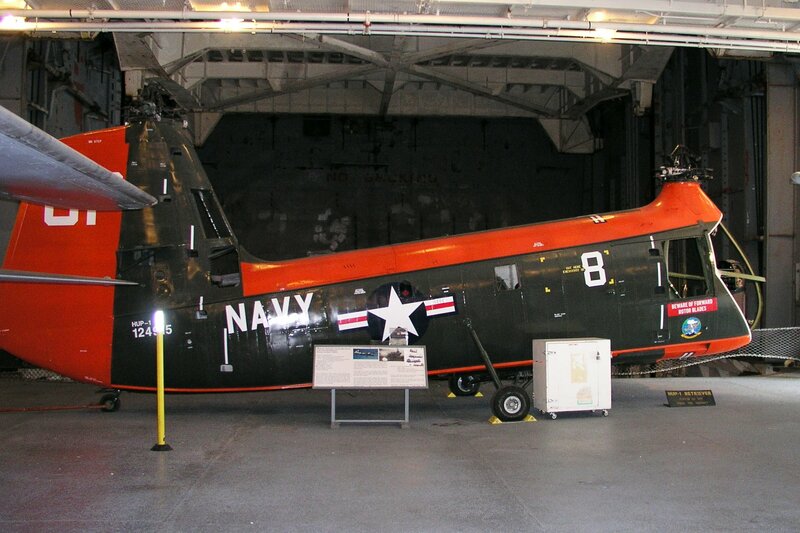 USS Midway (CV-41) opened as a museum on 7 June 2004. By 2012 annual visitation exceeded 1 million visitors. It became the most visited floating naval ship museum in the world. The museum has over 13,000 members, and hosts more than 700 events a year, including more than 400 active-duty Navy retirements, re-enlistments, and changes of command. The museum also hosts approximately 50,000 students on field trips and 5,000 children in its overnight program annually. Admission includes a self-guided audio tour, narrated by former Midway sailors to more than 60 locations, including sleeping quarters, engine room, galley, bridge, brig, post office, pilots' ready rooms, officers quarters, primary flight control, and “officers country”. Other features include climb-aboard aircraft and cockpits, videos, flight simulators, and a narrated audio tour for youngsters. 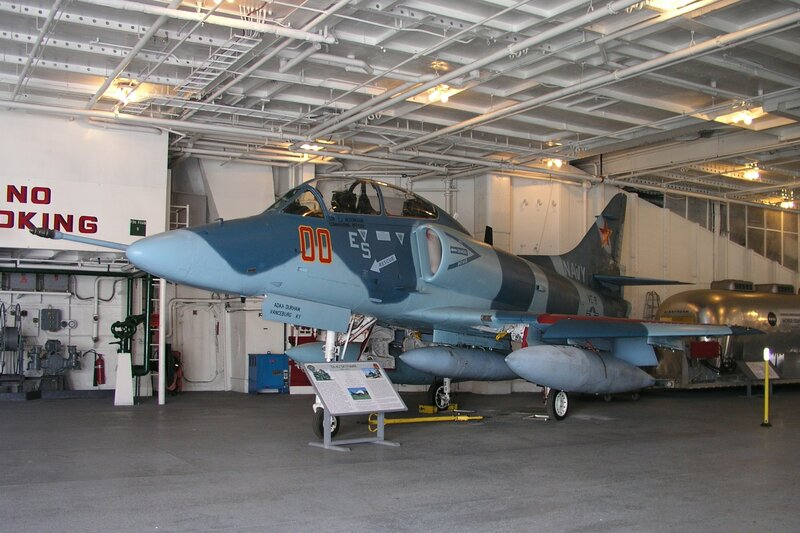 As of 2 June 2015, the USS Midway Museum has the following aircraft on display or under restoration. 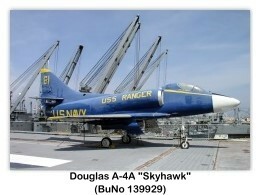 This is the San Diego Flight Museum, a collection of living, breathing, howling Warbirds. They maintain and fly these historic aircraft on a regular basis. 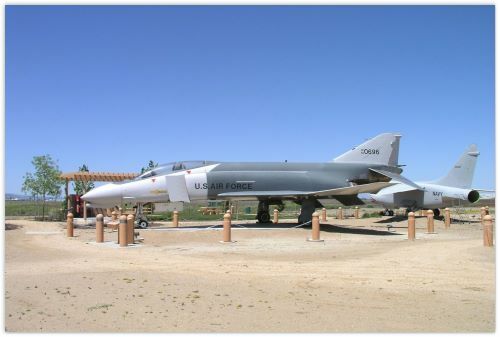 The museum is located on historic Brown Field, about 10 miles South of San Diego and 1 mile North of the Mexican border. 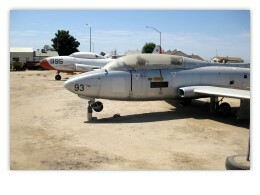 The collection is housed in three large hangars directly in front of the Terminal/Restaurant/Old control tower complex. The collection grows on weekends or holidays when members fly their personal Warbirds in for Museum events. 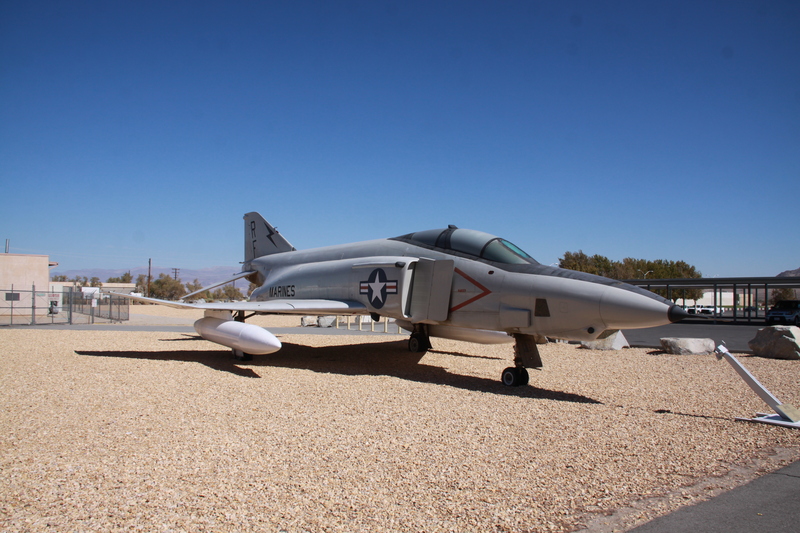 Their aircraft are all two place with dual controls and allow museum members to fly Backseat on local flights or to the occasional Southern California air-show. The Museum does not sell rides. Members pay yearly dues and participate in maintaining the aircraft, hangars, library and wait for an open Backseat. The Museum is presently located on a temporary basis in Pier One, Fort Mason, San Francisco. Open working weekends are held on the first & third Saturdays of each month. Contact the museum for more information. The CFAM is a 501(c)(3) non profit organization dedicated to preserving and interpreting the long and rich history of aviation at Crissy Field. 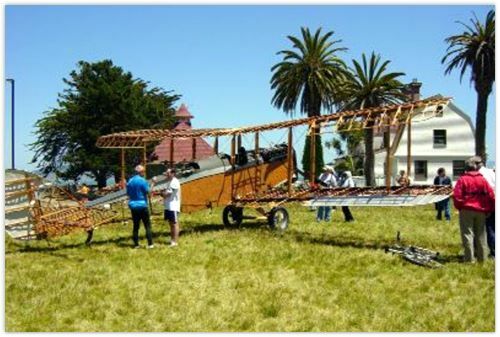 Our business history The Crissy Field Aviation Museum Association was incorporated in 1998 by Don Gray and Chris Rimer as a non-profit organization solely dedicated to preserving the WWI / pre-WWII history of Crissy Field. The Association is working to establish a "living museum" at the west end of Crissy Field in San Francisco's Presidio. 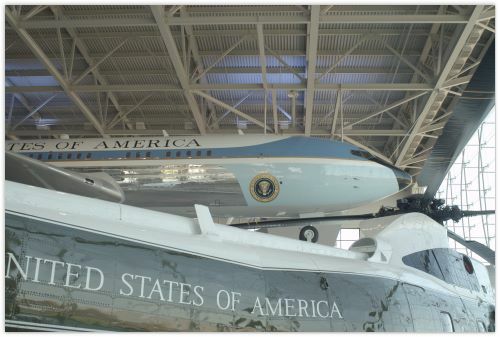 The museum will comprise the one-time airfield facility on Crissy Field, and is expected to become a major attraction within the Presidio & Golden Gate National Recreation Area. Every First Sunday of the month, please come out to visit our Museum! Local aviation history comes alive on First Sundays. 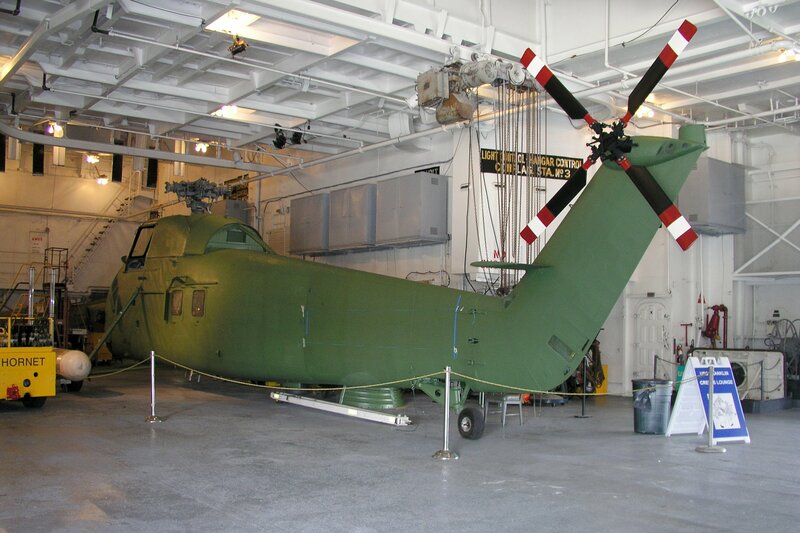 Our Chain of Hangars are open for you to explore from 10 am until 3 pm. Hangar Number One is the first in our chain of hangars. It tells the story of the founding of Santa Paula Airport in 1930, and that's just the beginning of the adventure. Each of these privately owned hangars in our Chain houses a variety of vintage aircraft and privately owned collections of various types of memorabilia from antique radios to race cars. Several other aircraft owners put their antique aircraft on static display and many vintage aircraft also fly in each month. Car Clubs also frequently grace our taxiways on First Sundays. Our Museum Tram is available to save you some steps between hangars. The Experimental Aircraft Association Chapter 723 offers free airplane rides to kids ages 7-17. The Museum's Gift Hangar, located inside CP Aviation, offers a wonderful variety of toys and apparel for the airplane buffs of all ages. Every First Sunday is a little different, but our First Sunday Open House is always free to the public. Cancel if rain. "To educate the public of all ages in aviation and its history, both in general, and as it relates to Santa Paula, and to inspire, motivate and challenge the younger generation to carry on the dreams of our aviation pioneers." 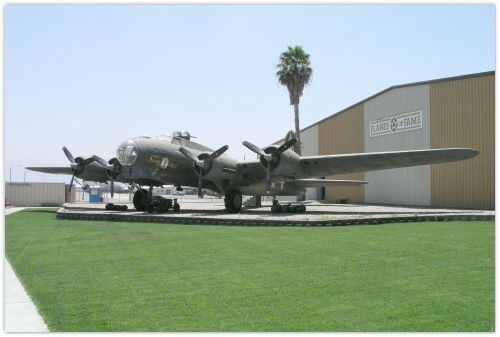 Hangar One: Visit our exhibit that explains the origin of Santa Paula Airport. Watch a video made from film that was taken during Opening Day ceremonies. Peer into the past into a diorama of the original airport. 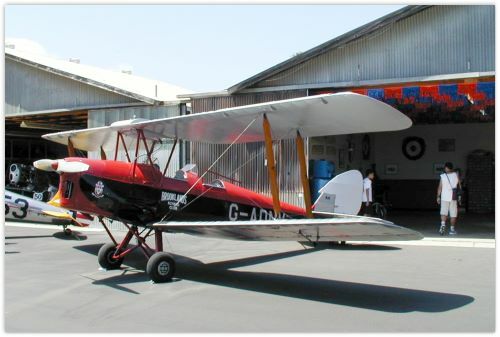 Watson Hangar: Home of our Tiger Moth and Gipsy Moth. Quinn Hangar: Photo Gallery of retired helicopter pilot Pat Quinn, and a beautiful Bucker aircraft. Richards Hangar: Home of one of the Ryan aircraft. Donalson Hangar (aka the "Radio Hangar"): See over 200 restored antique radios, antique televisions, jukeboxes, and photos from Dale Donalson's Aerobatic Competitions. McWilliams Hangar: A Czechoslovakian Zlin aircraft is the primary feature of this elegant hangar. Dewey Hangar: The Dewey family has been on this airport for generations, and this hangar features lots of Dewey family aviation memorabilia, including photos of many of Mike's stunt flying, in a 1950's style setting, along with midget race cars. Pridmore Hangar: Home of CLASS Racing, this hangar features extraordinary aviation art, motorcycles, and much, much more. The Gift Hangar: Gifts and souvenirs for aviation-minded folks. Located in the CP Aviation maintenance hangar, only on First Sundays. 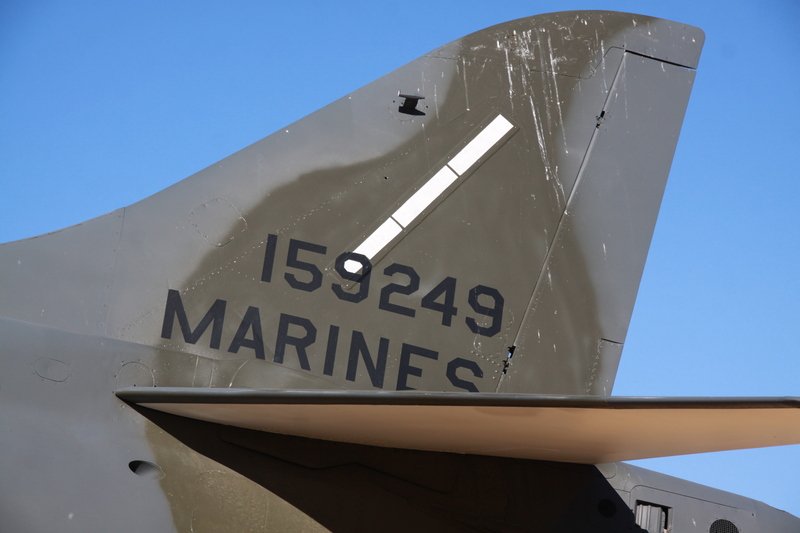 Ron Strong recently went out to the old George AFB to get photo's of the McDonnell Douglas F-4C Phantom II (s/n #63-7519) display aircraft and found out the aircraft has be removed. 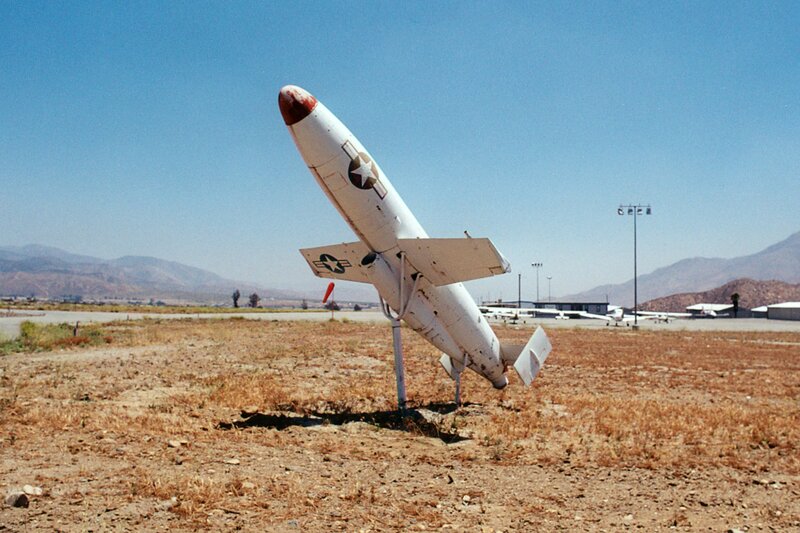 The only thing left was the pad were the aircraft was on display. He also found out that there is going to be a demo of old base Building. Does anyone know the current status of this aircraft?